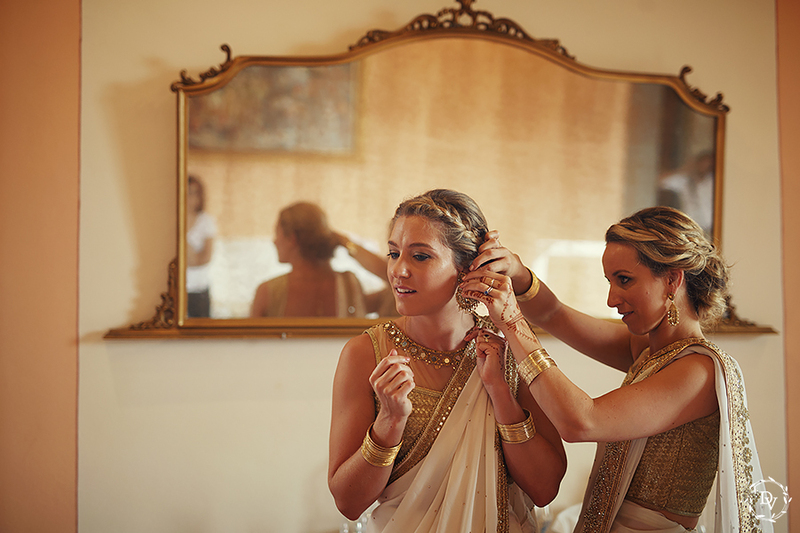 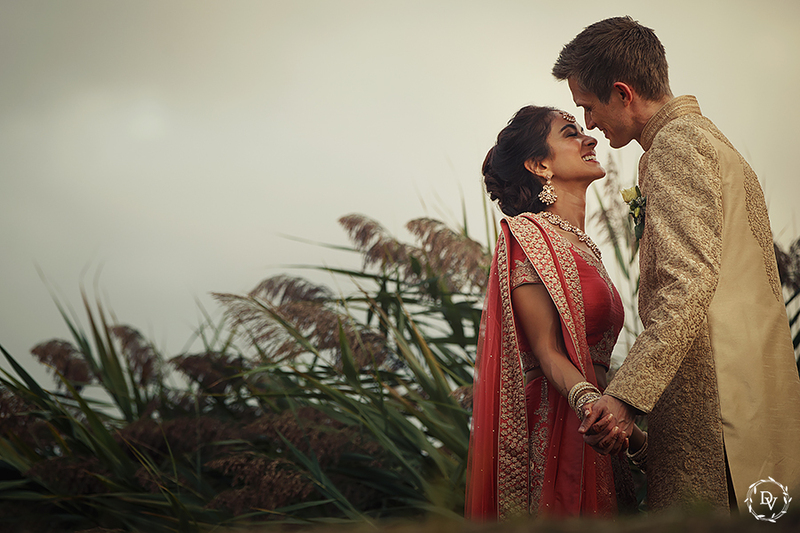 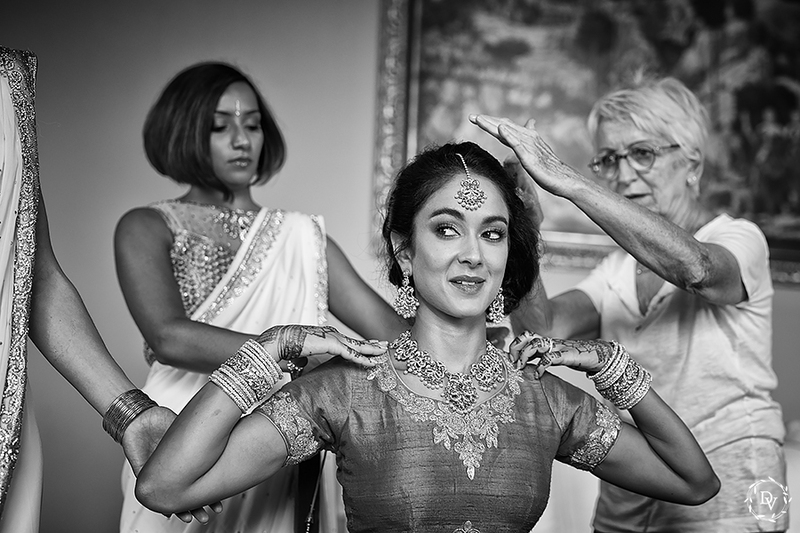 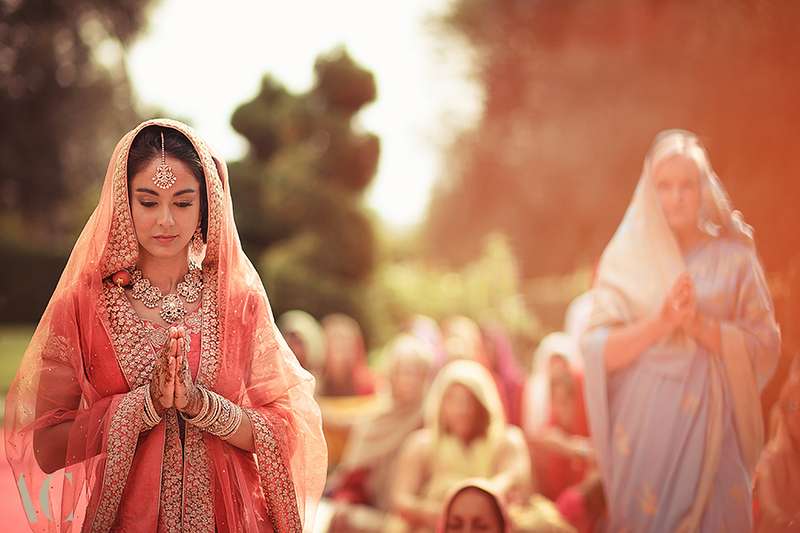 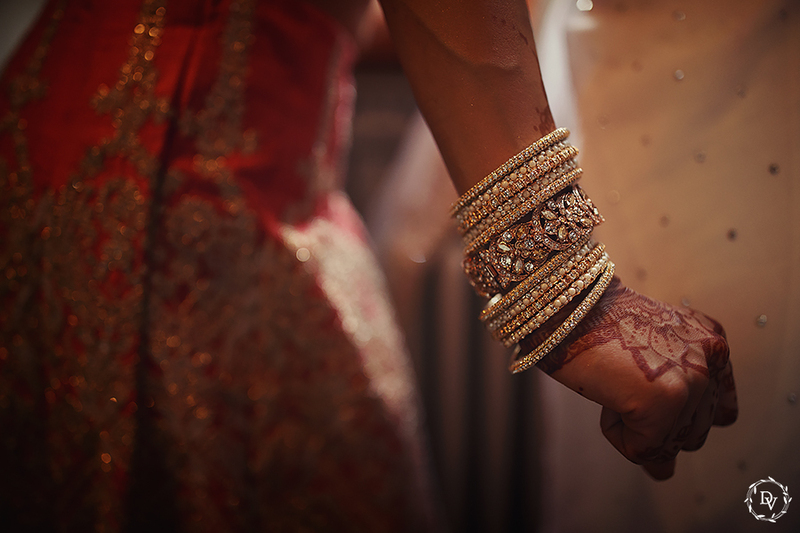 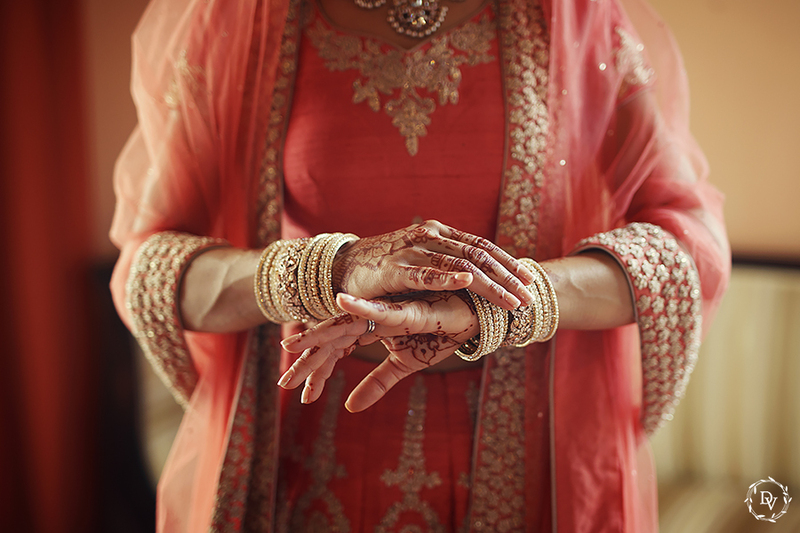 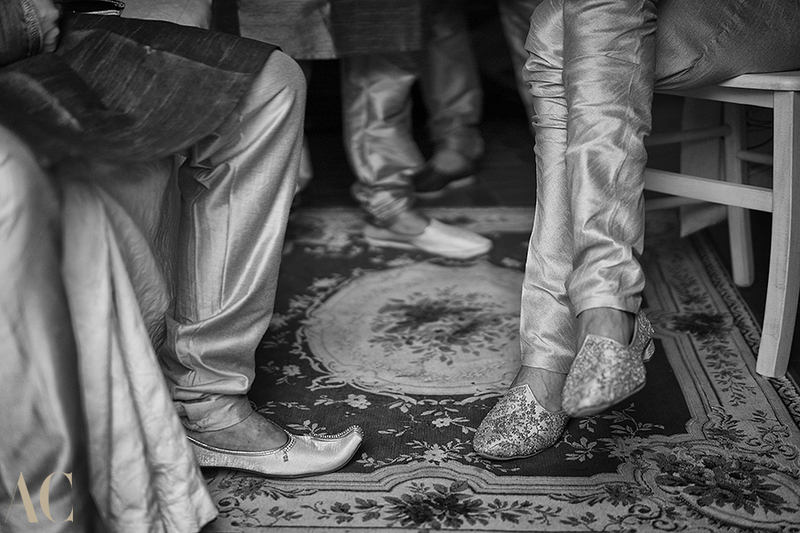 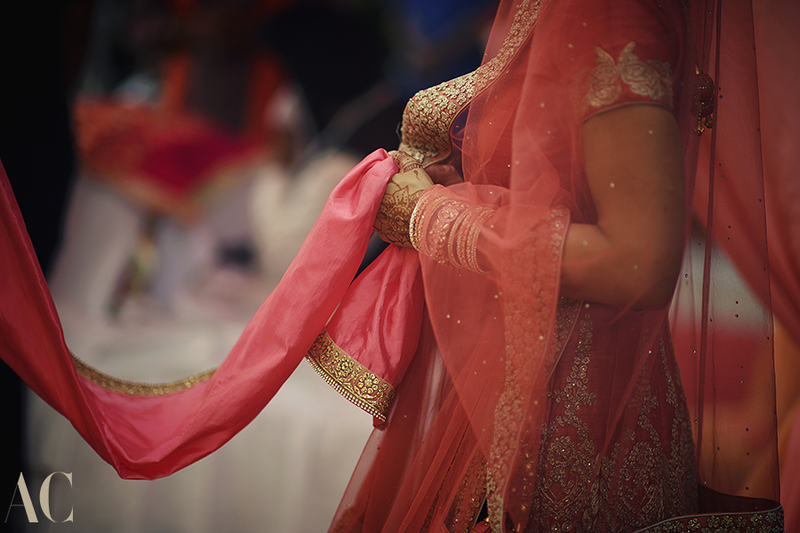 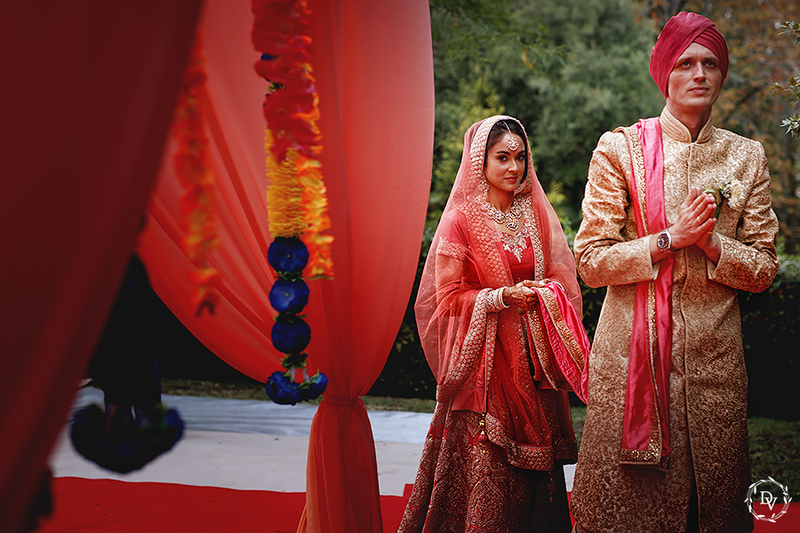 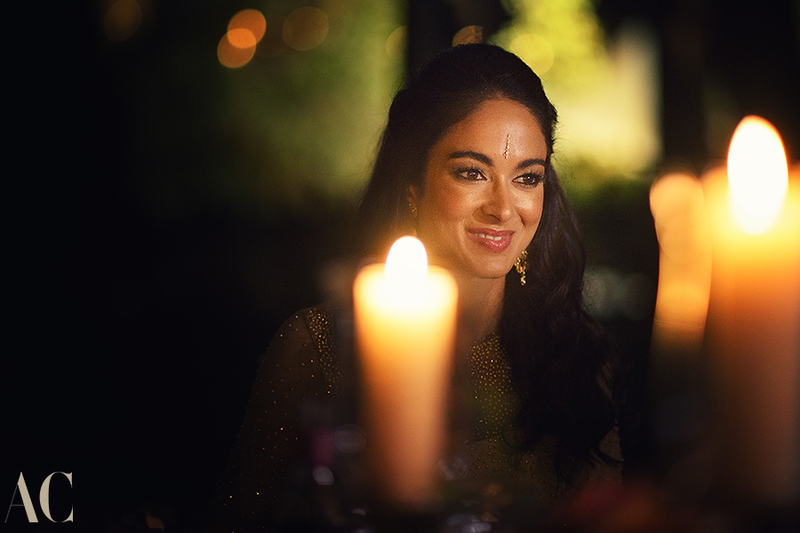 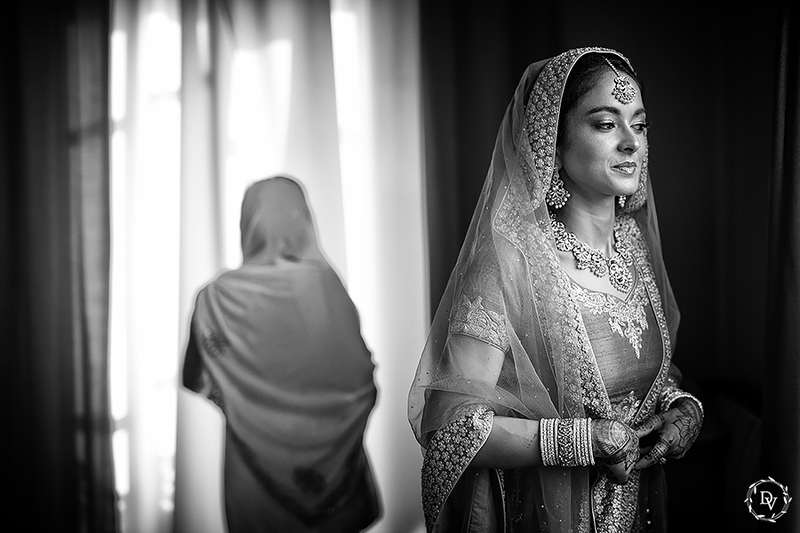 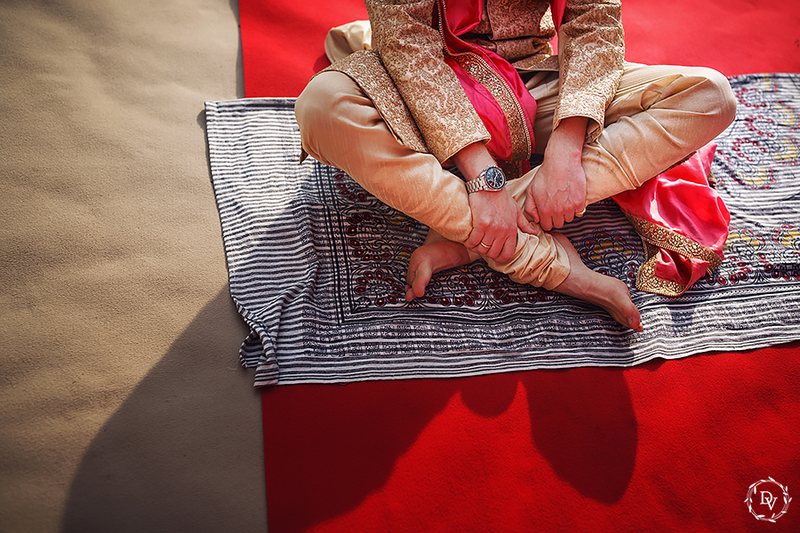 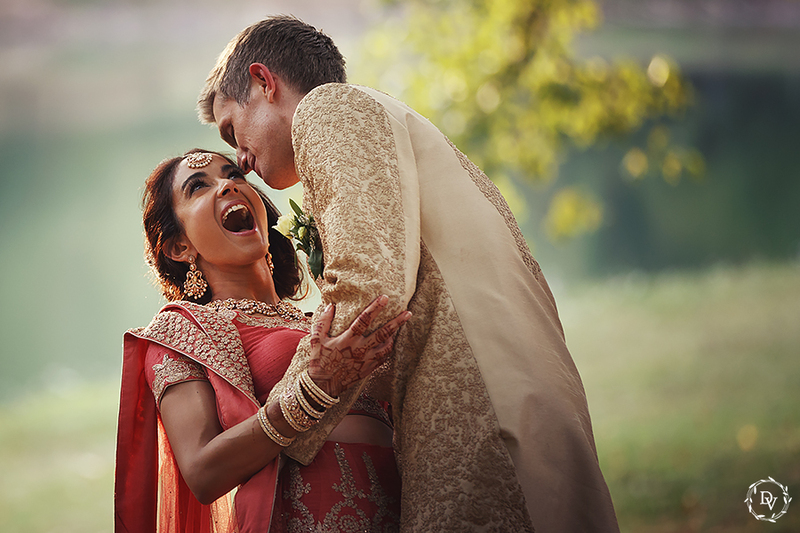 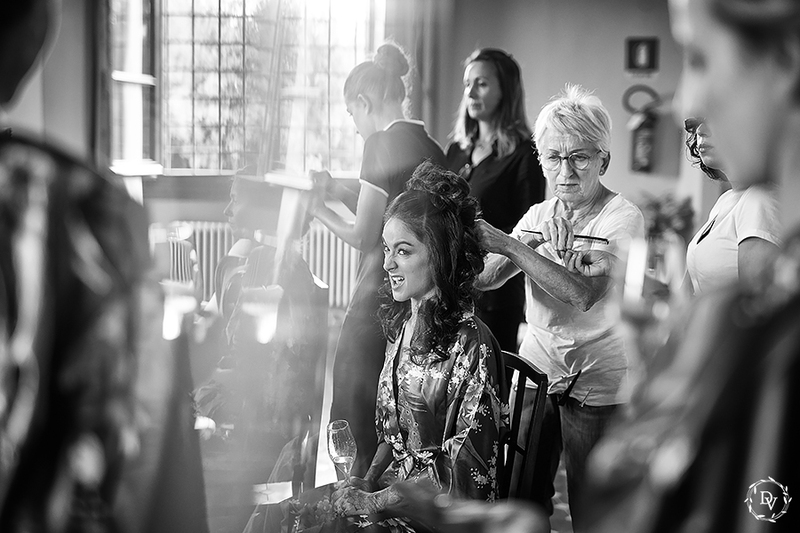 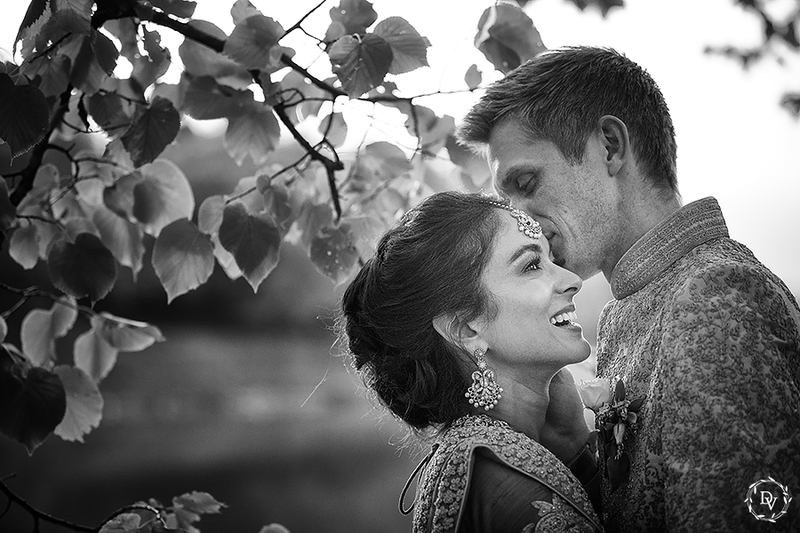 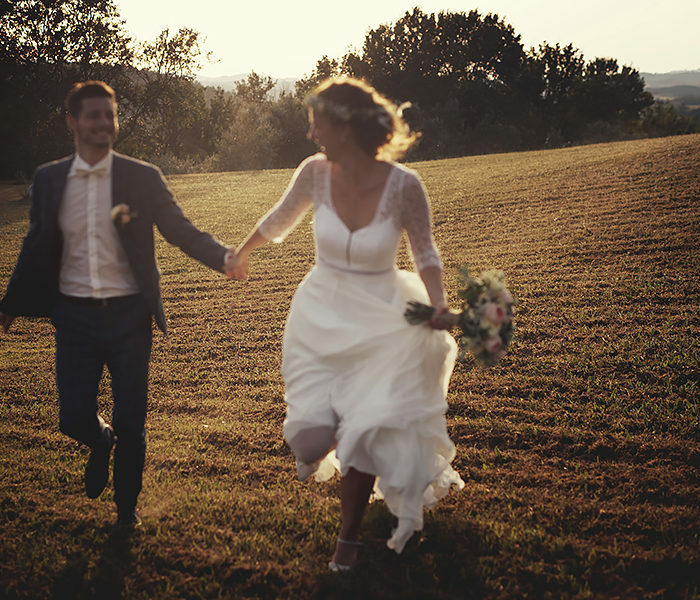 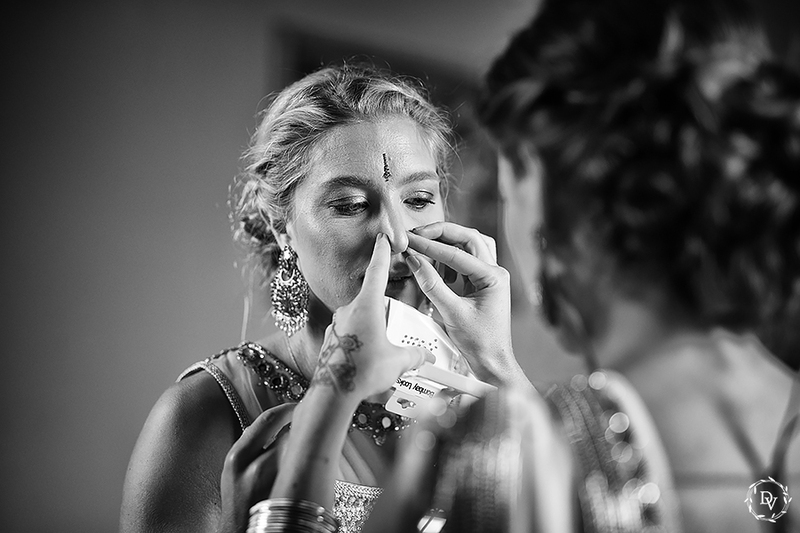 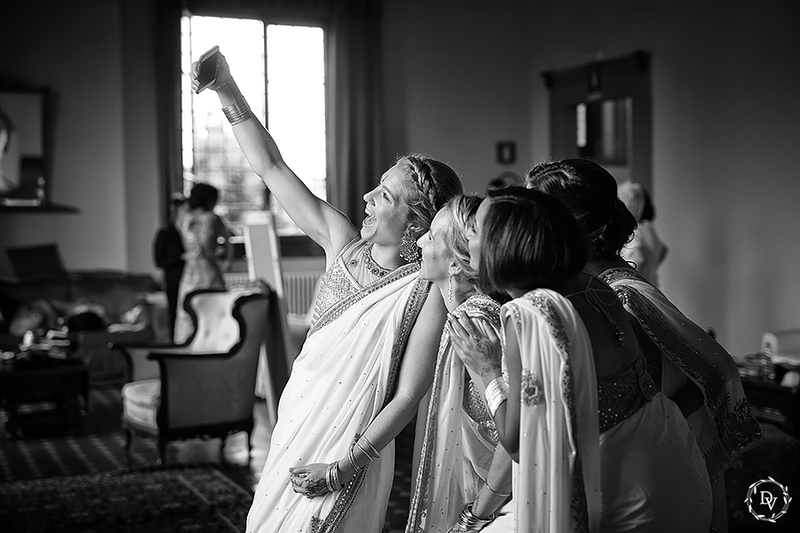 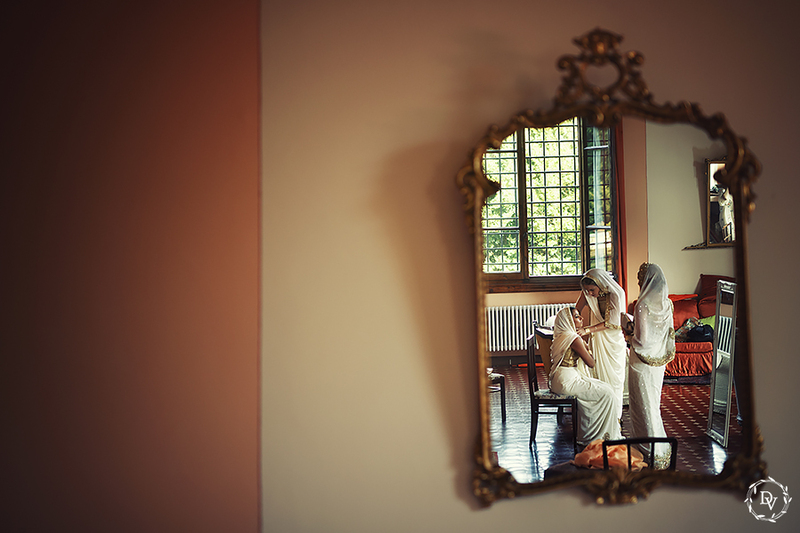 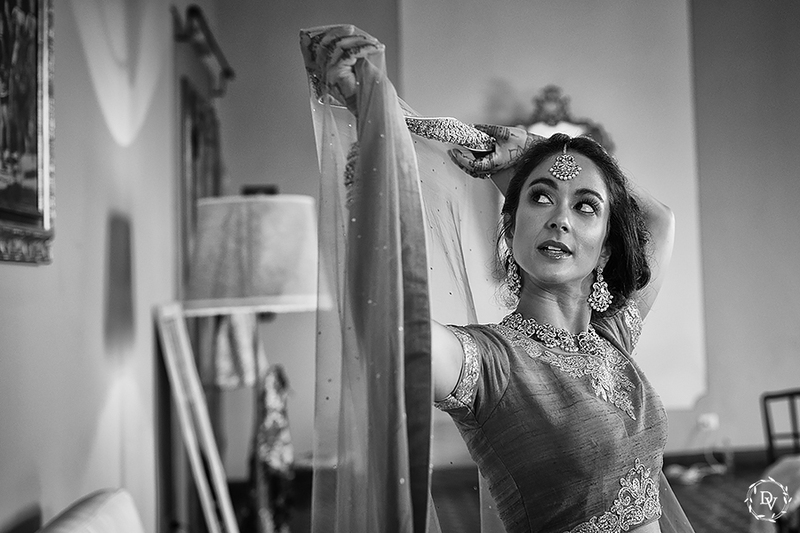 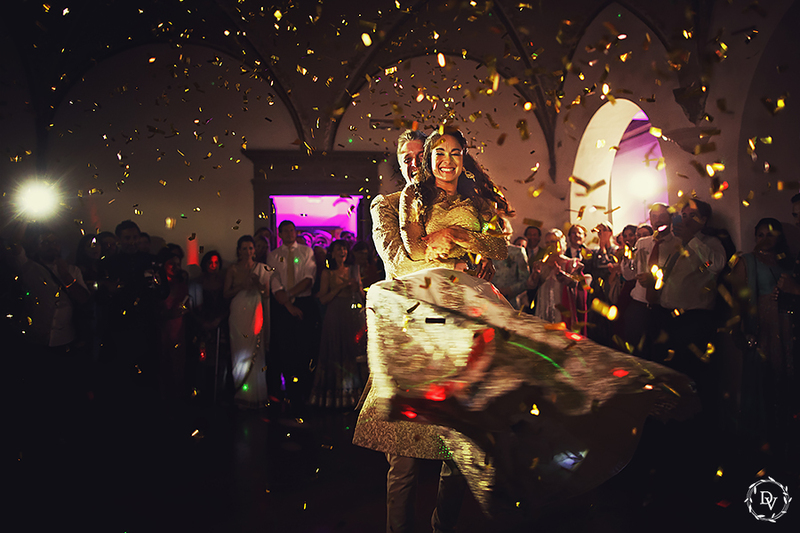 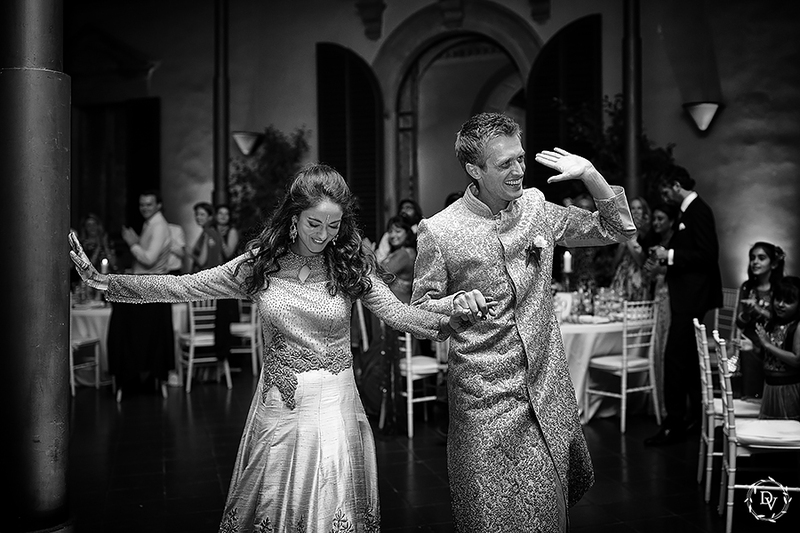 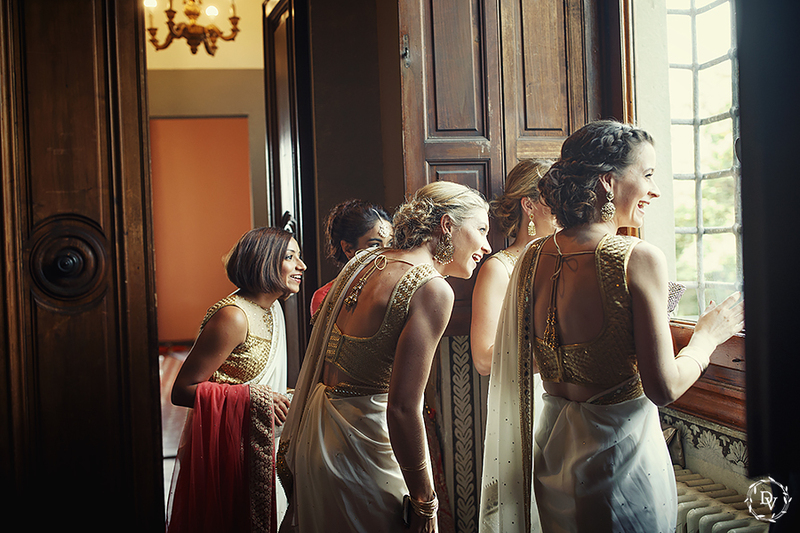 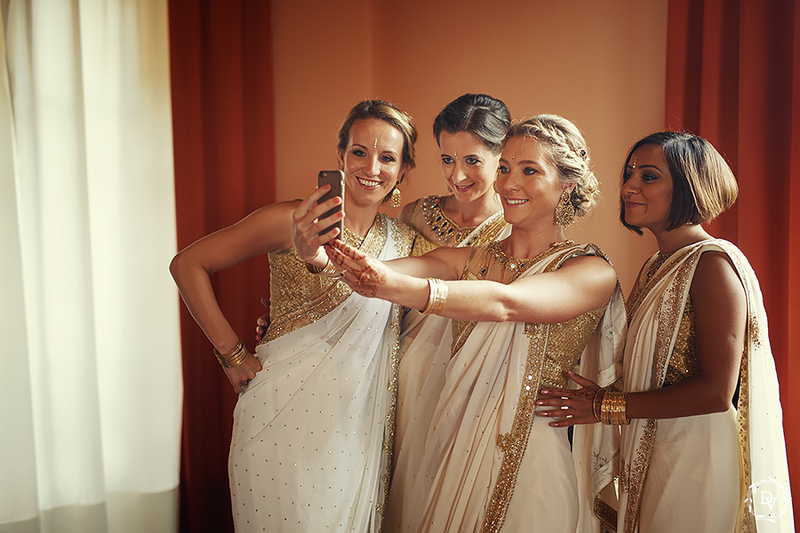 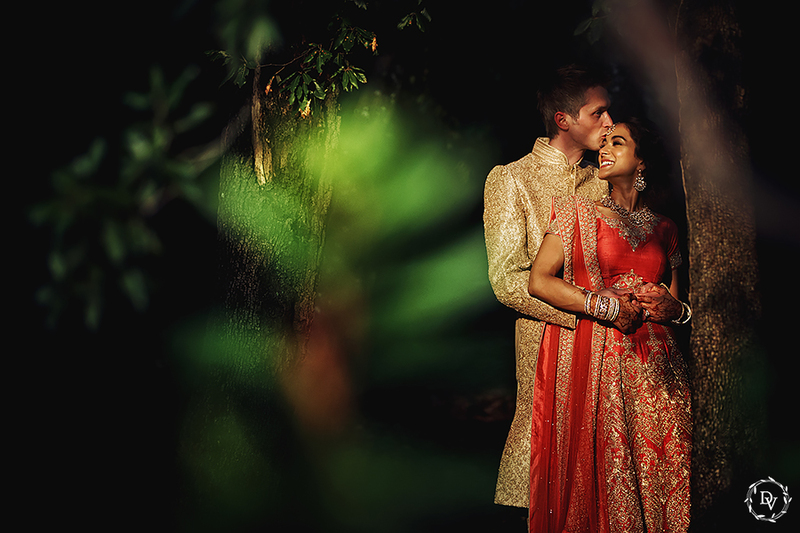 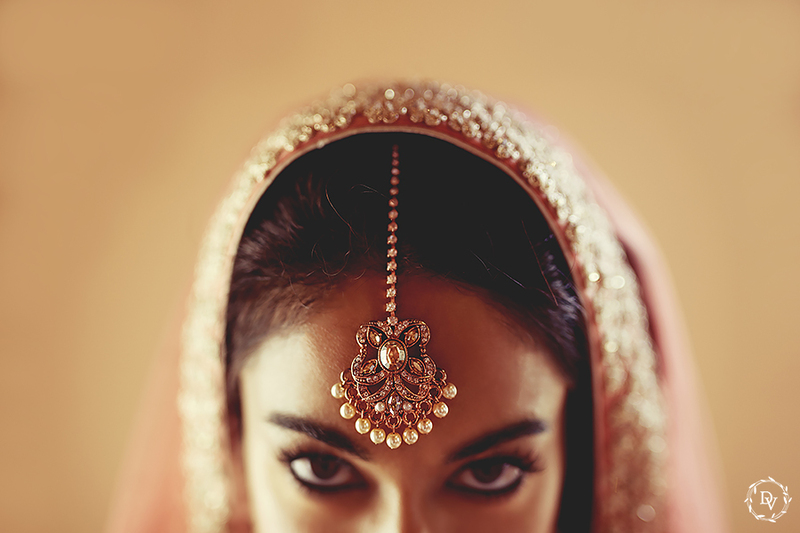 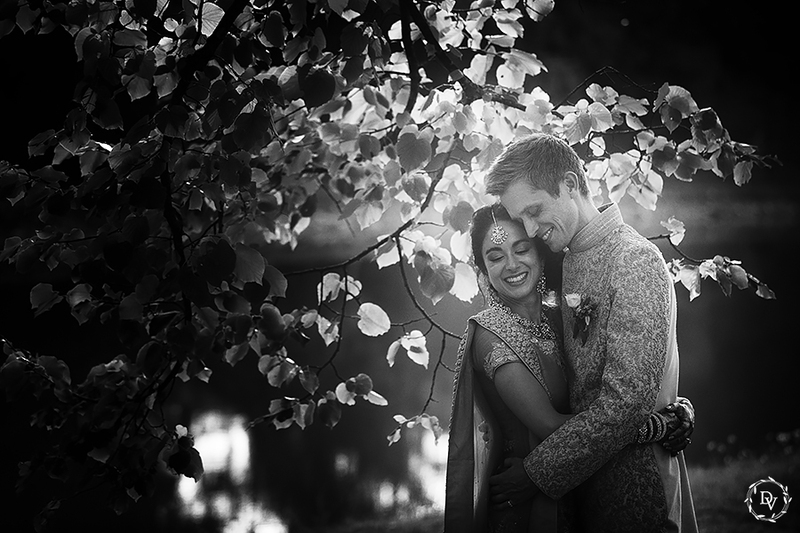 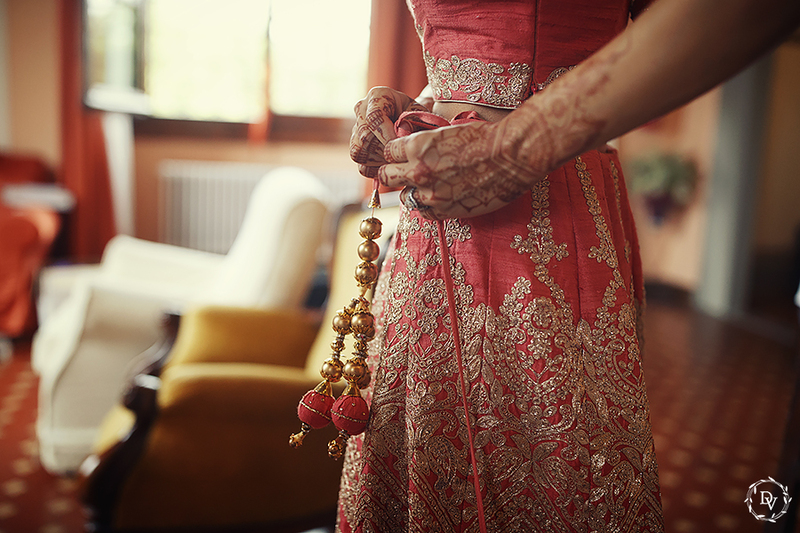 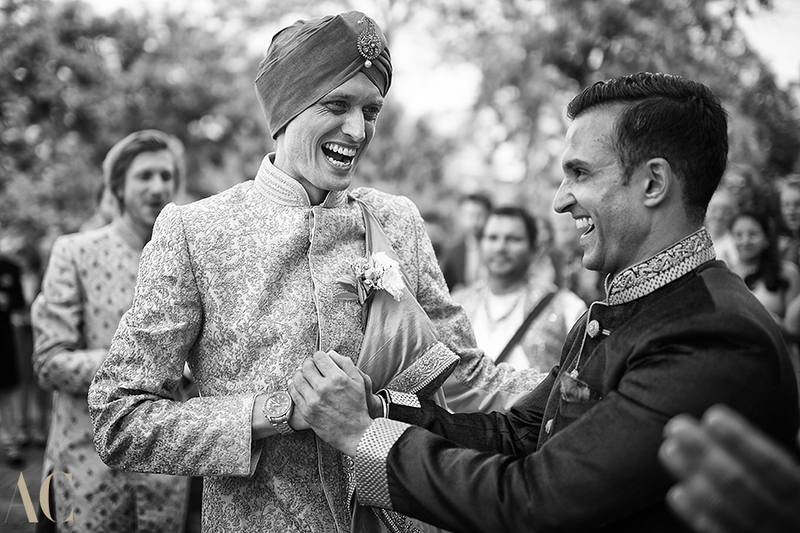 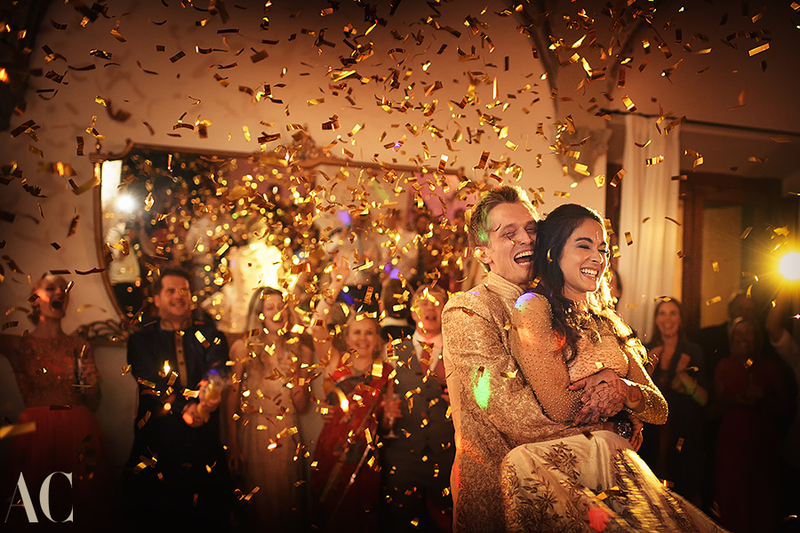 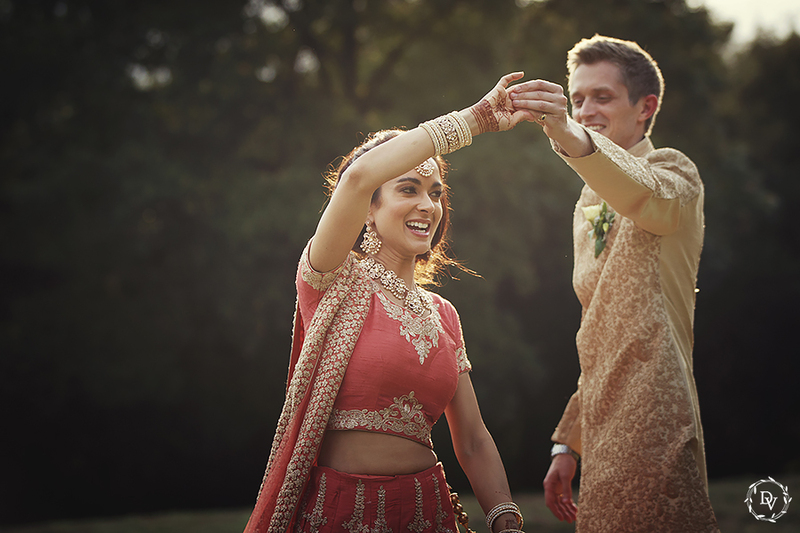 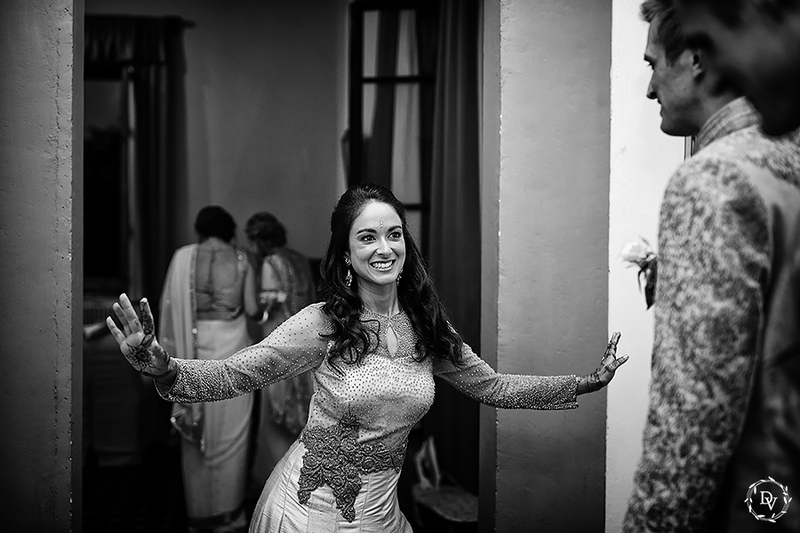 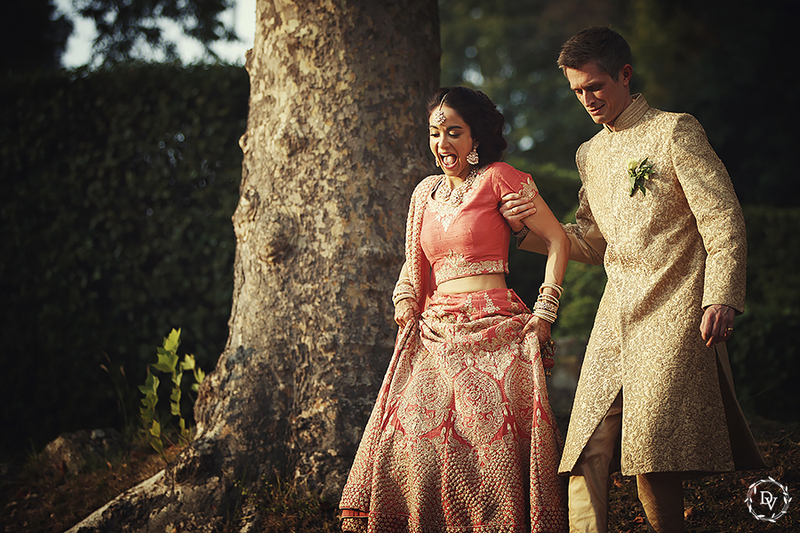 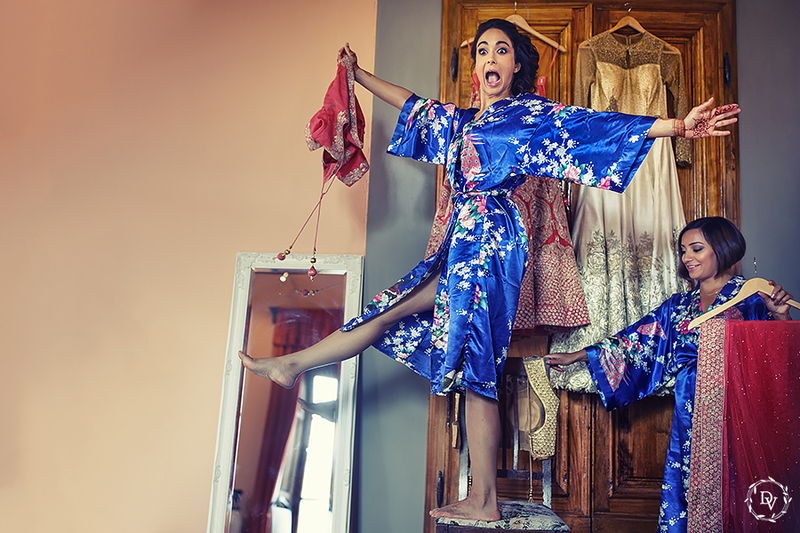 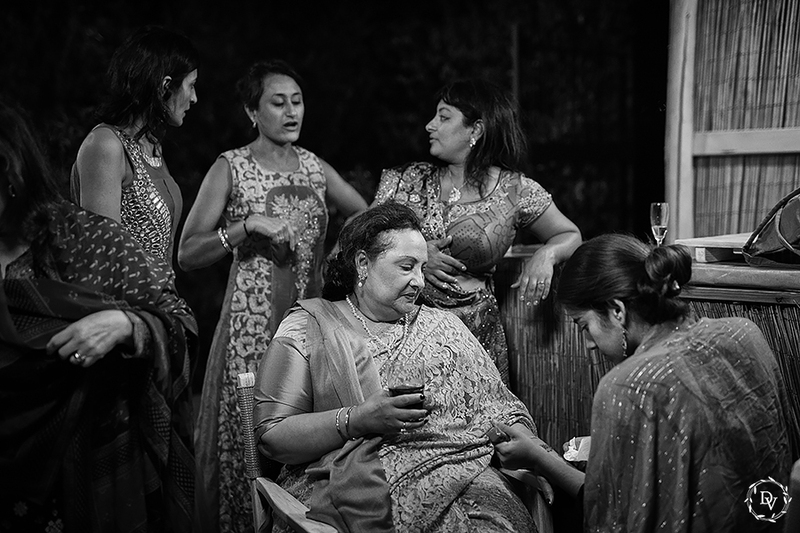 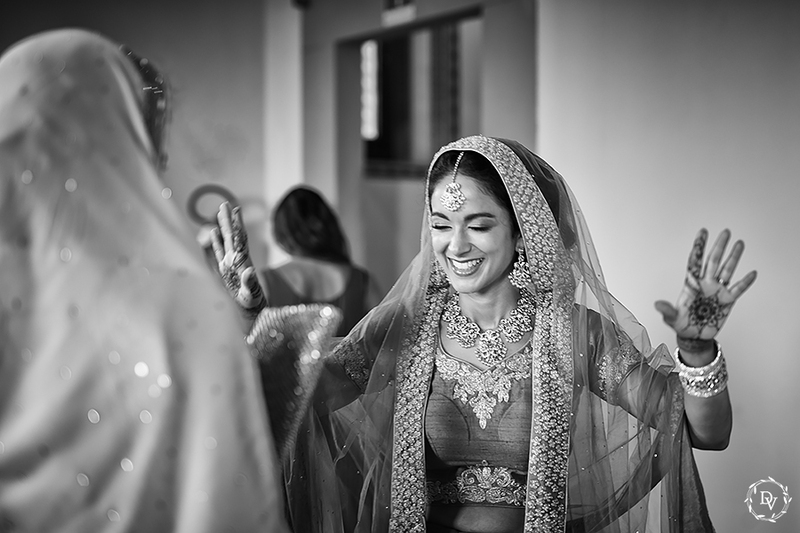 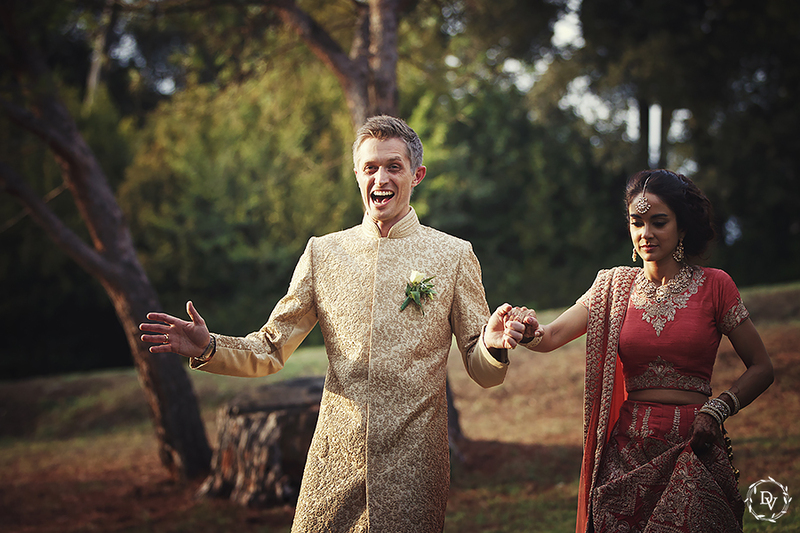 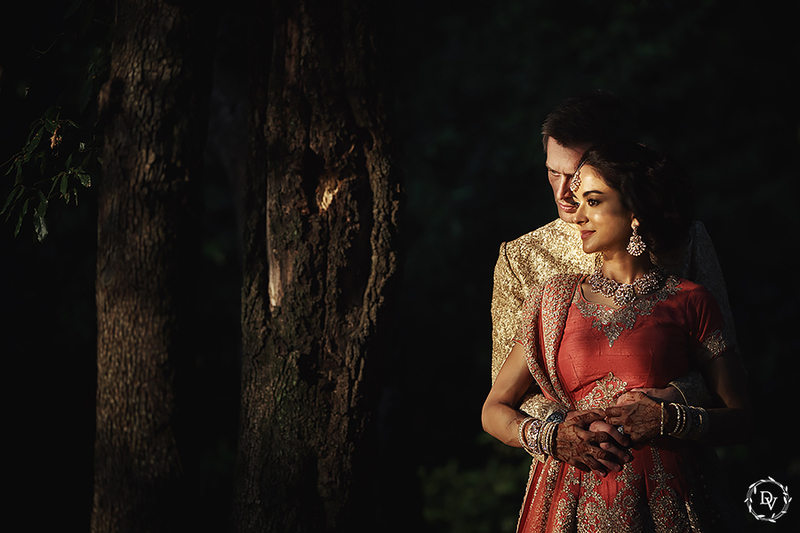 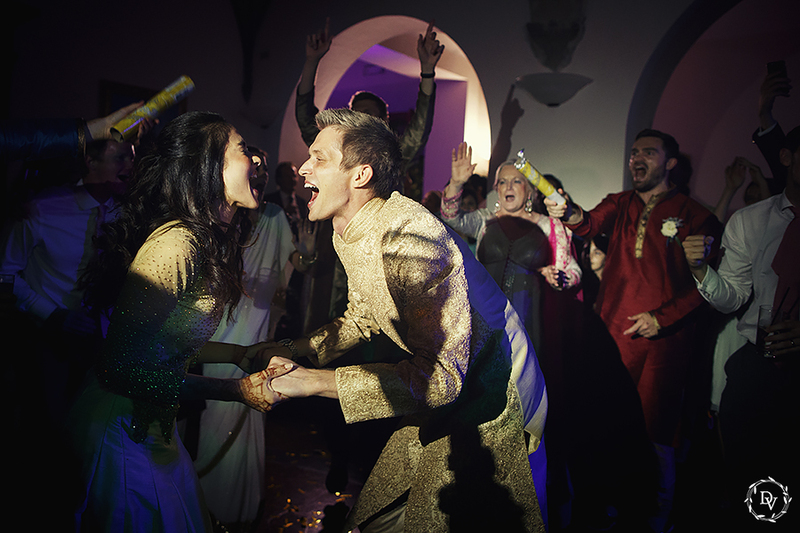 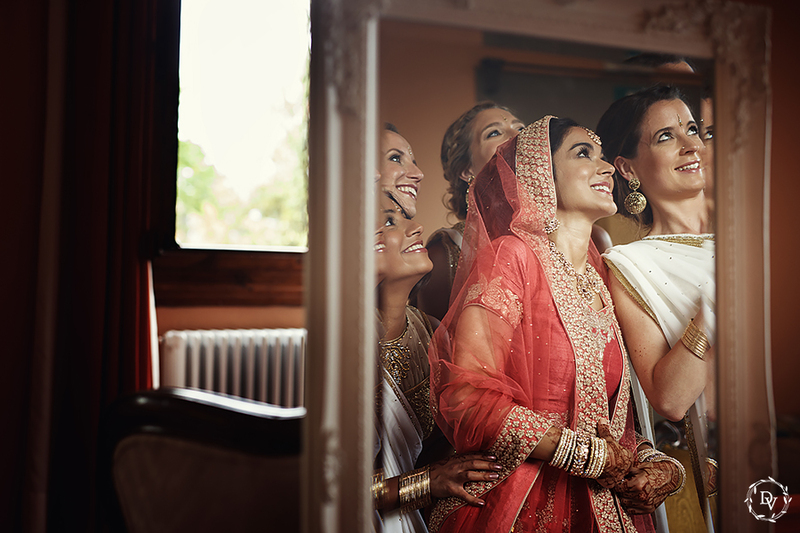 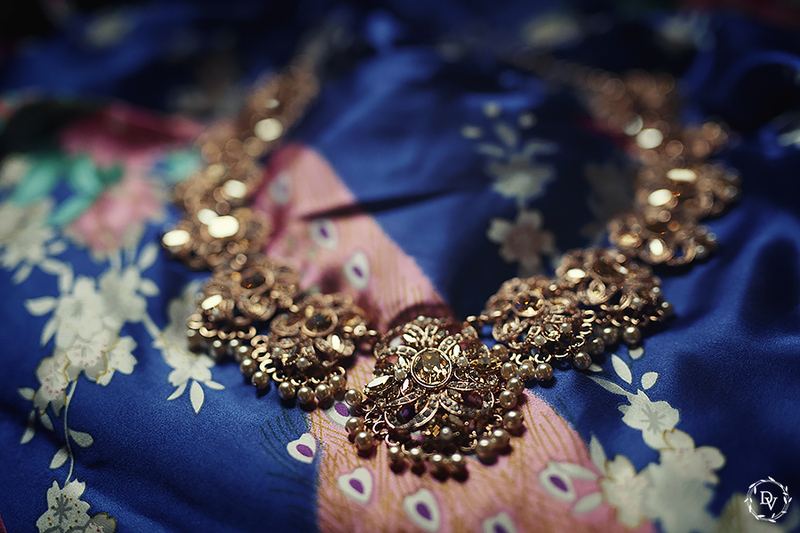 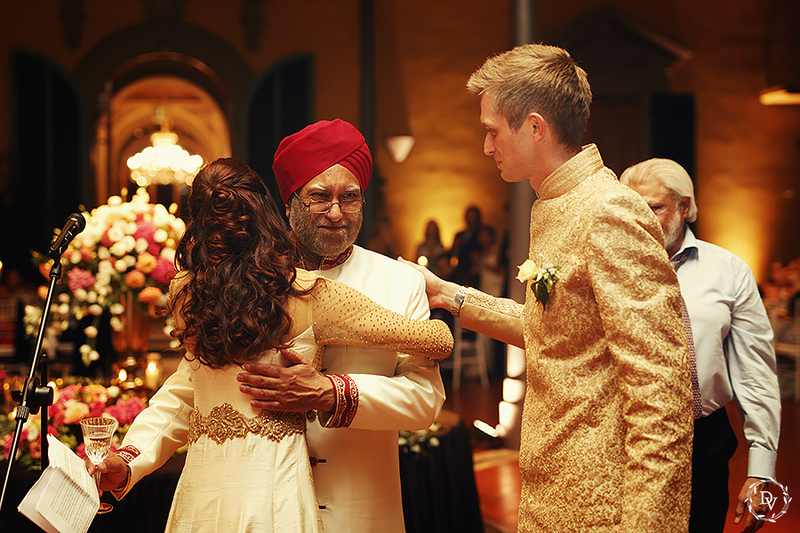 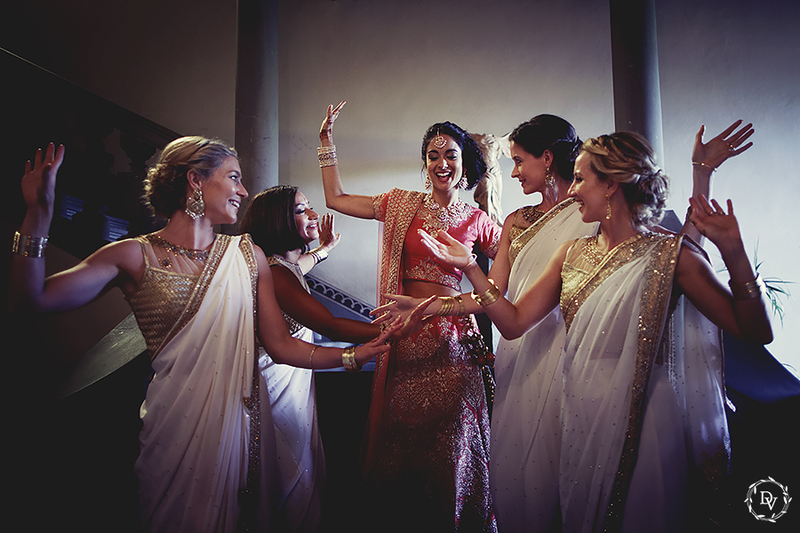 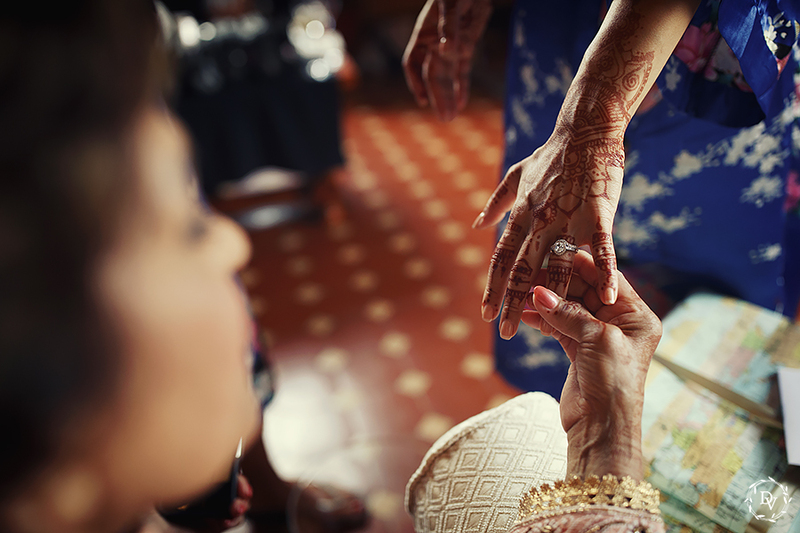 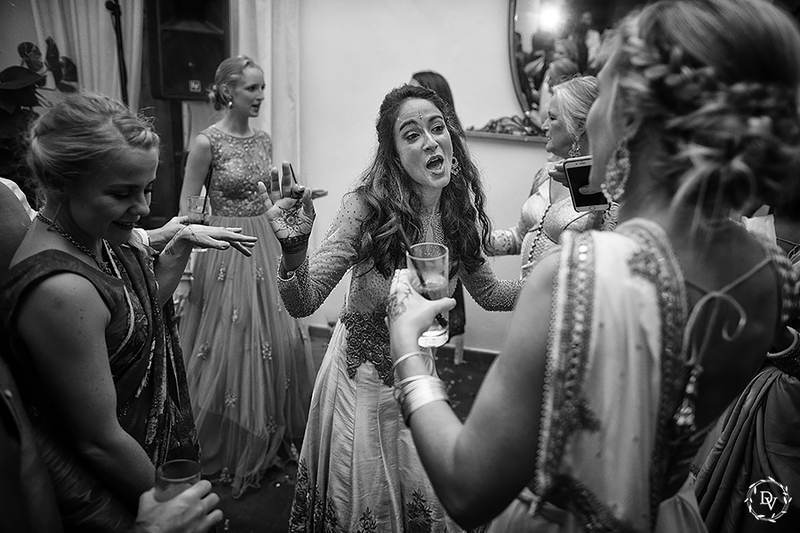 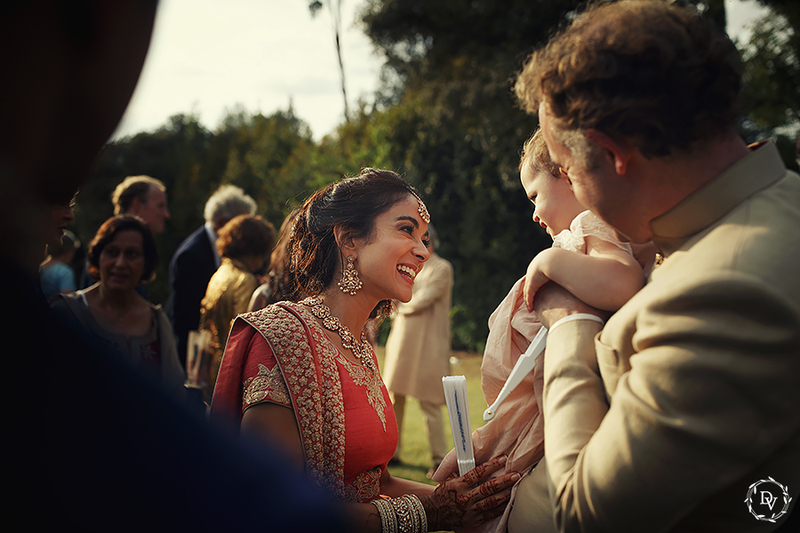 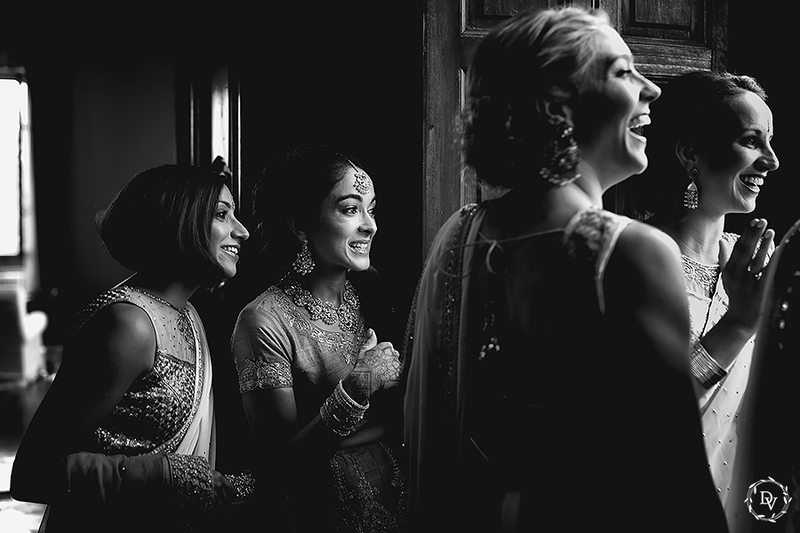 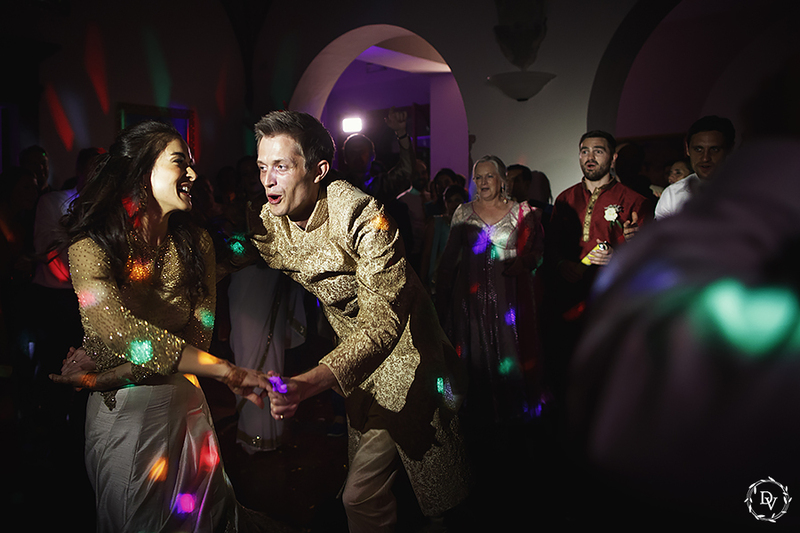 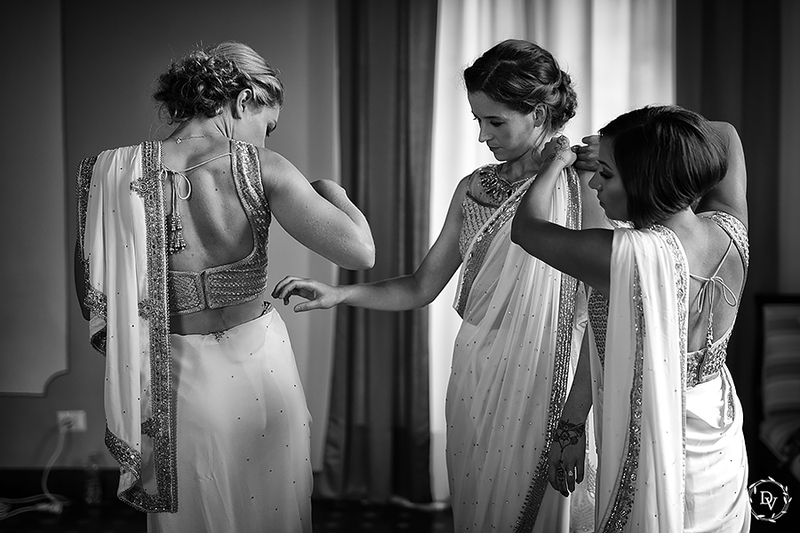 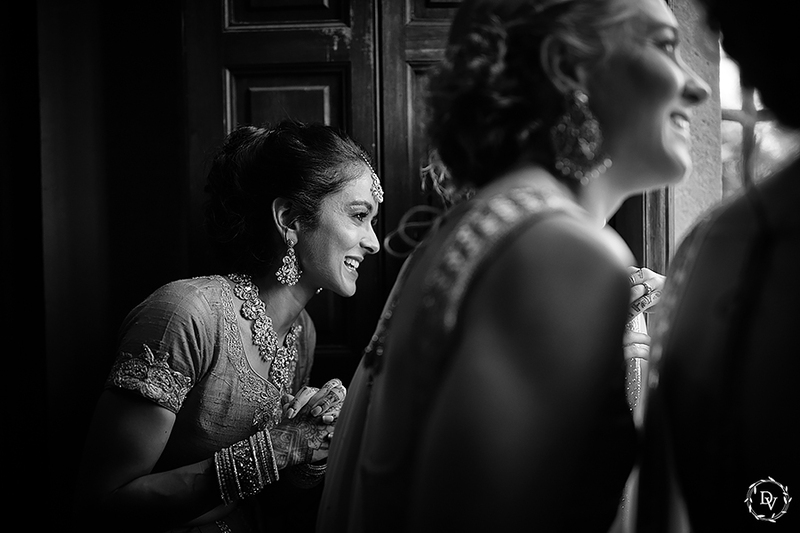 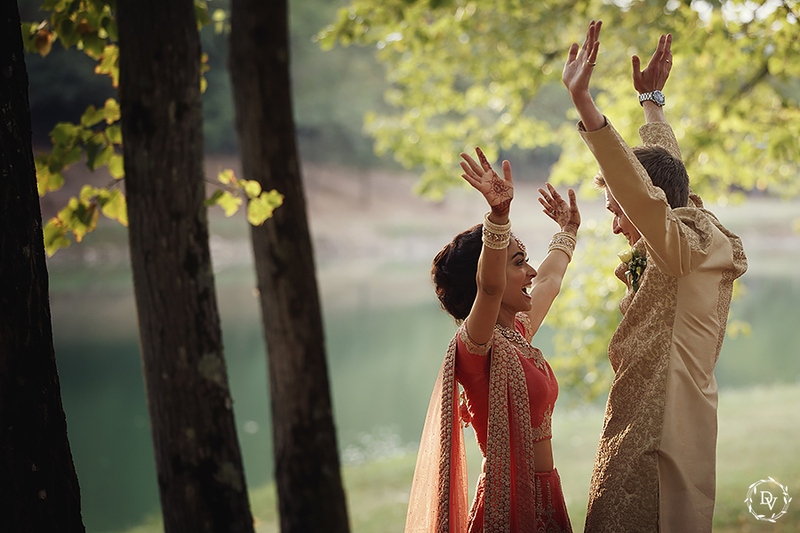 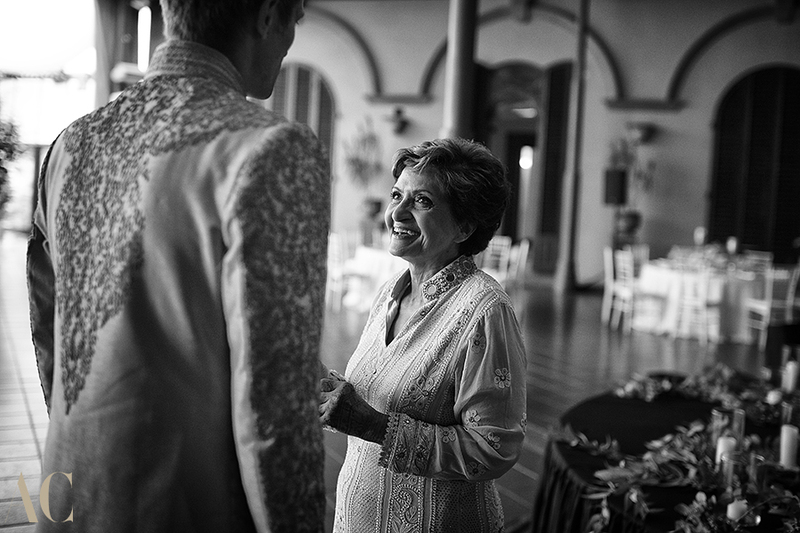 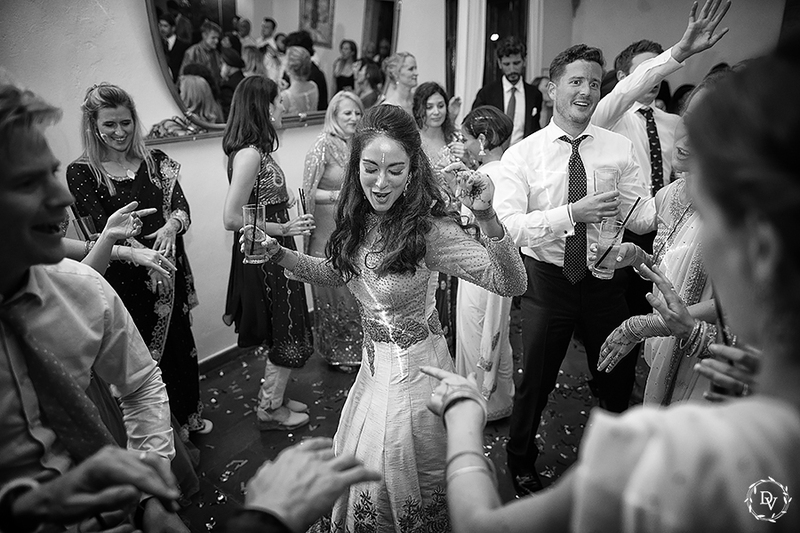 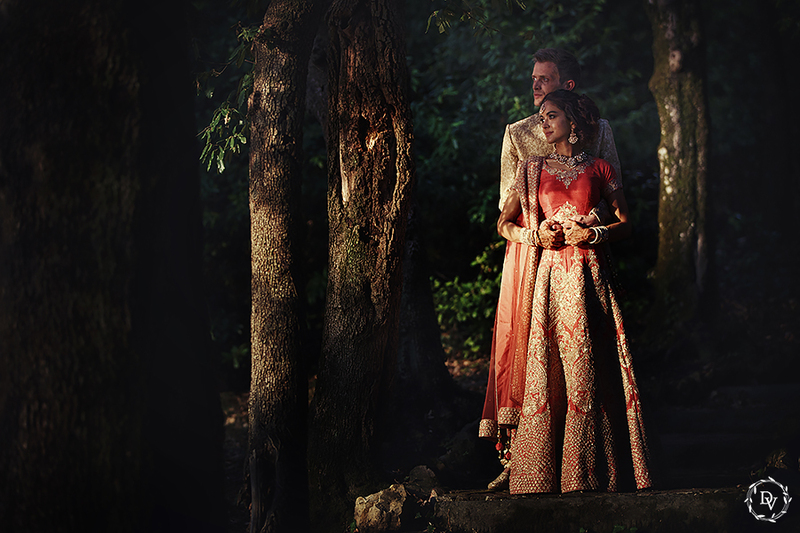 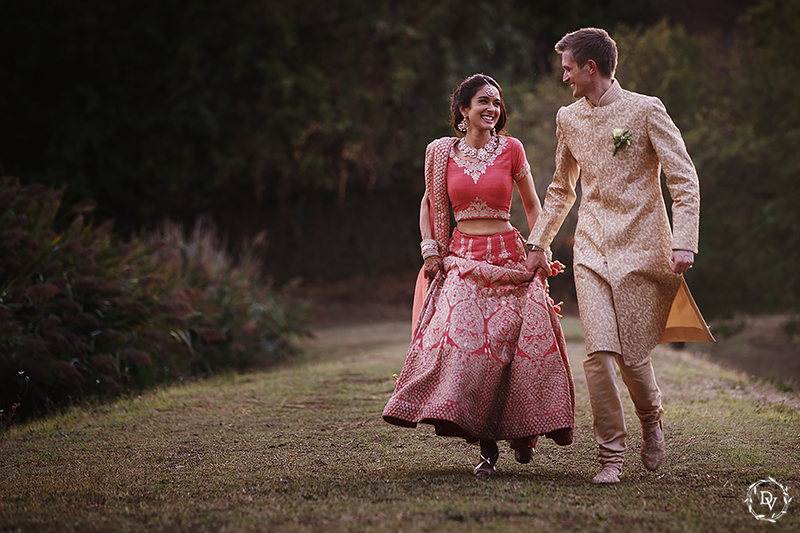 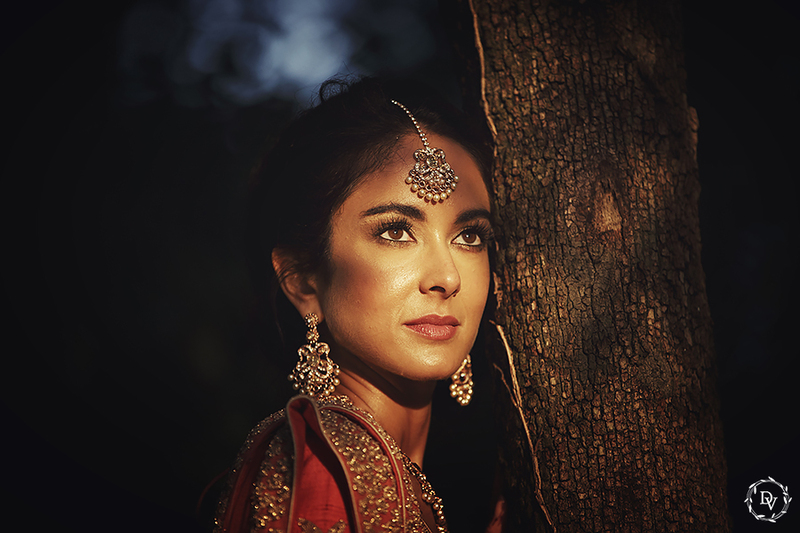 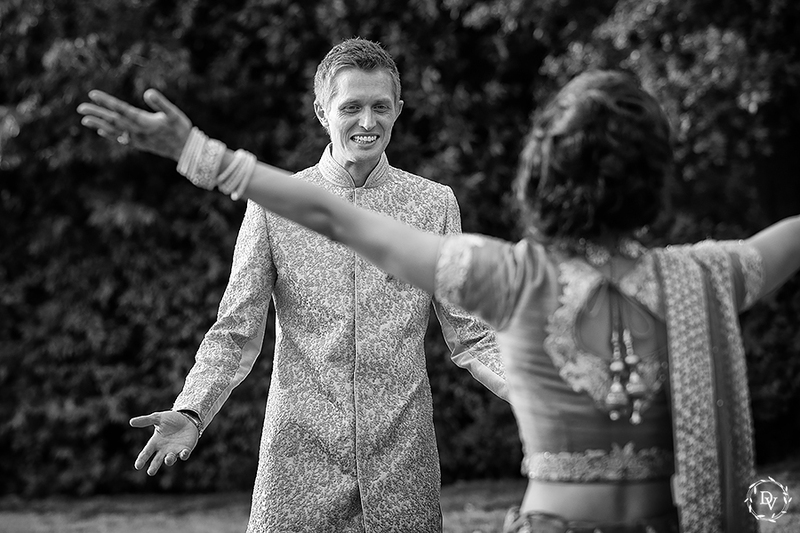 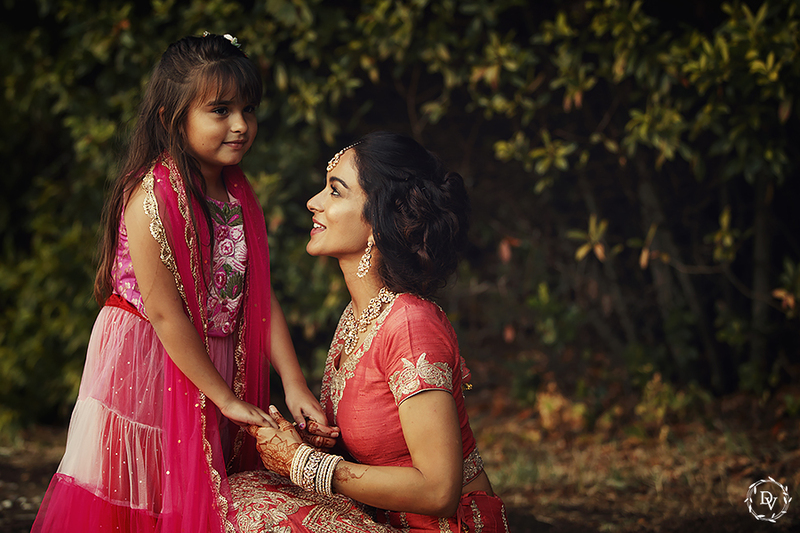 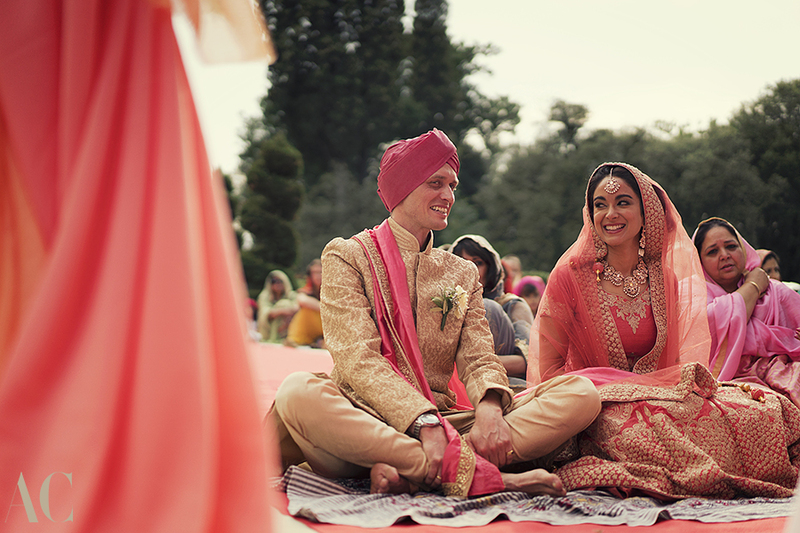 In Indian cultures, a wedding is not just one big day, but a series of celebrations occurring before and after the couple exchanges vows. 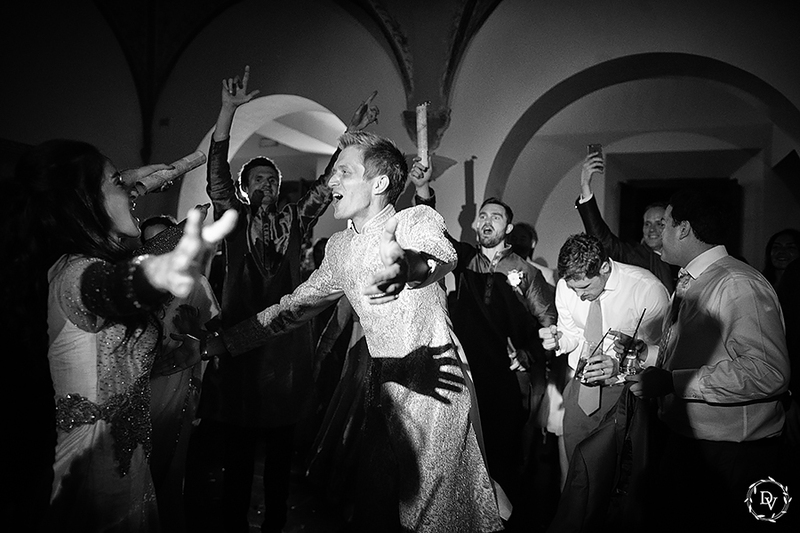 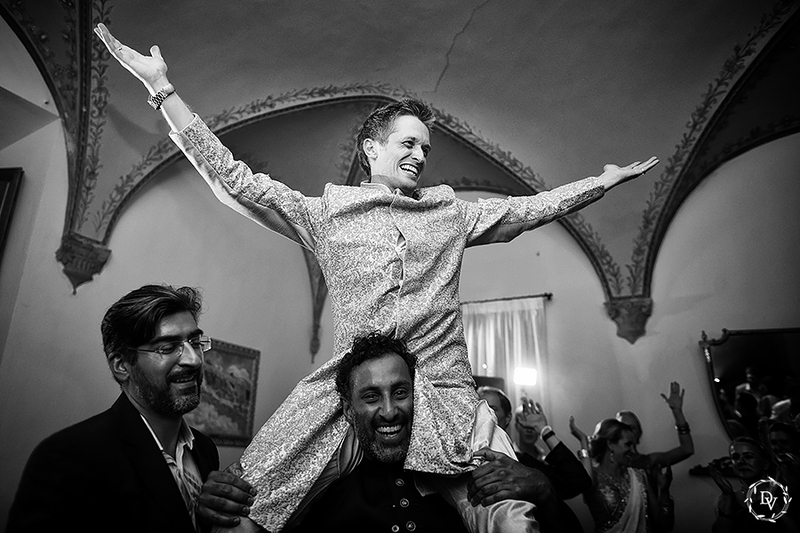 The wedding weekend started on Friday night with a welcome dinner buffet in an amazing farmhouse situated on Carmignano hills. 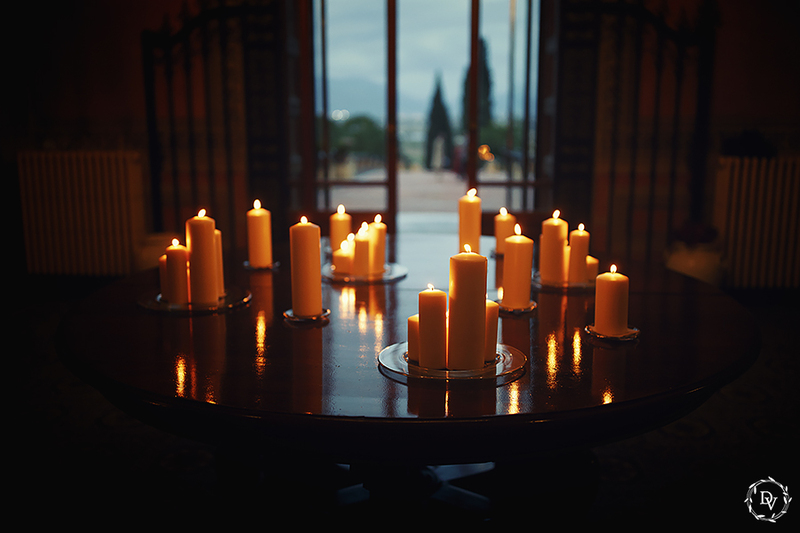 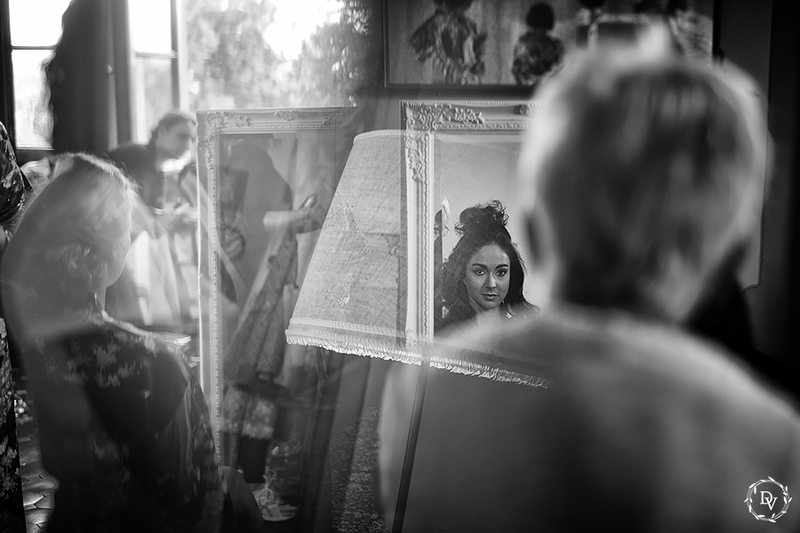 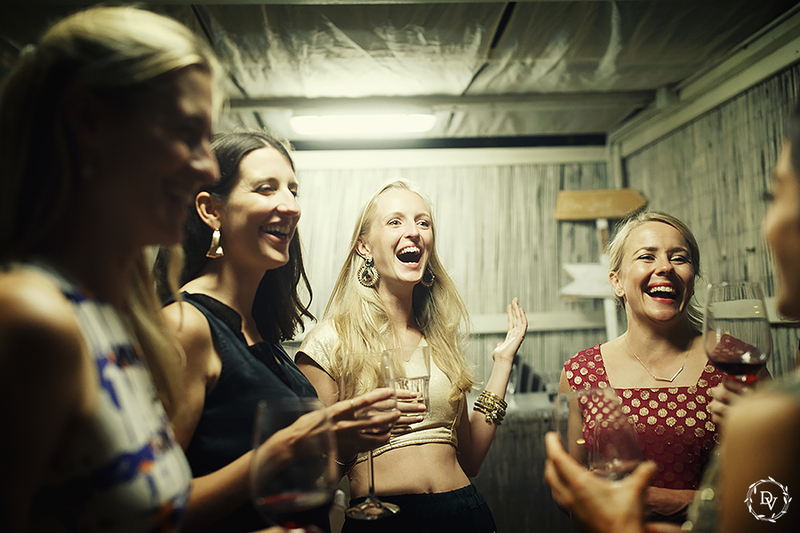 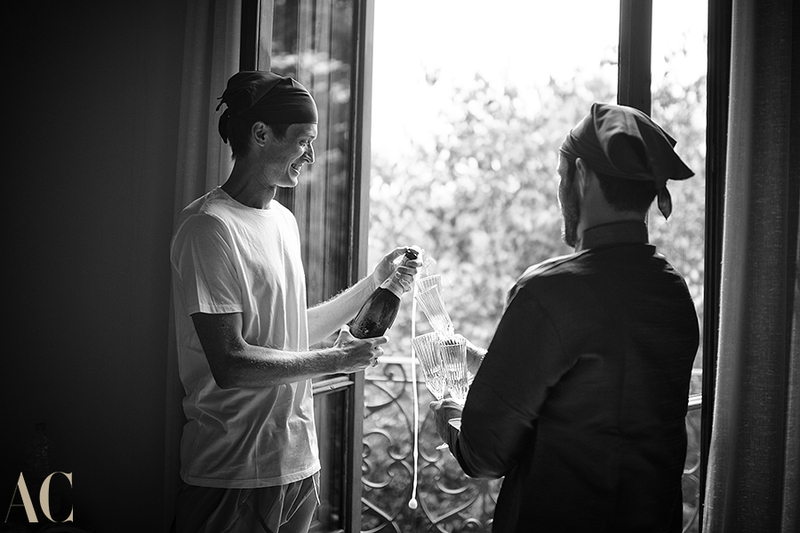 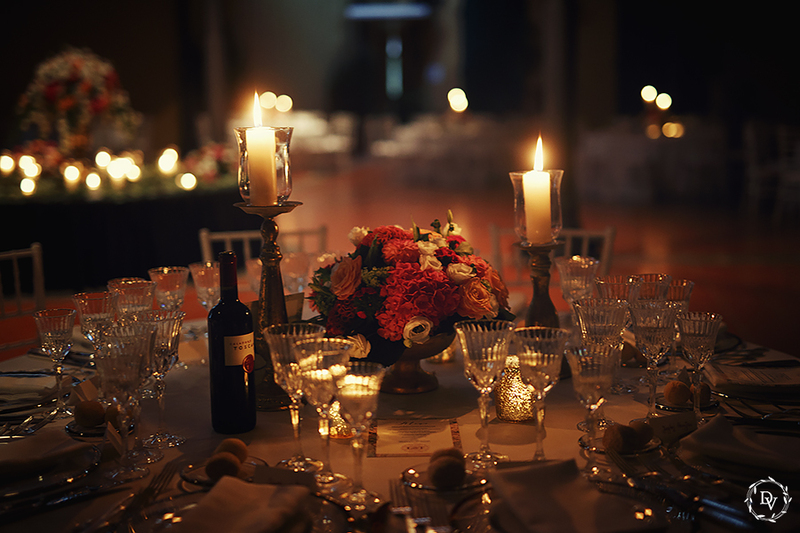 Here guests tasted Pizza and Pasta, Tuscan wines and spent relaxing time together. 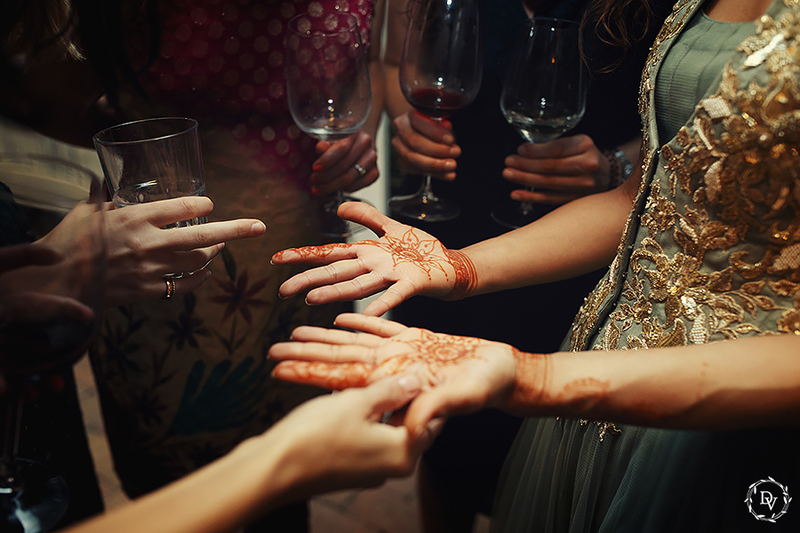 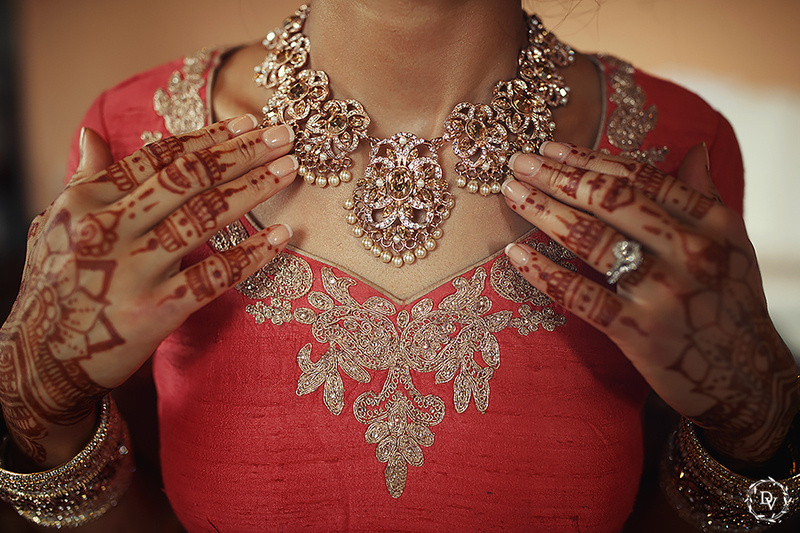 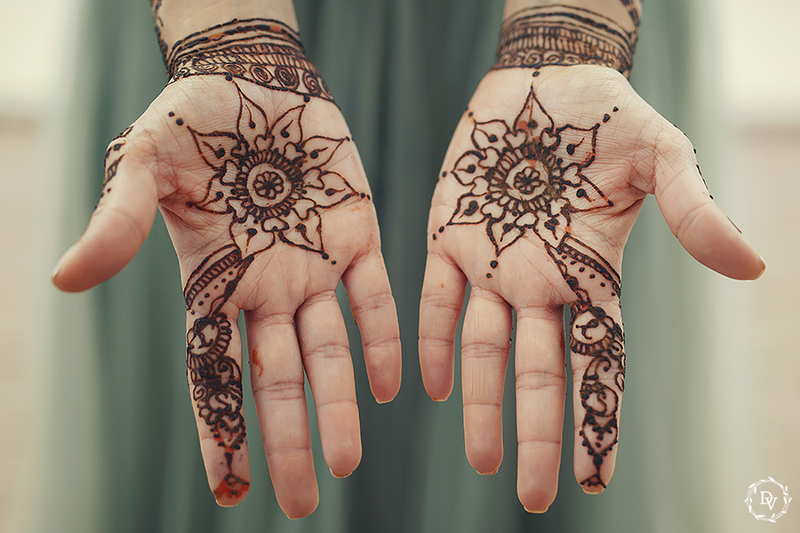 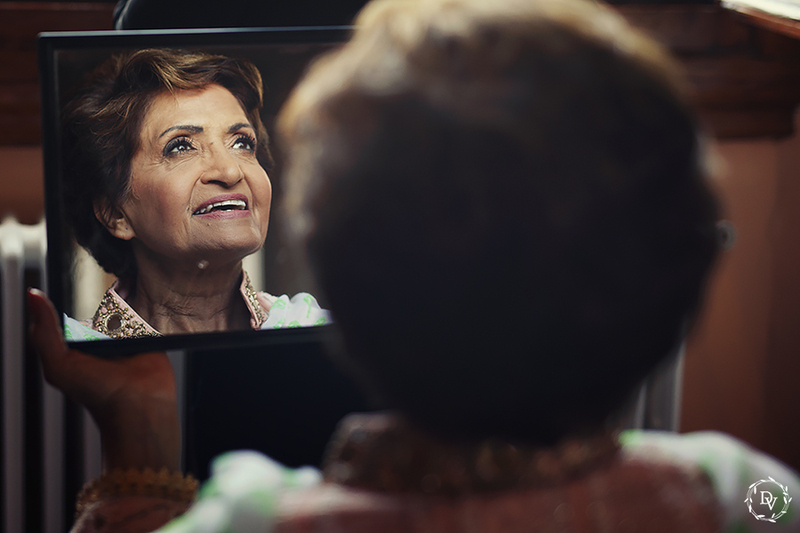 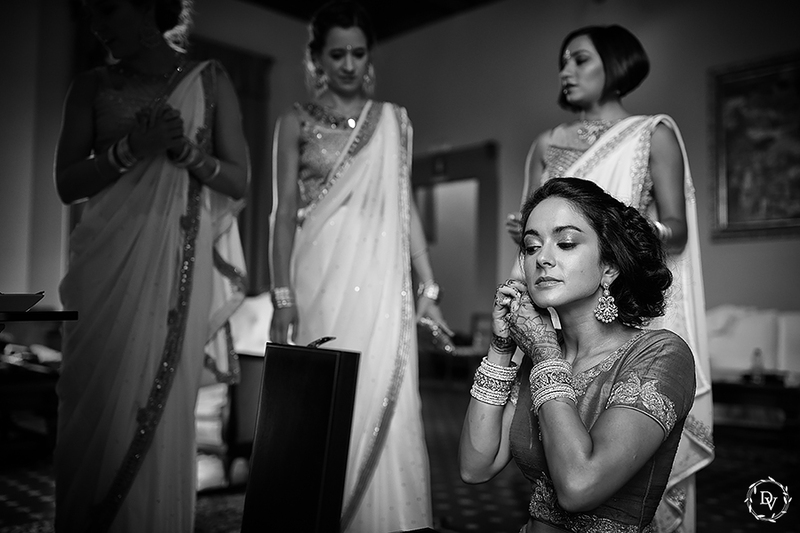 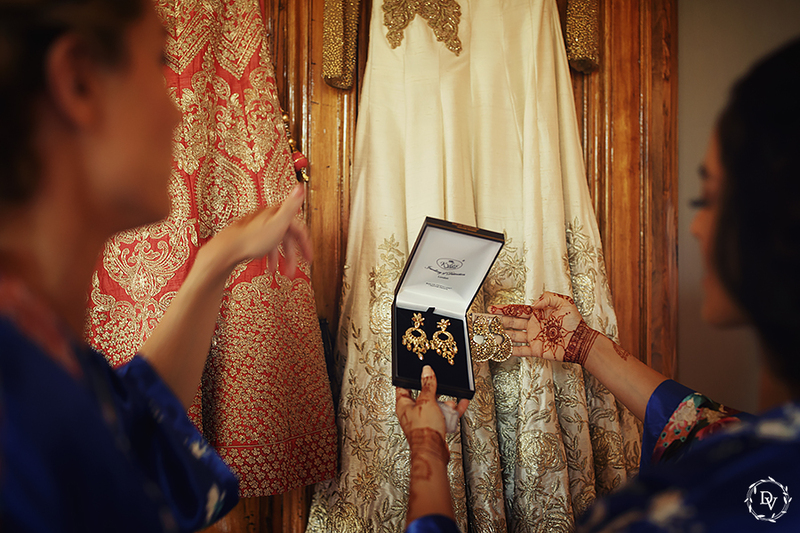 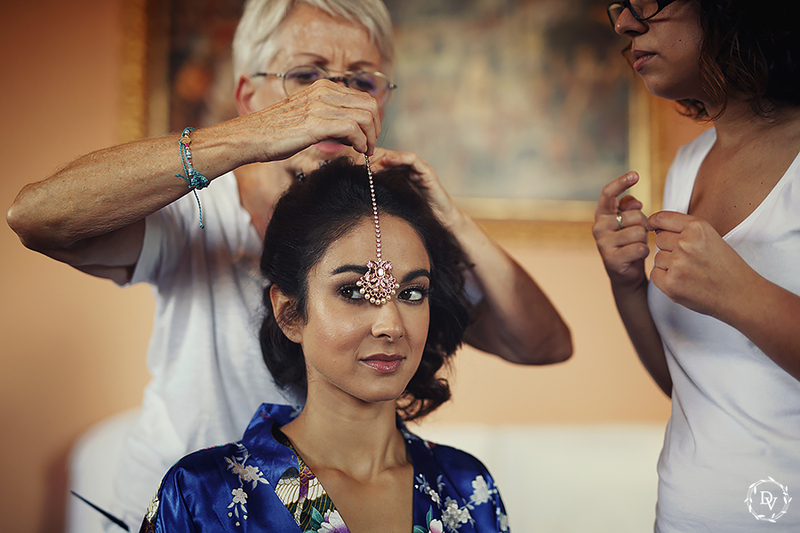 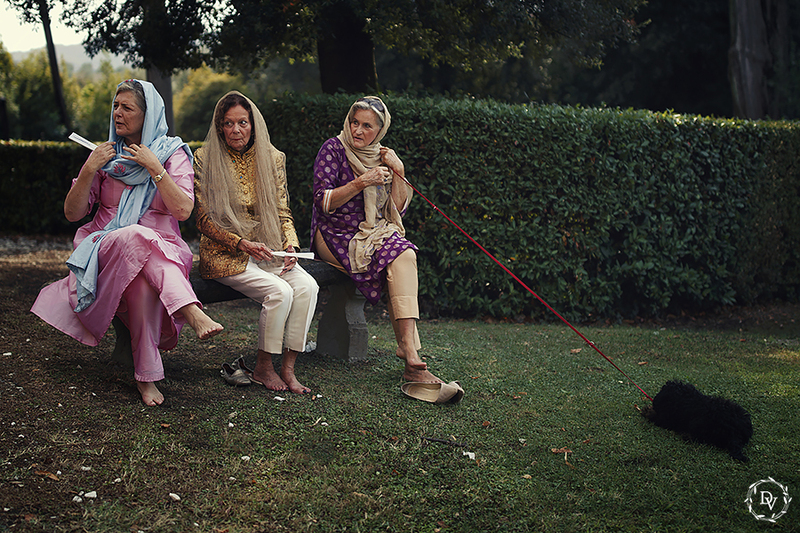 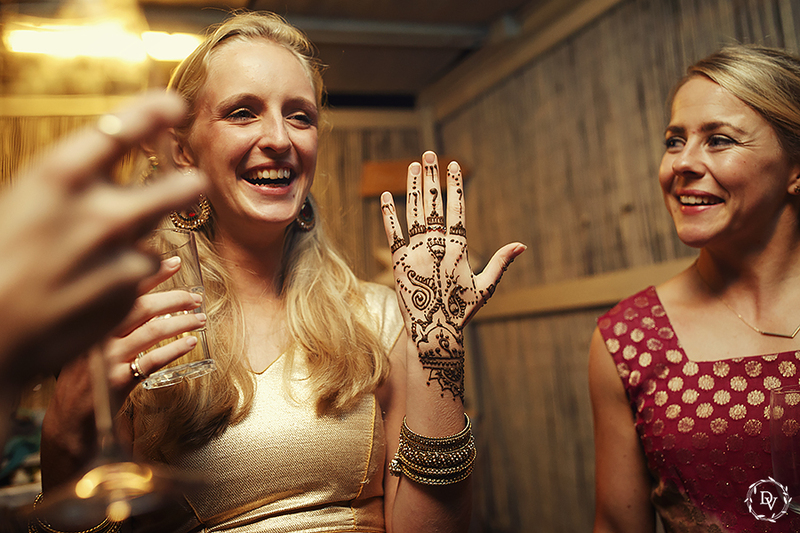 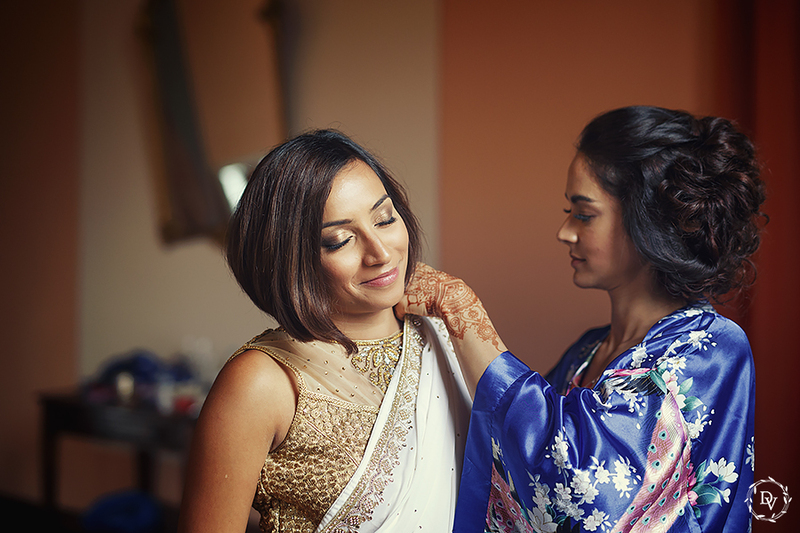 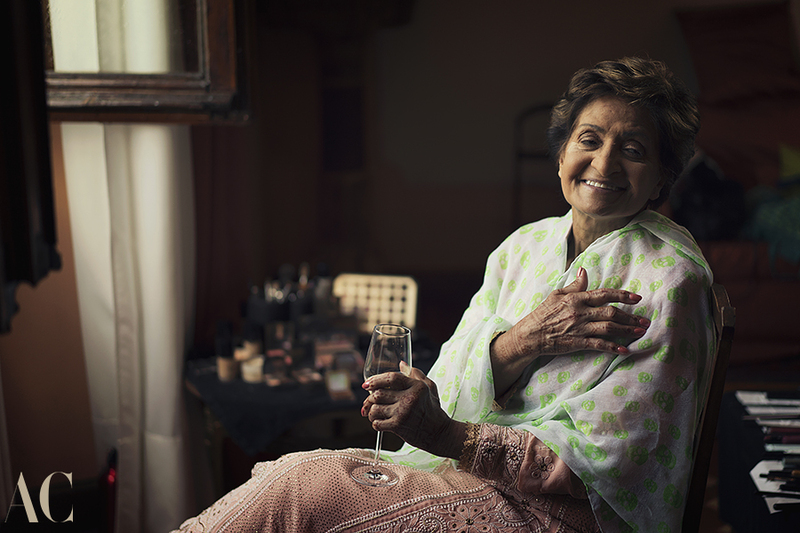 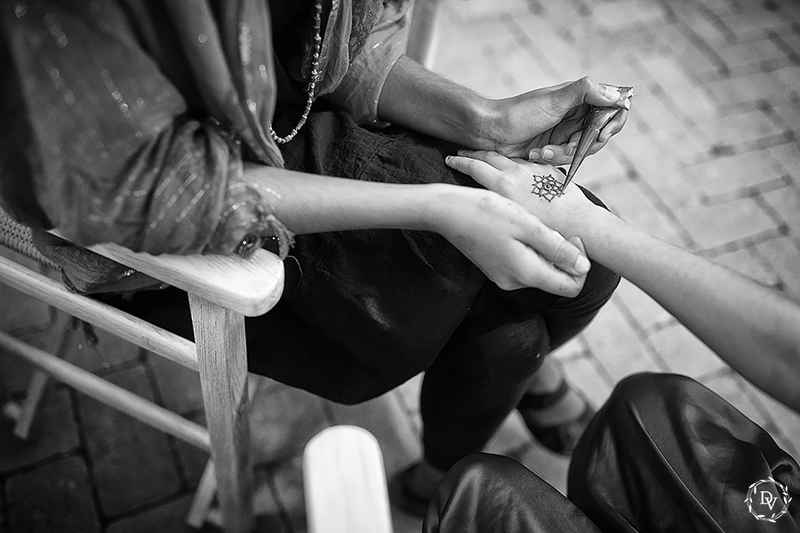 Ladies had the opportunity to have applied on their palms or back of hands Mehndi, that is an ancient form of body art. 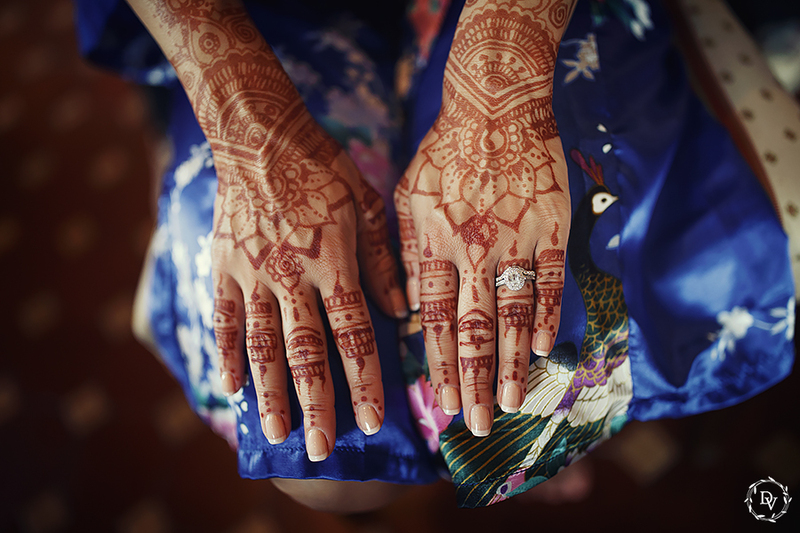 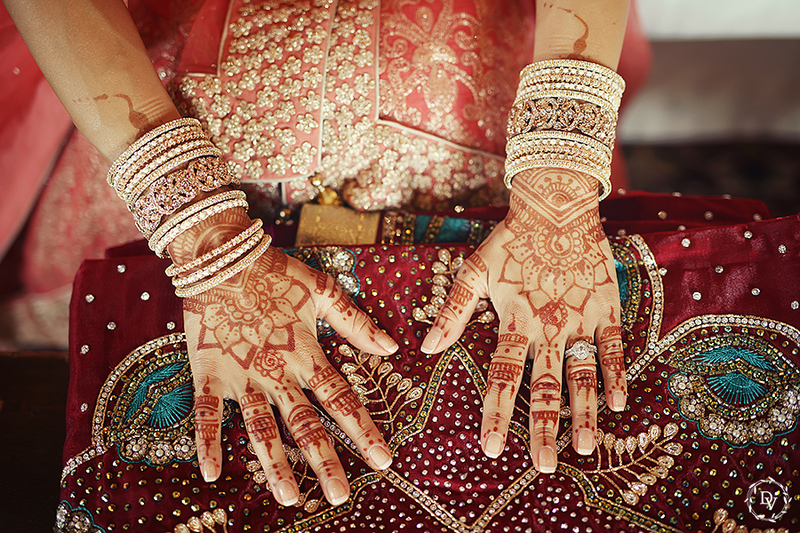 This is a tradition of Indian weddings and tradition says that the deeper the color of the bride’s mehndi, the happier the marriage will be. 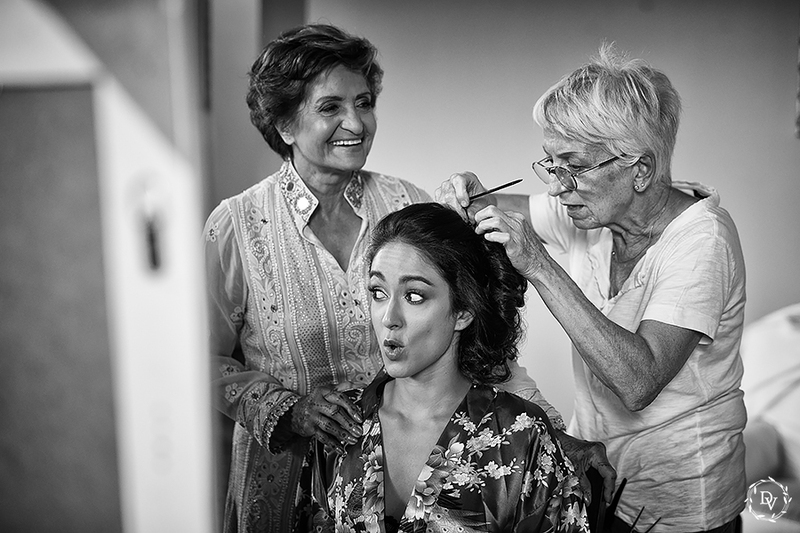 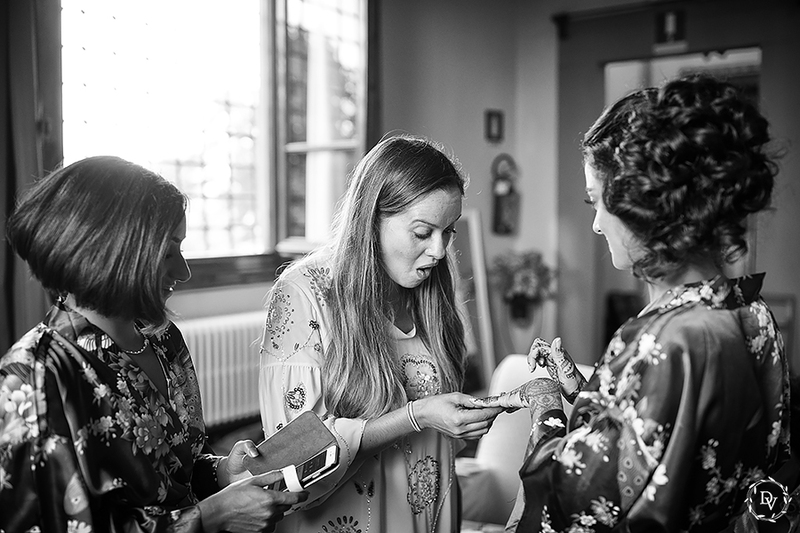 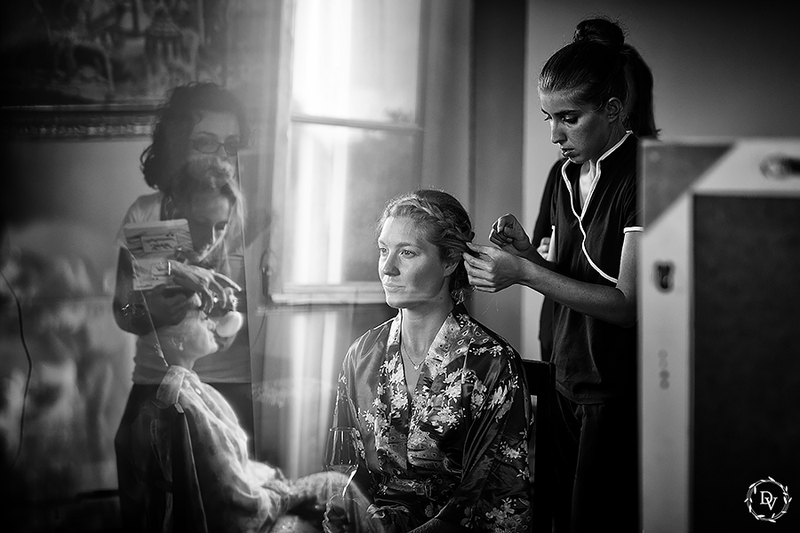 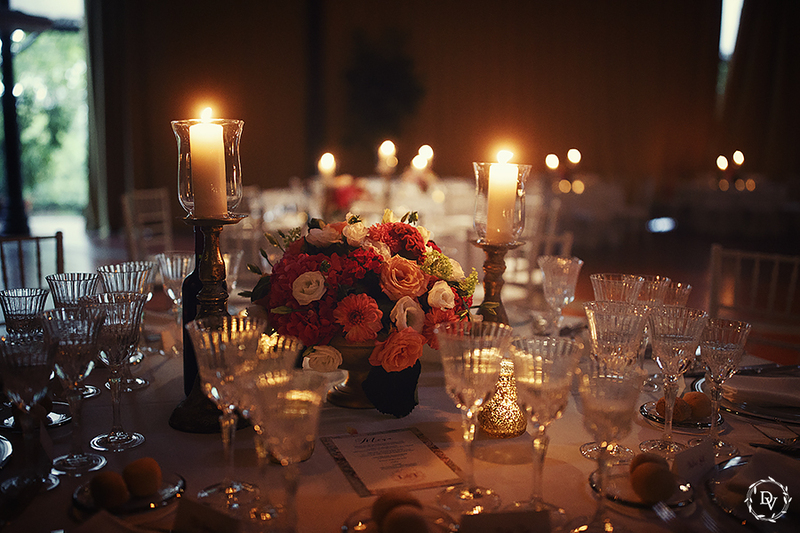 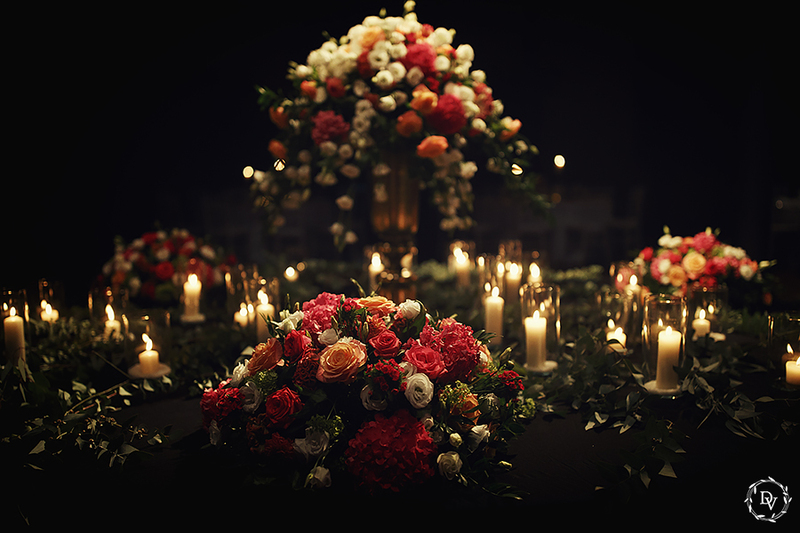 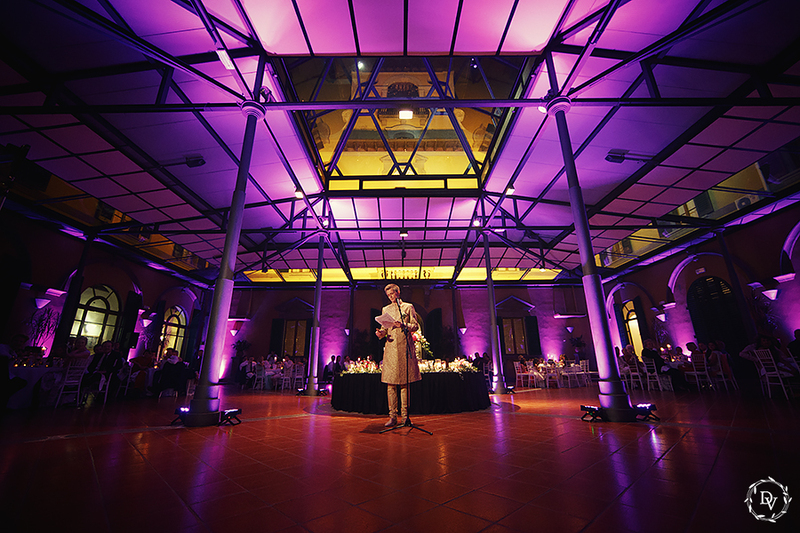 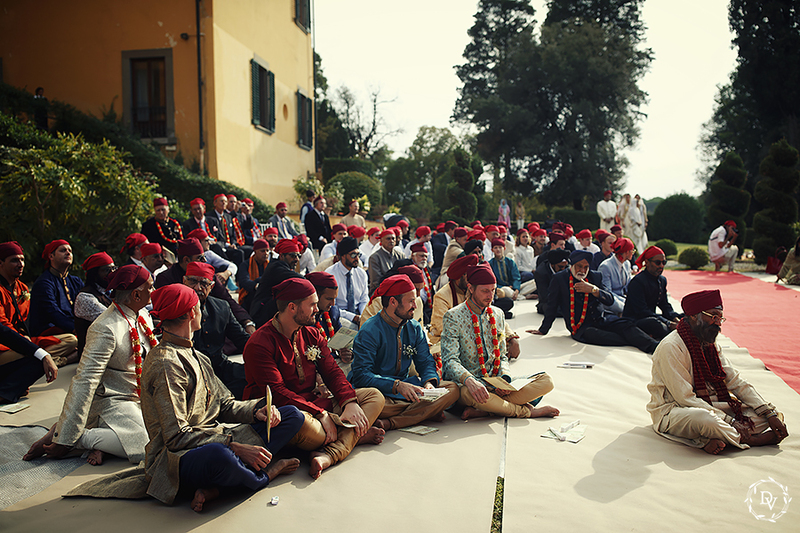 The wedding day, was a busy day, with a lot of colorful ceremonies. 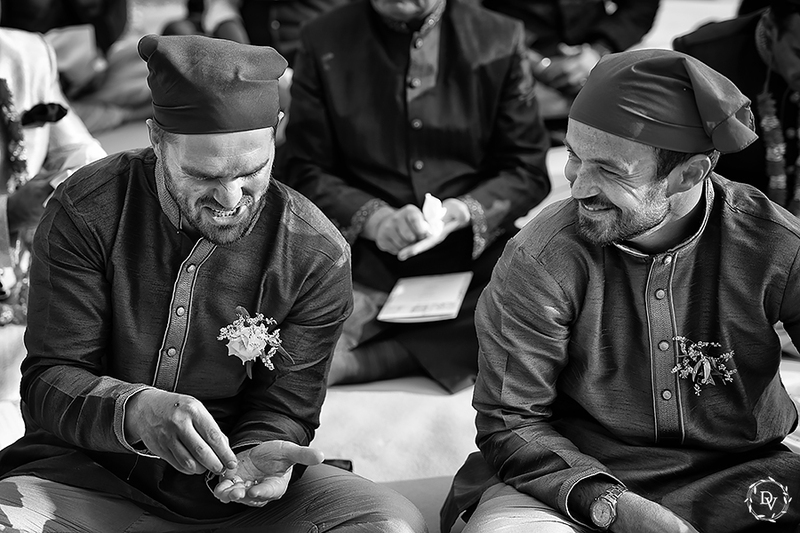 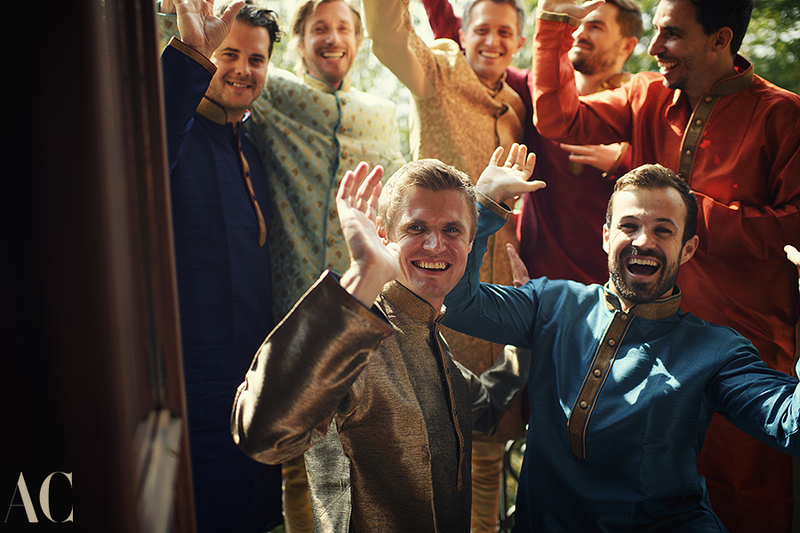 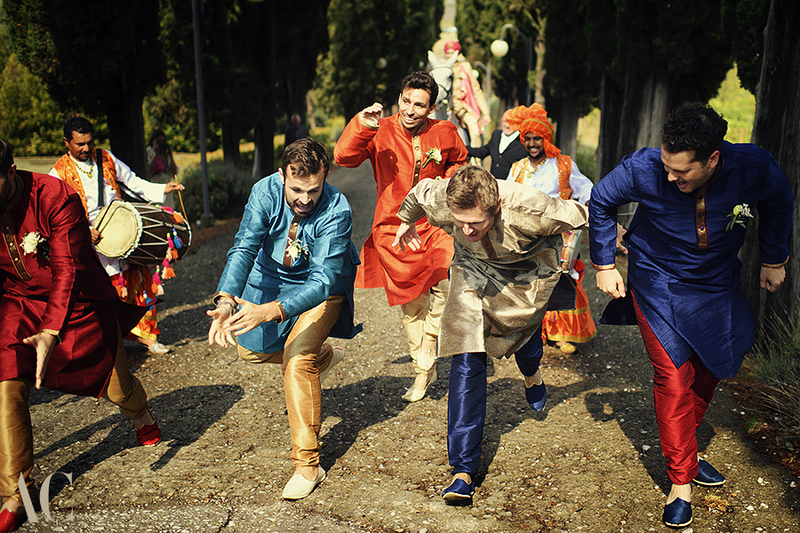 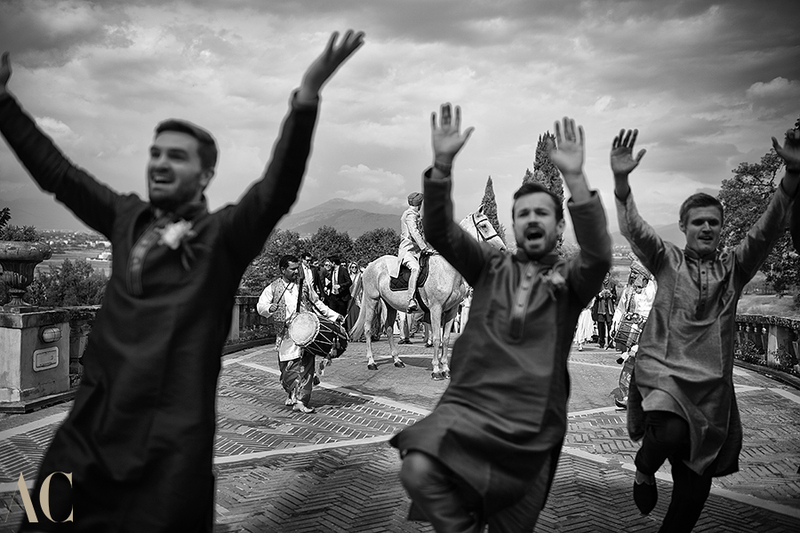 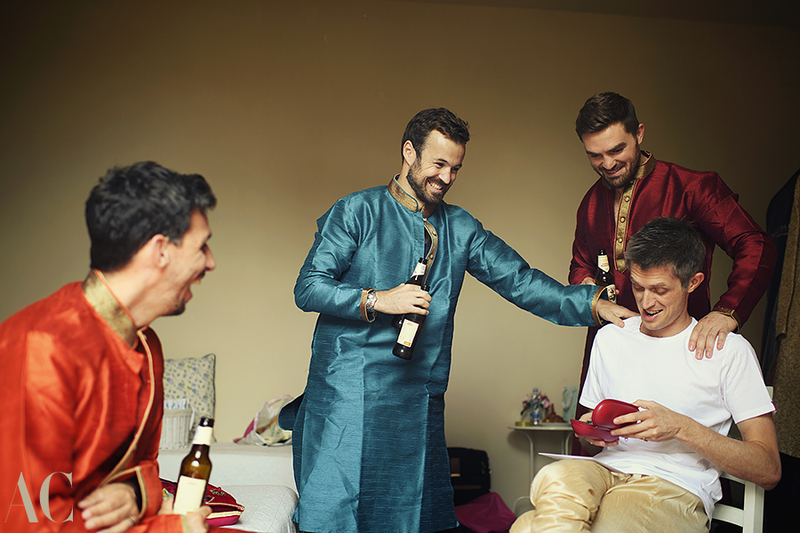 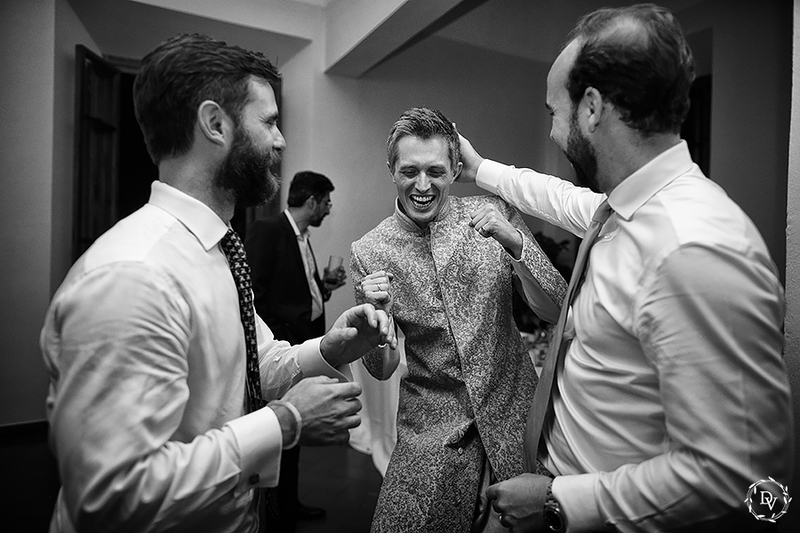 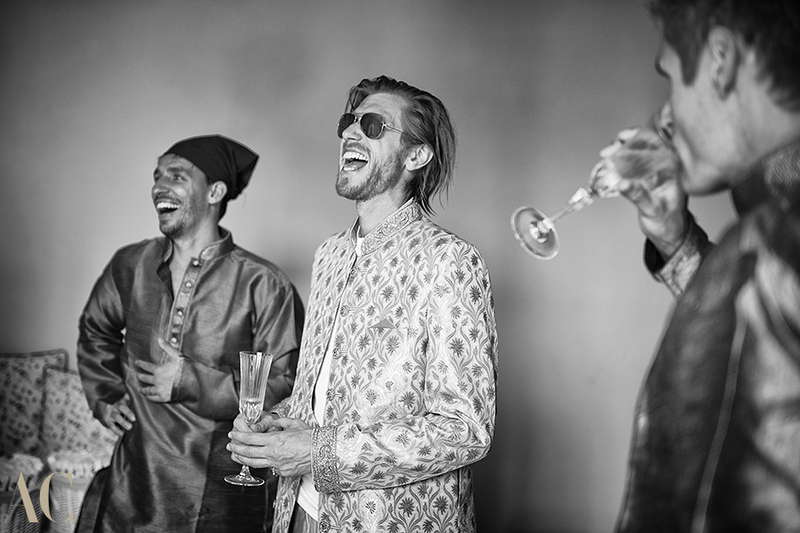 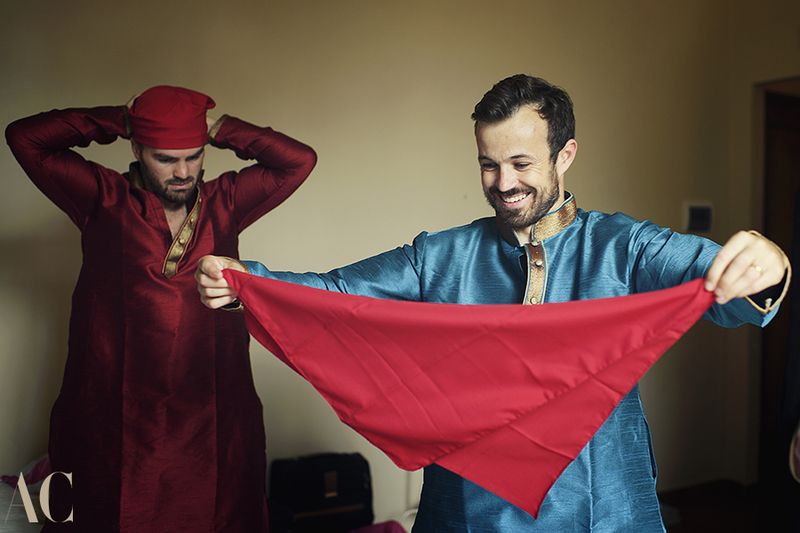 The first rite was the Baarat, this is the groom’s wedding procession and is one of the most fun-filled traditions in an Indian wedding. 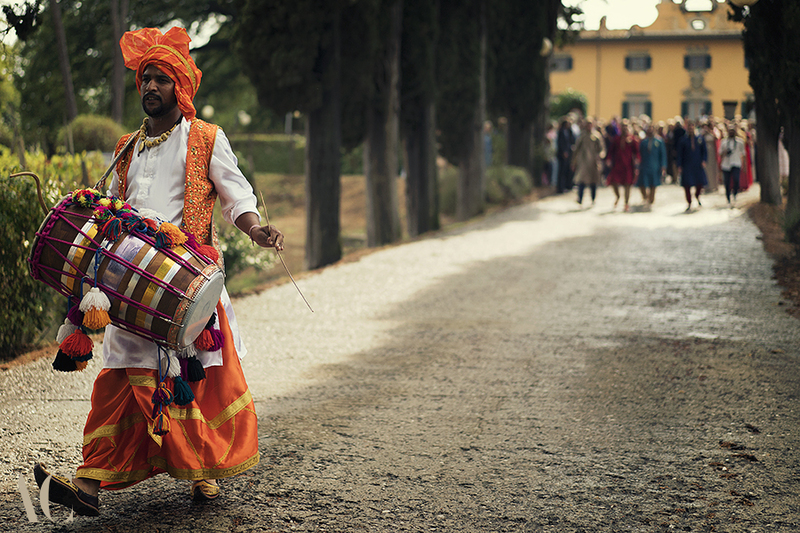 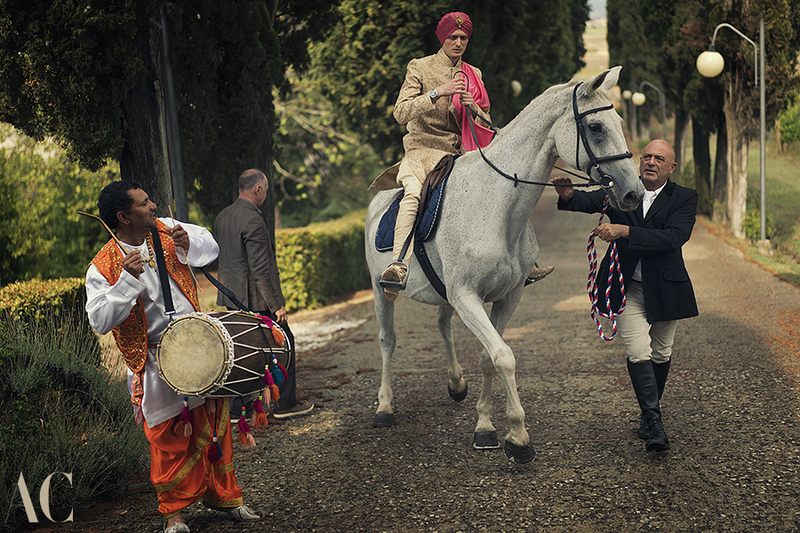 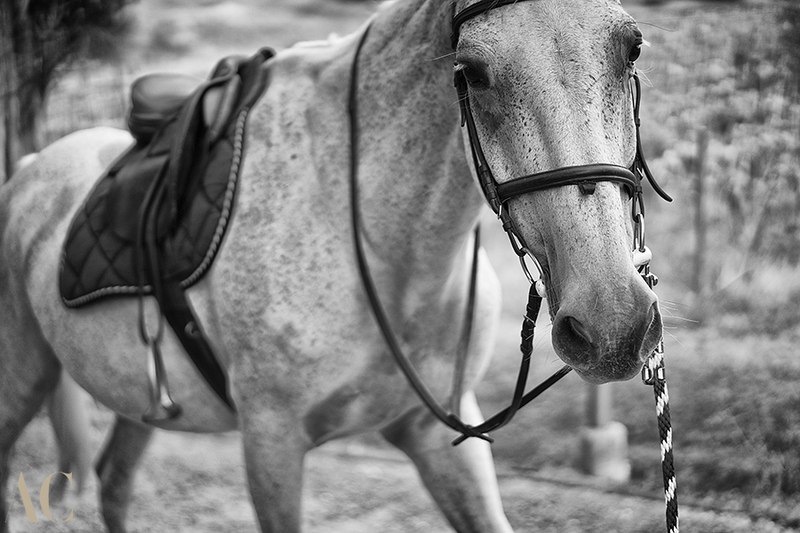 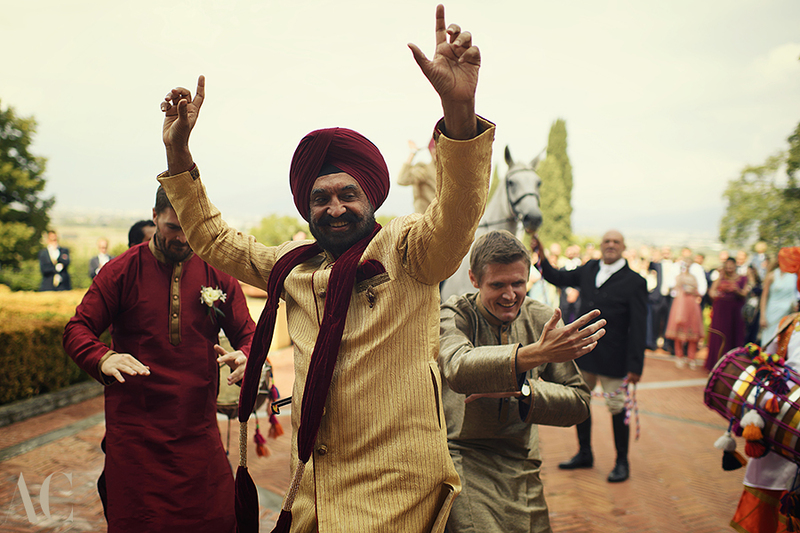 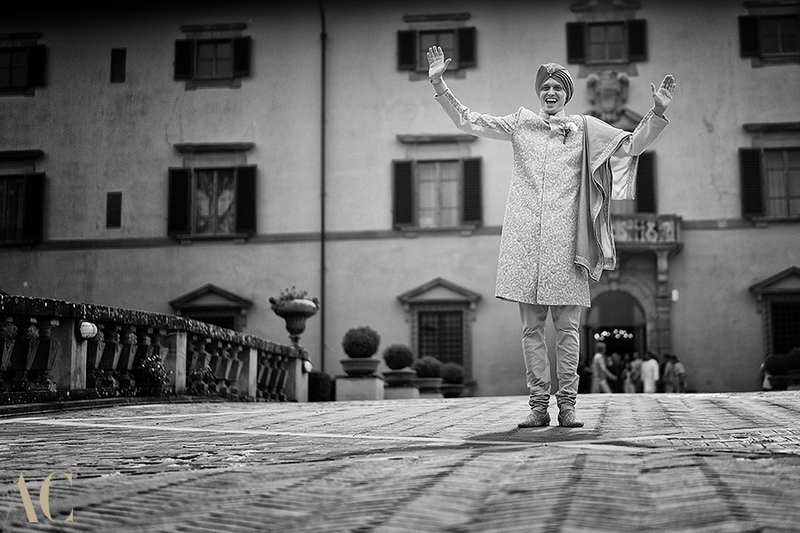 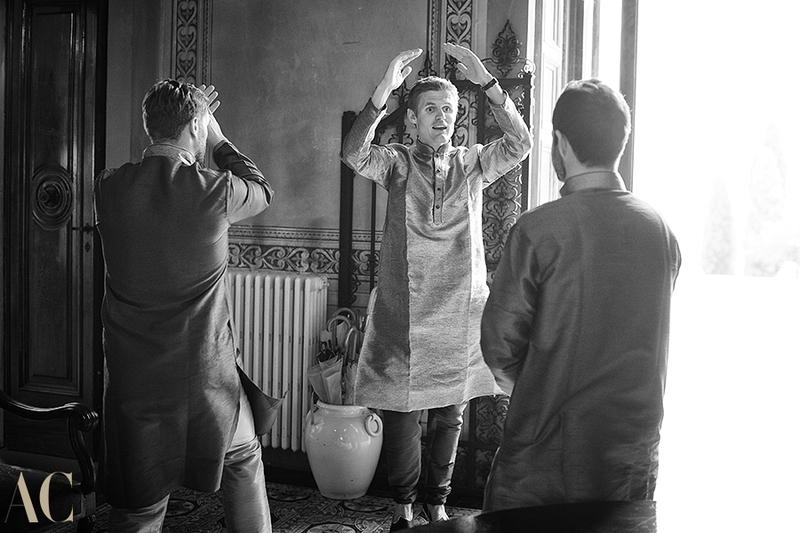 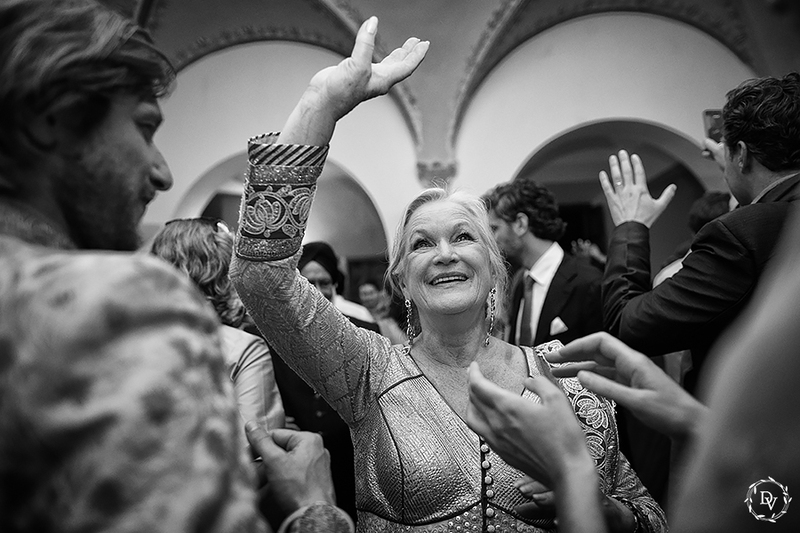 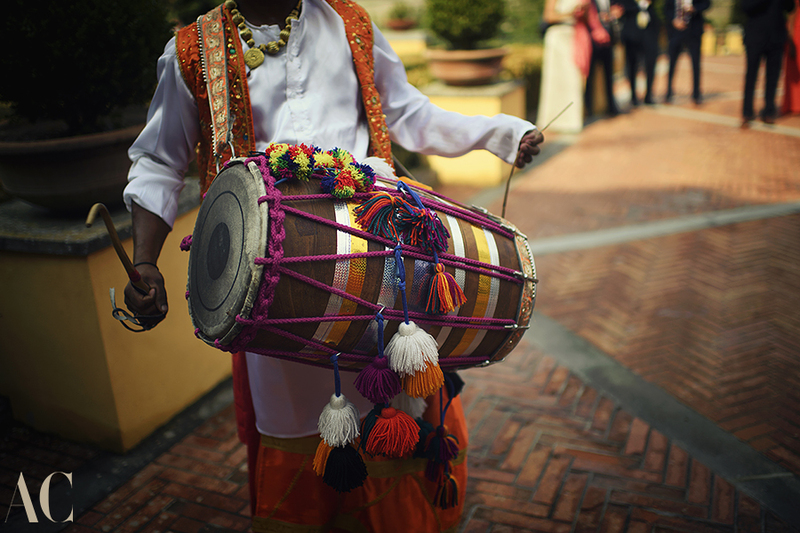 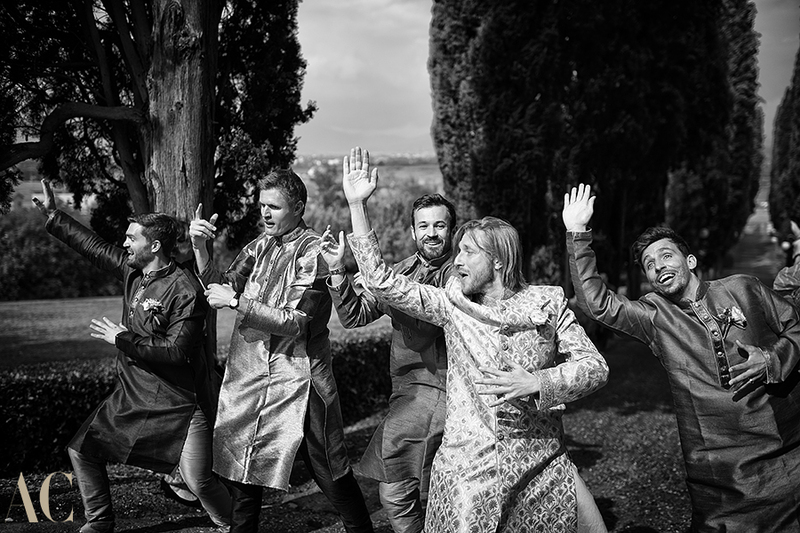 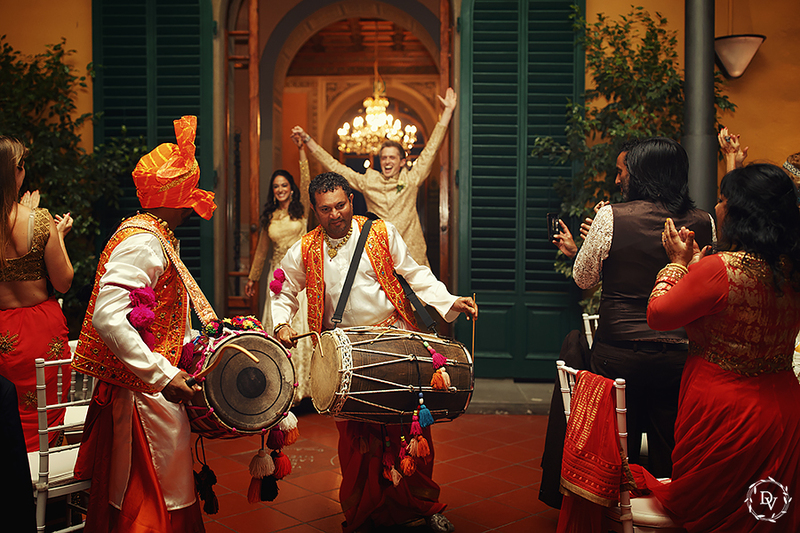 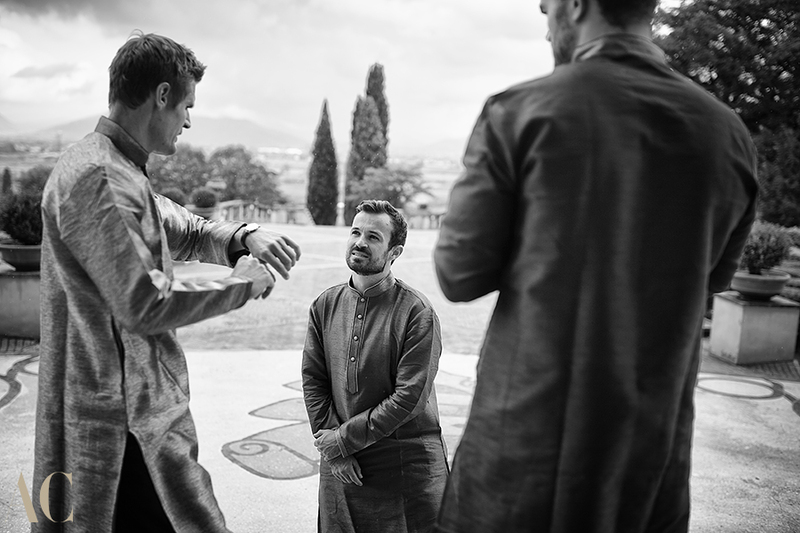 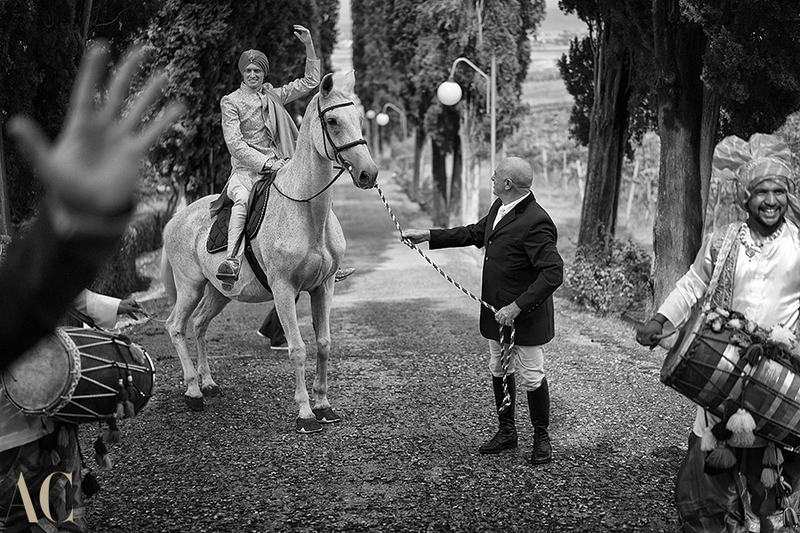 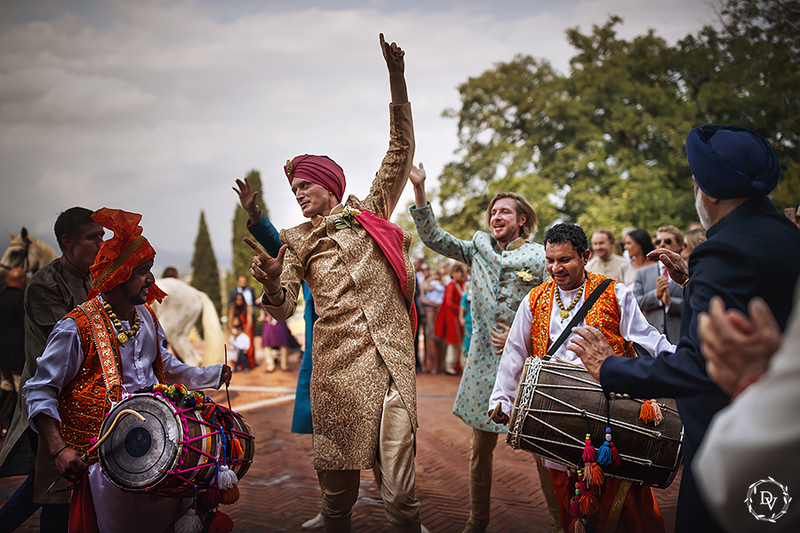 Leo arrived in front of Villa Castelletti riding a white horse, and his family dancing along with the dhol players. 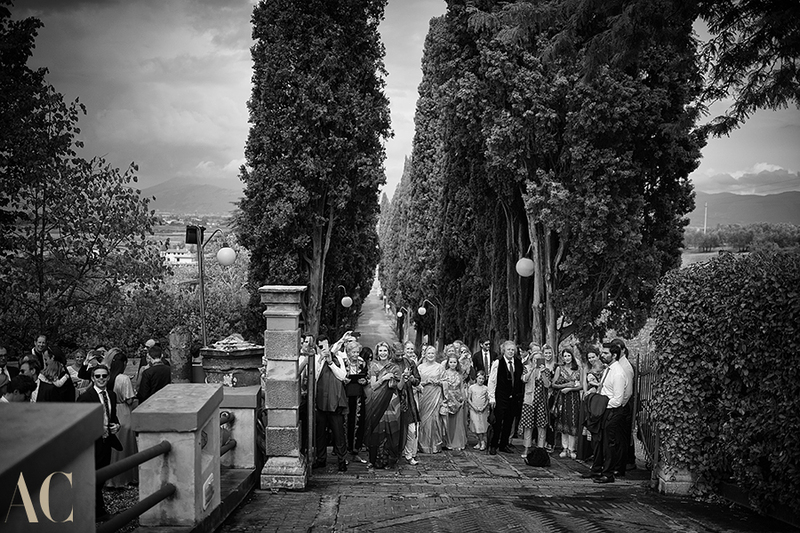 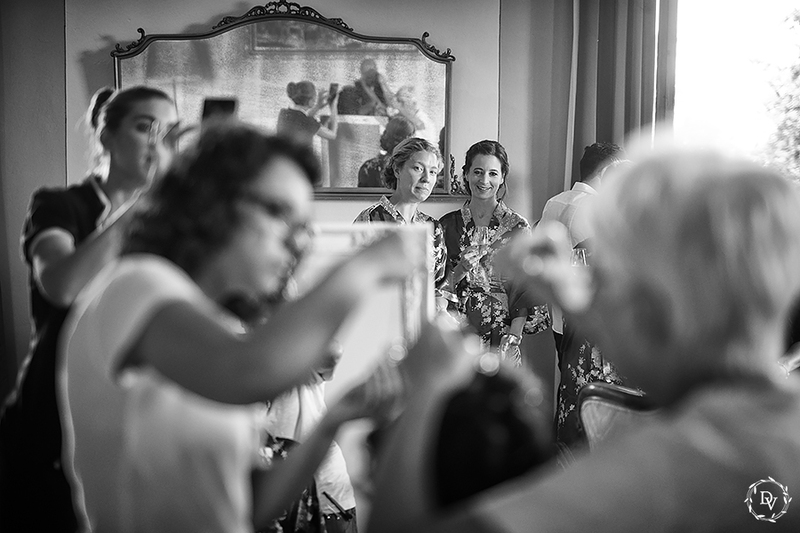 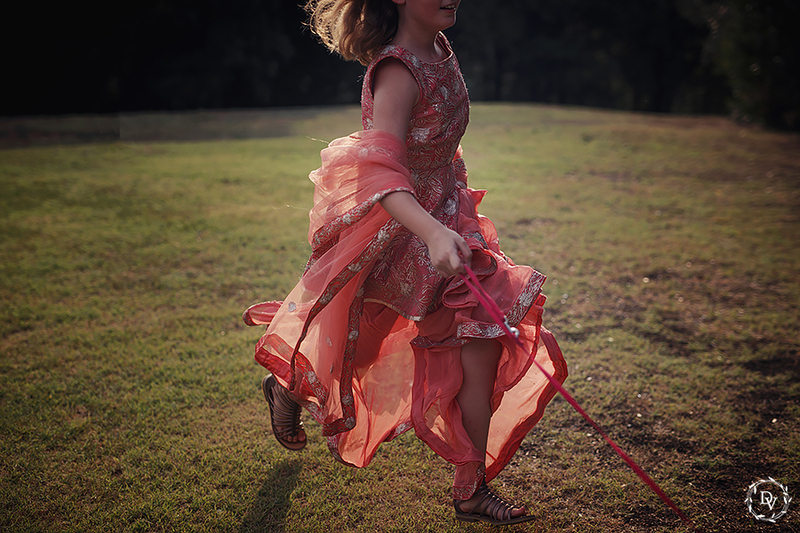 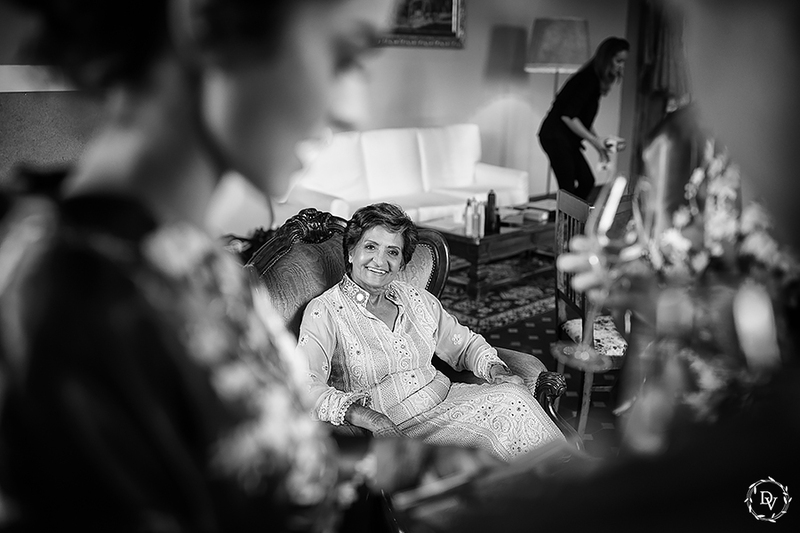 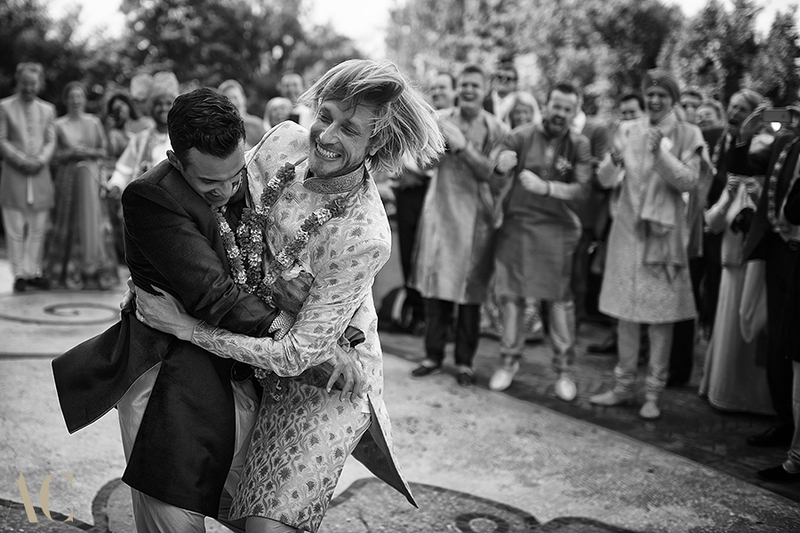 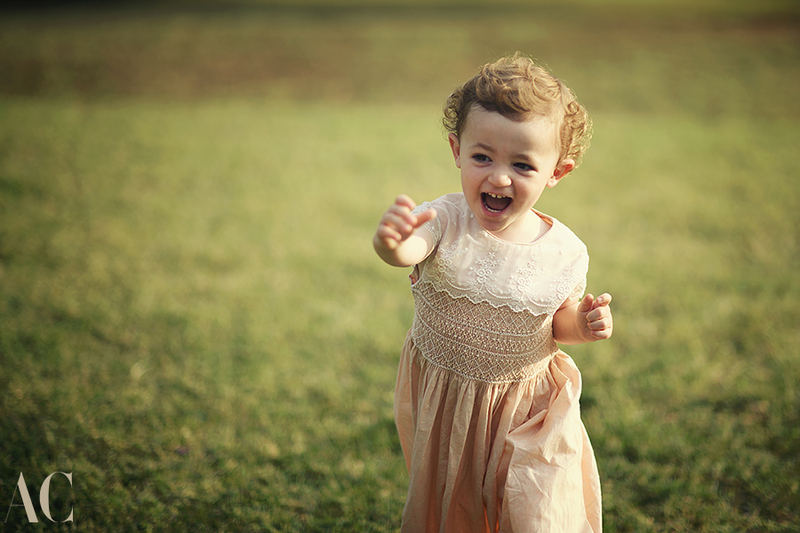 They met Tia’s family at the top of the driveway, and there another ceremony started: the Milni, that is an introduction to celebrate the alliance between the bride and groom’s families. 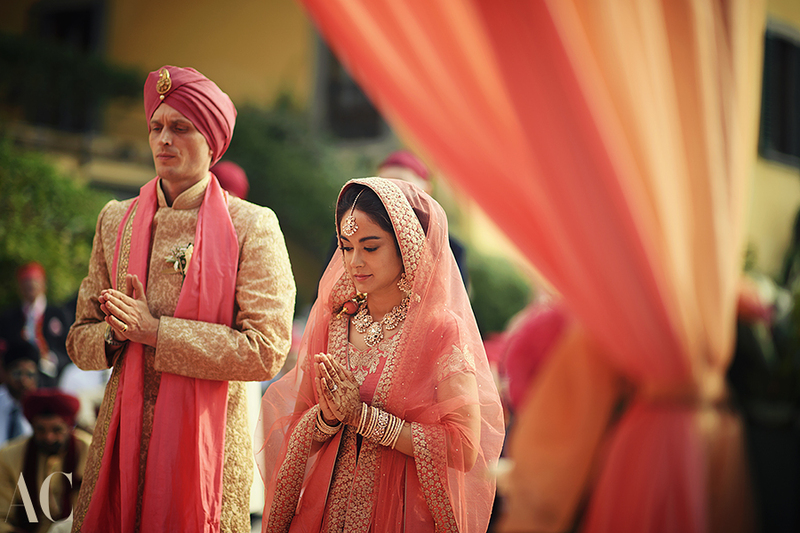 A short prayer was recited to bless the joining of the two families, then the father of the bride and the father of the groom exchanged flower garlands, afterward other key members of both families did the same. 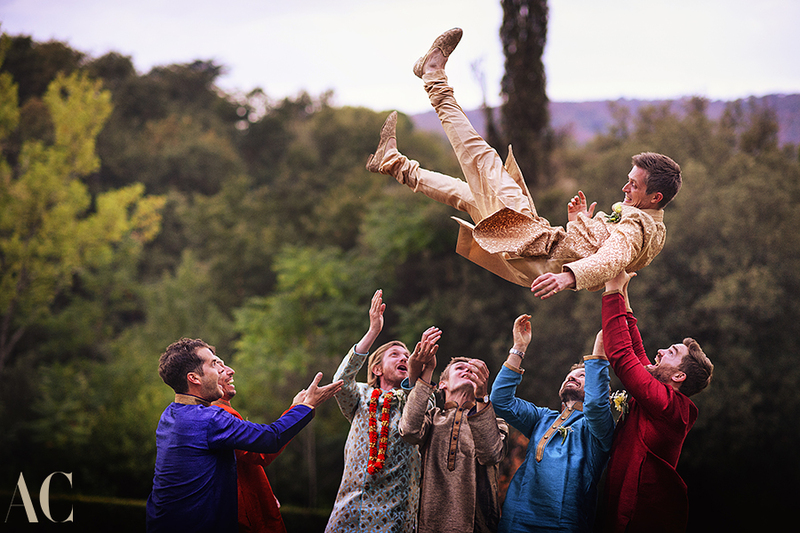 After the exchange, the two men hugged each other and then, with a friendly competition, they tried to lift each other off the ground. 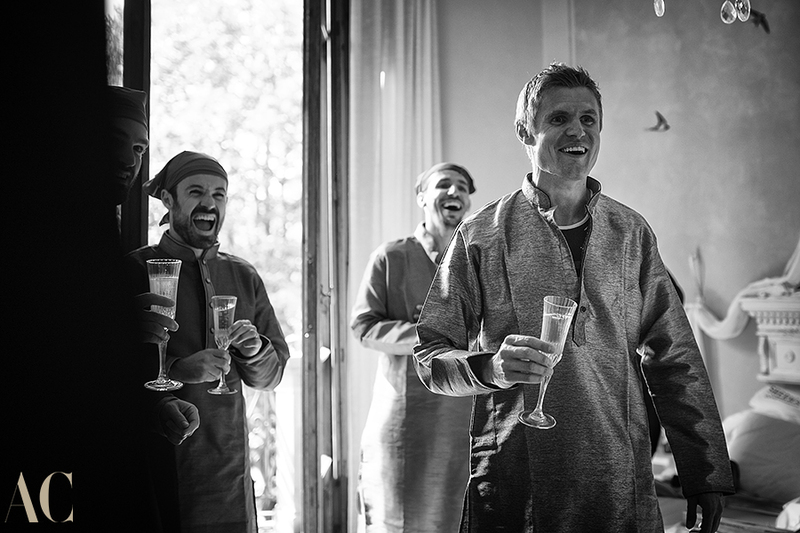 After the Milni guests proceeded to the Ceremony Area in the back of the villa. 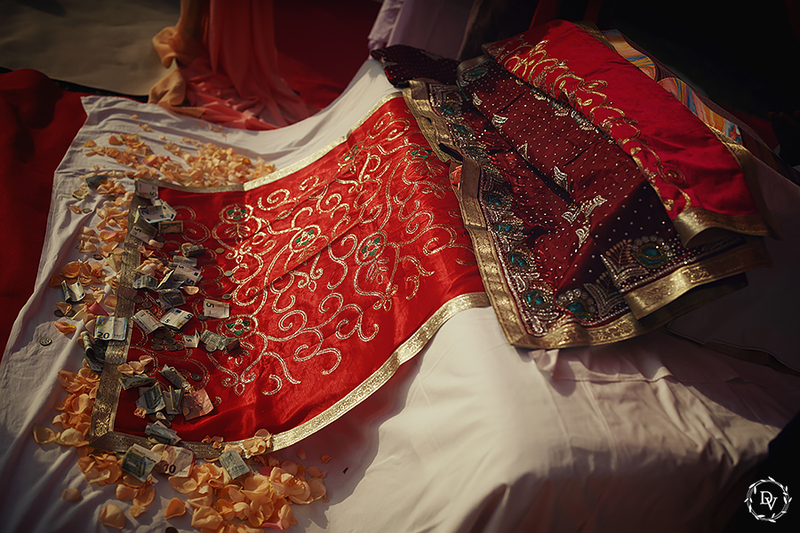 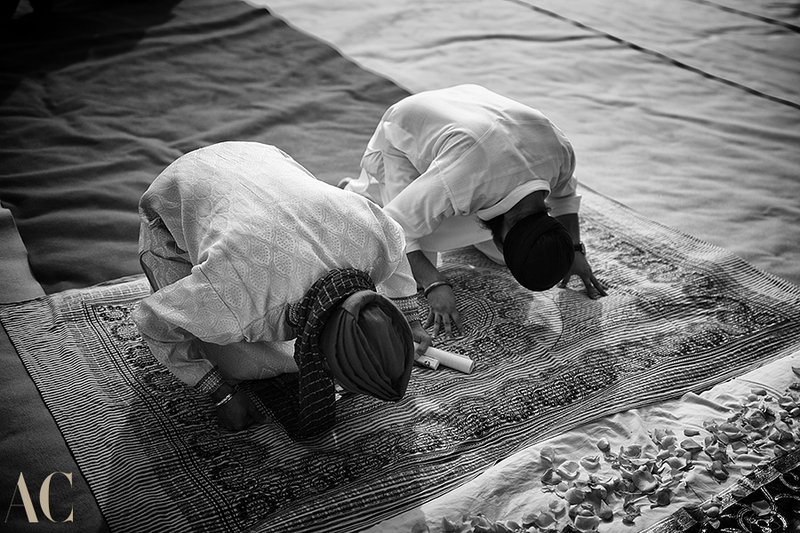 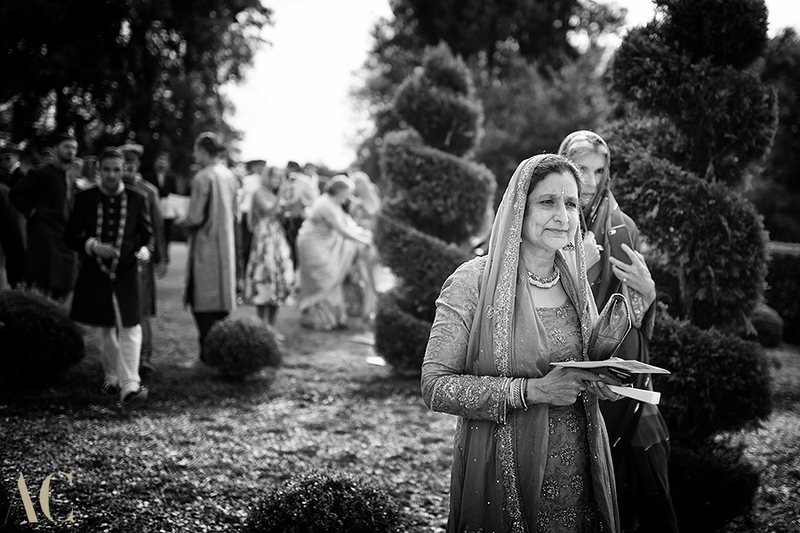 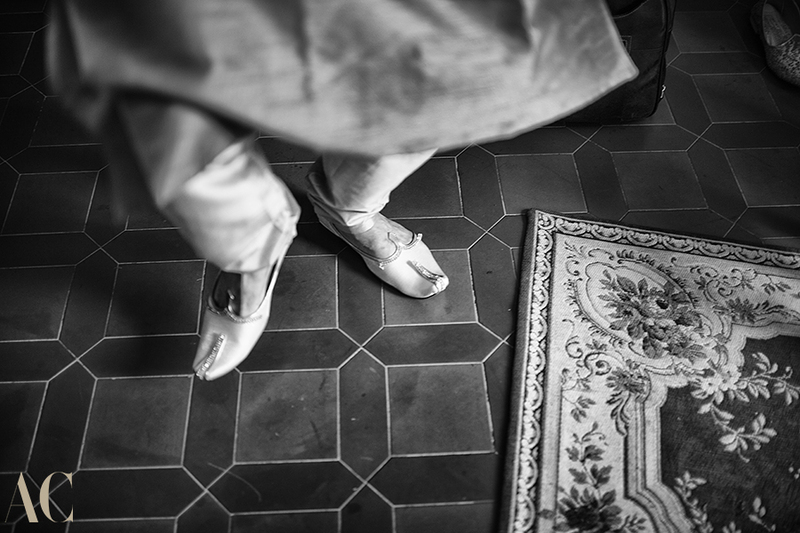 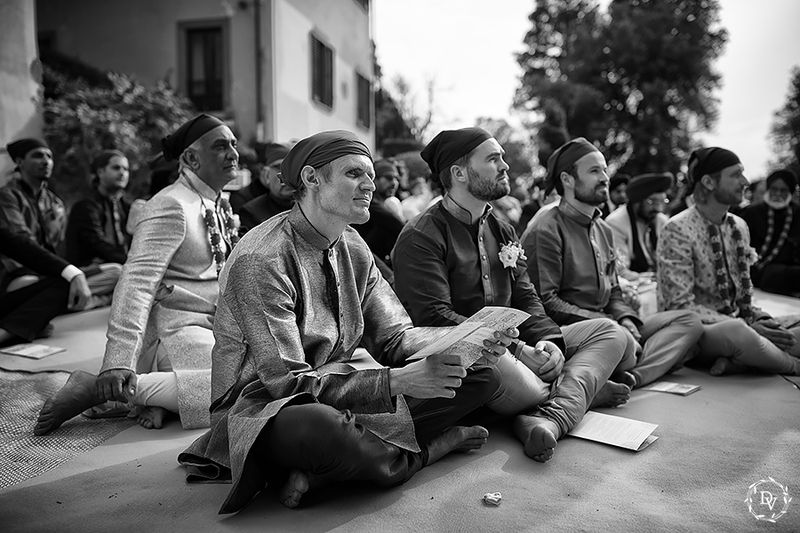 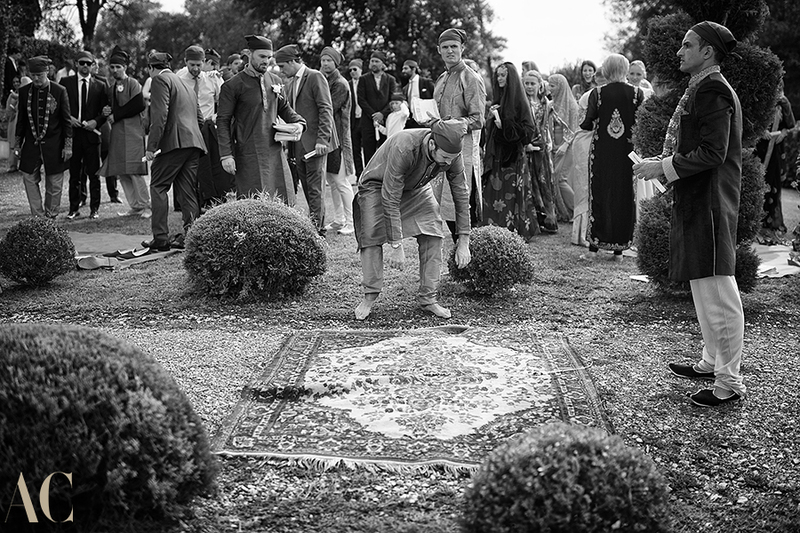 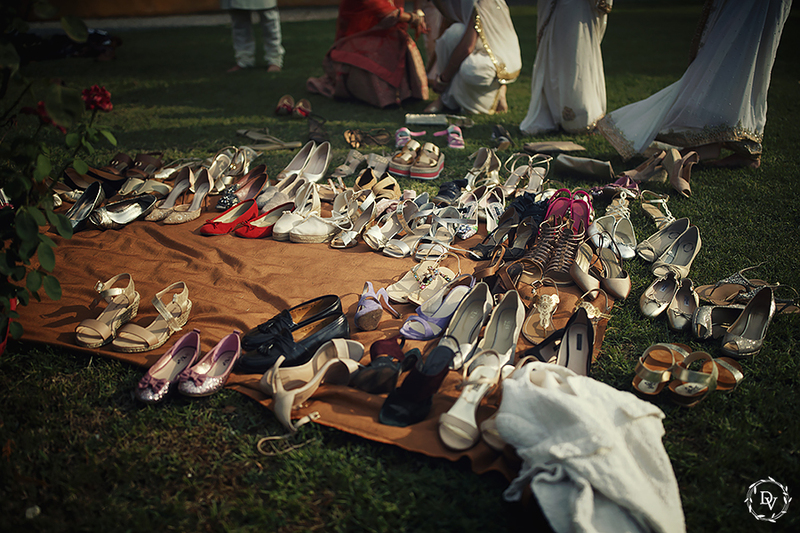 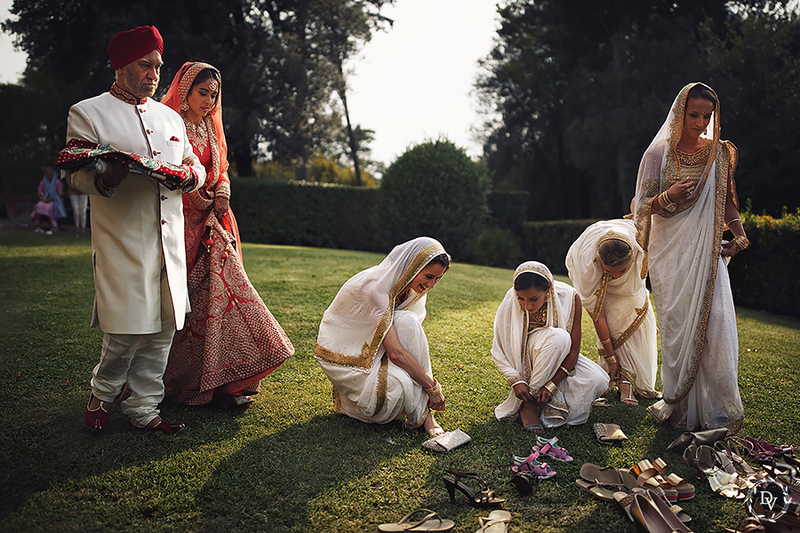 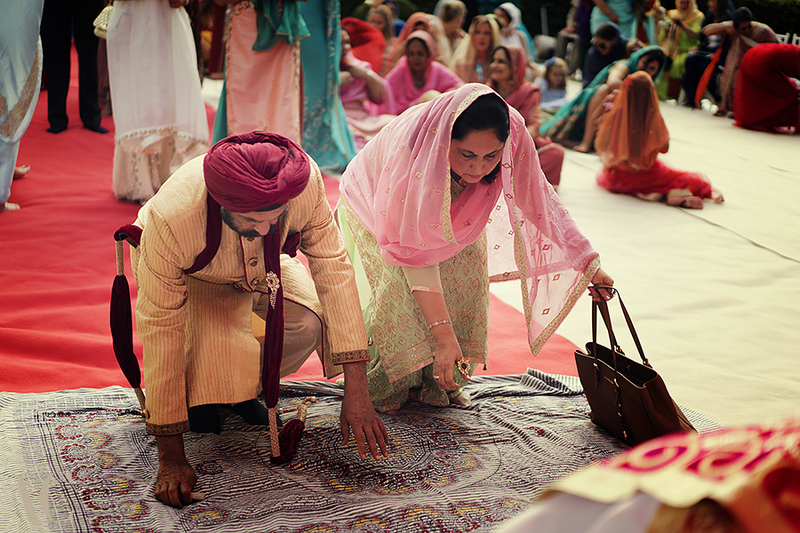 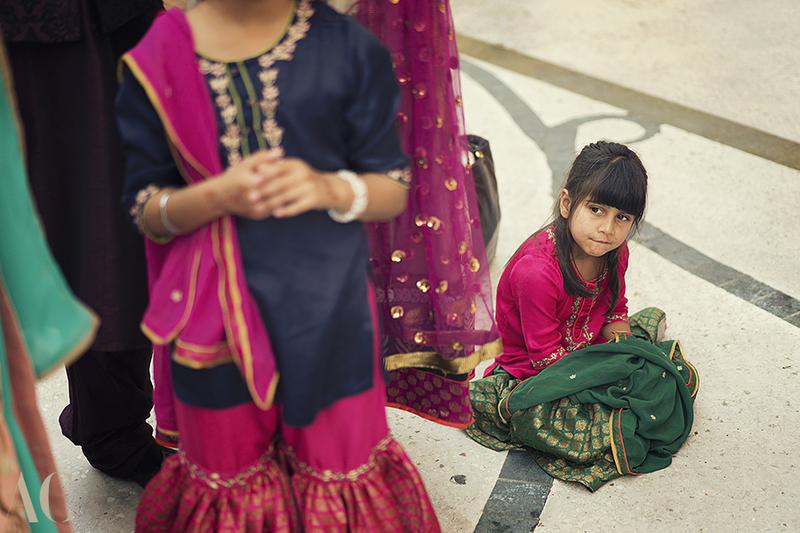 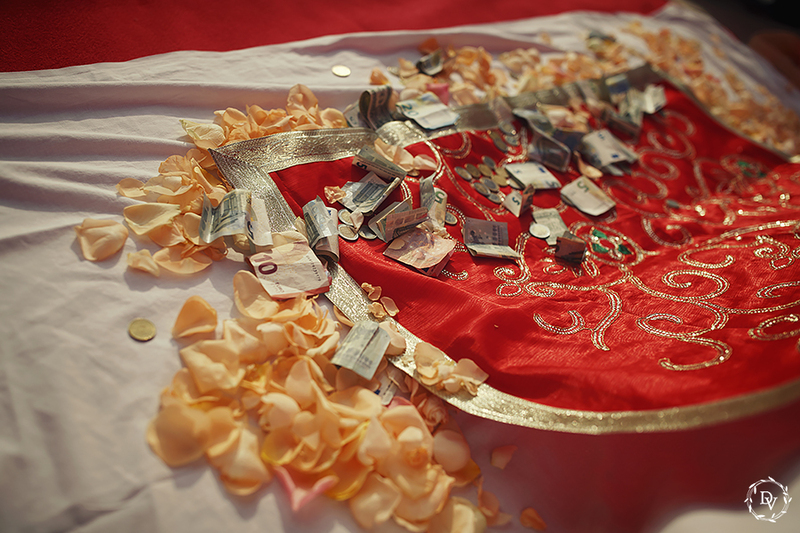 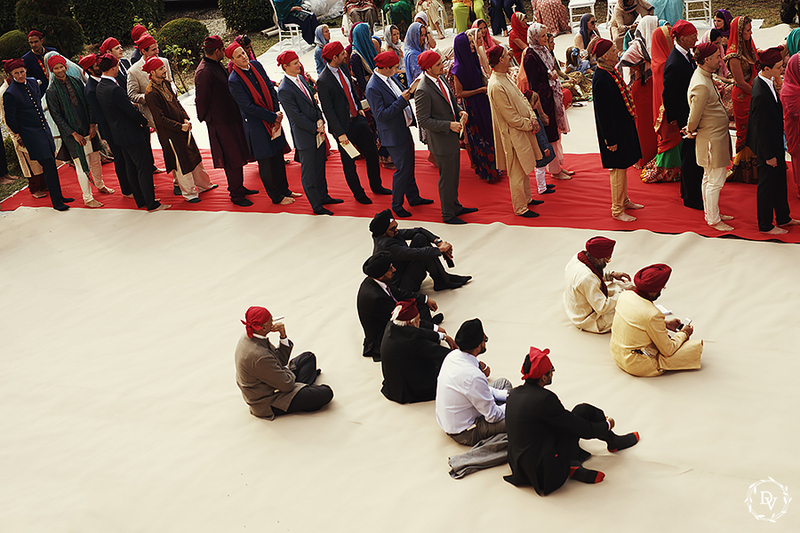 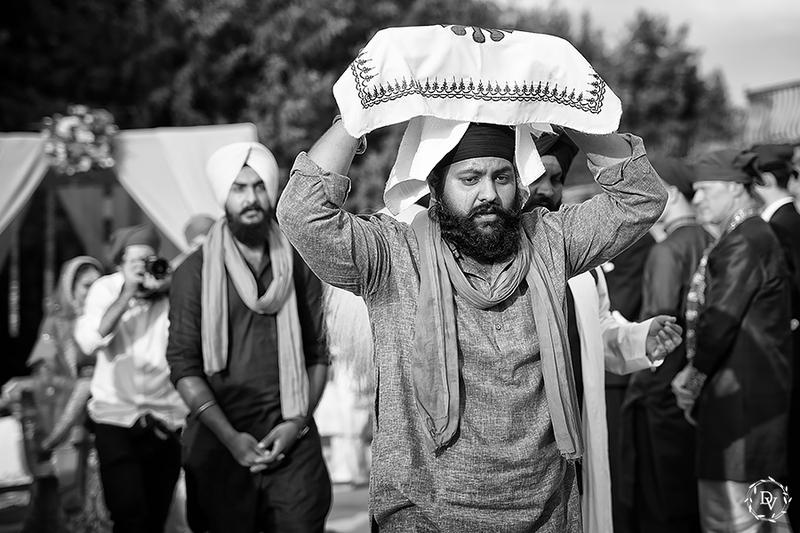 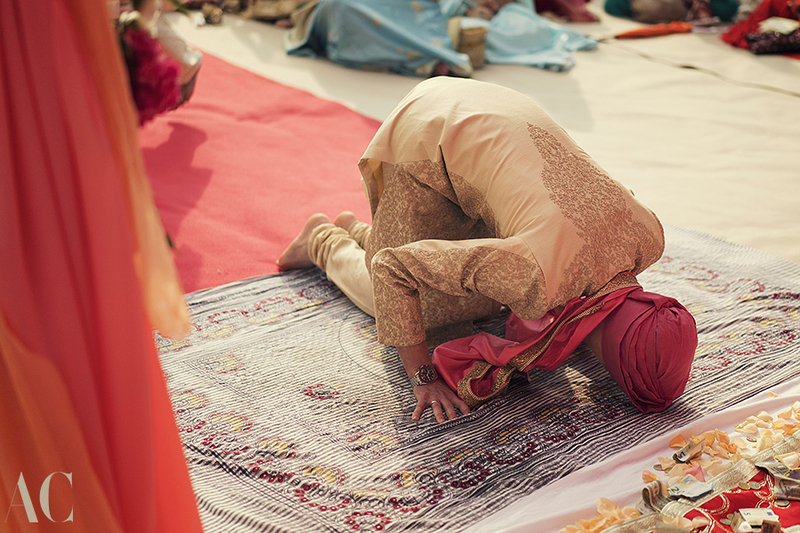 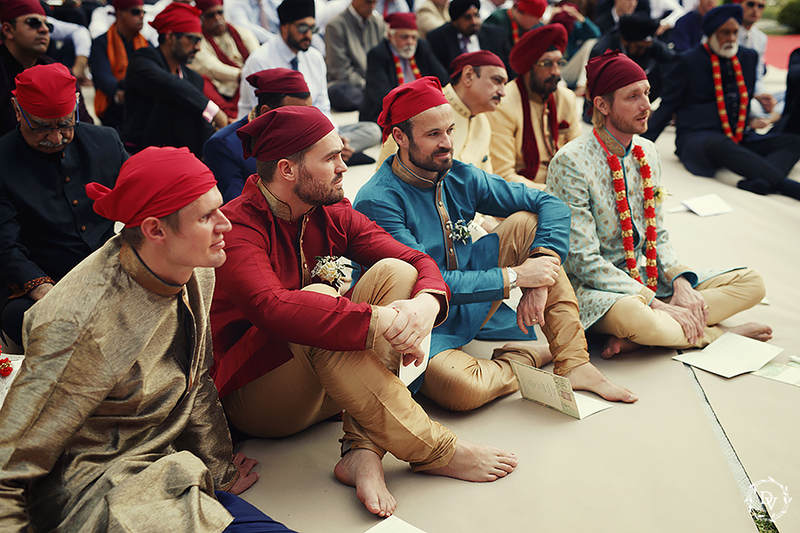 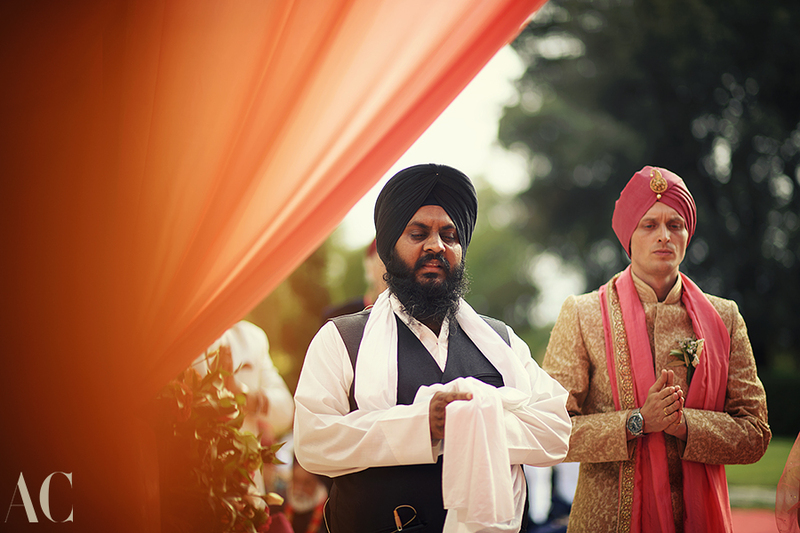 When entering the ceremony area, guests had to take off their shoes and cover their head, as a sign of respect, they all walked in line towards the Guru Granth Sahib (the Sikh holy scripture and living Guru) and knelt and then bowed down touching the floor with their forehead and they offered money placed in front of the Holy Scripture. 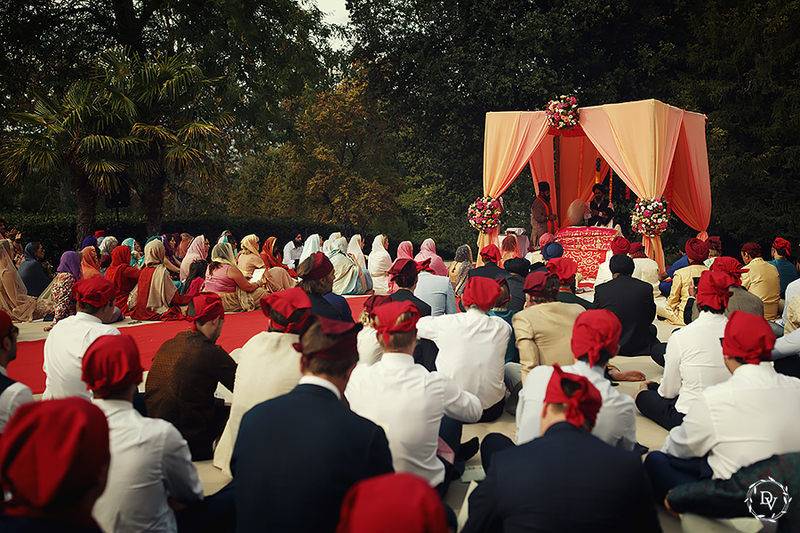 Everyone seated on the floor, to be humble in front of the Guru Granth Sahib. 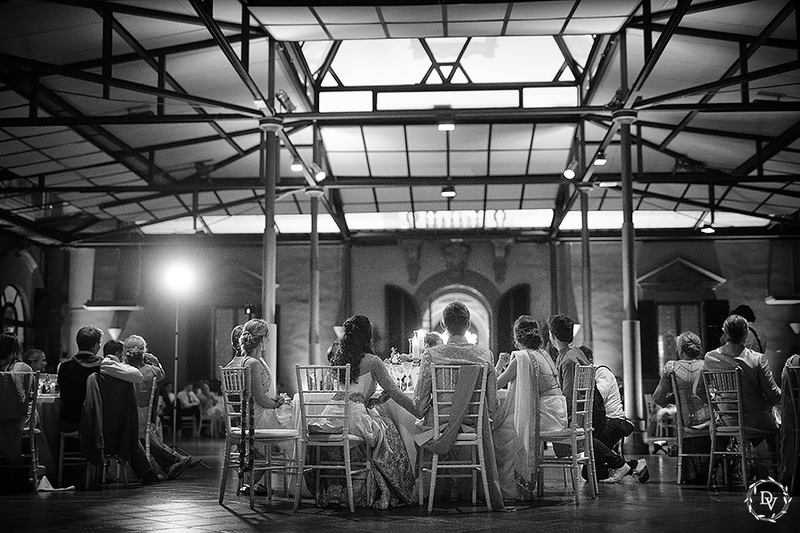 Women seated to the left and men to the right. 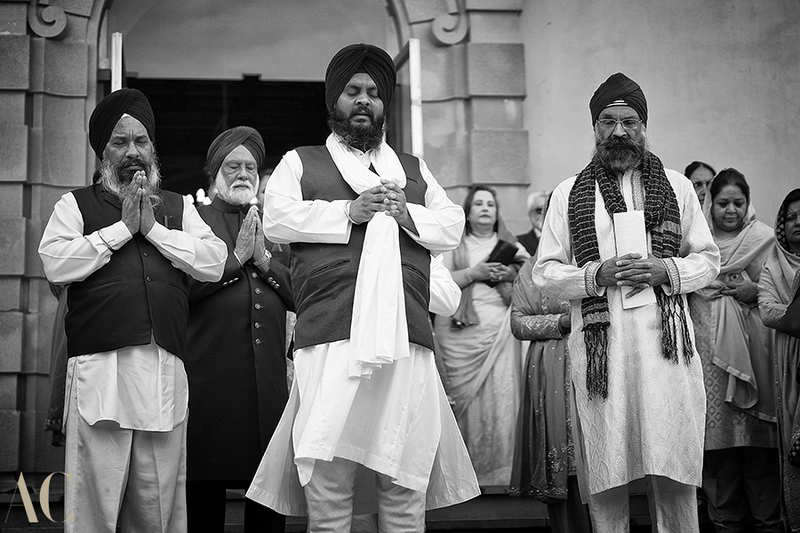 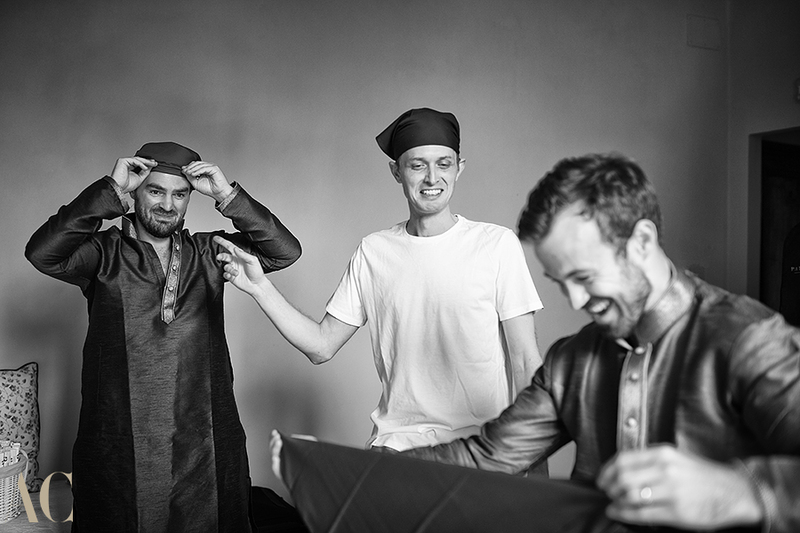 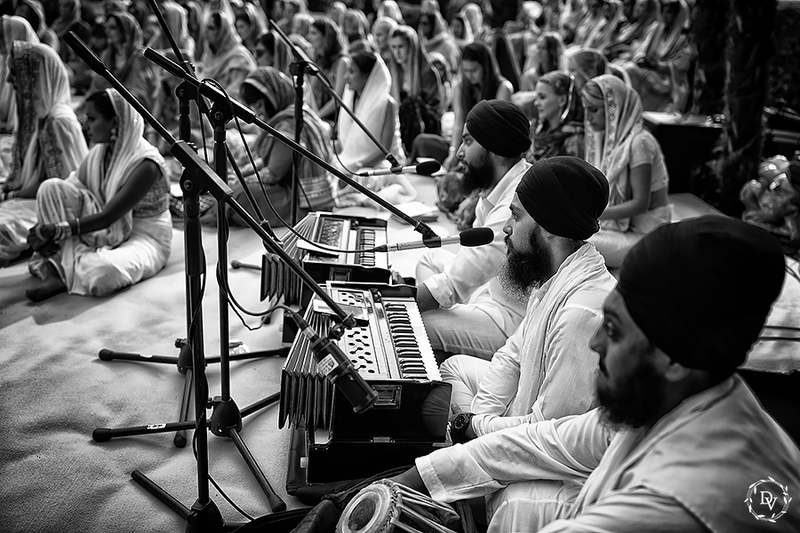 the Sikh singers. 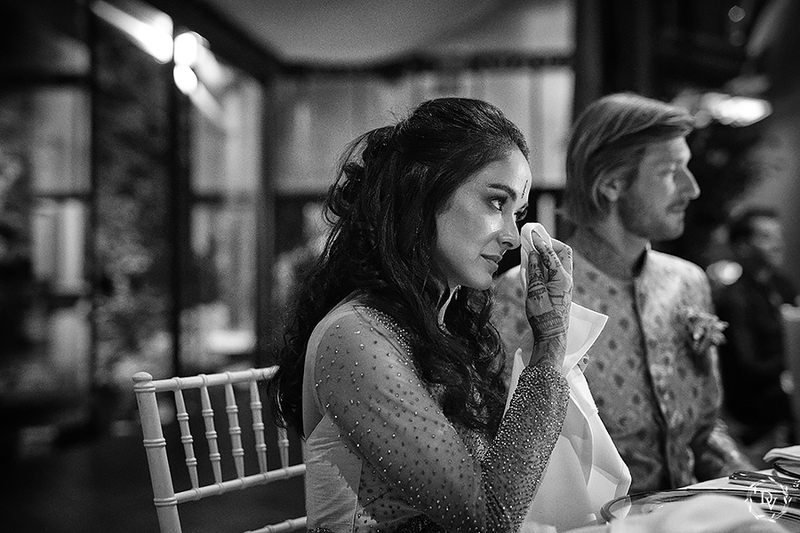 It was a very emotional moment! 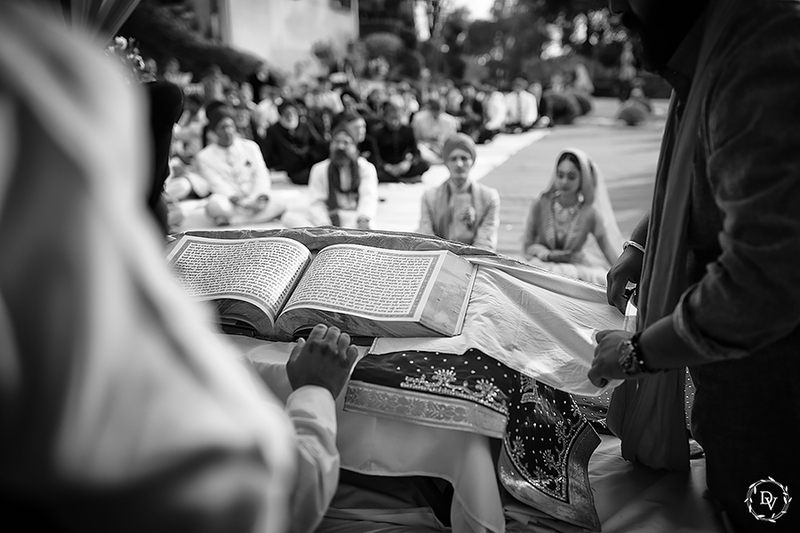 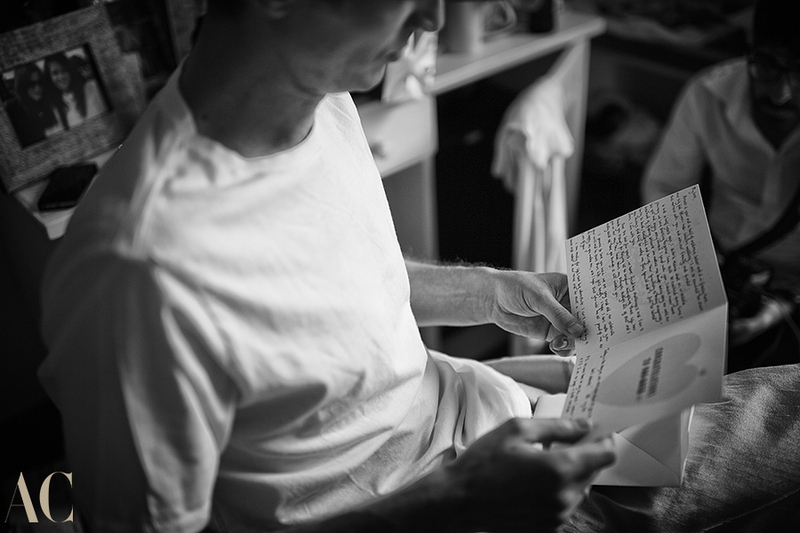 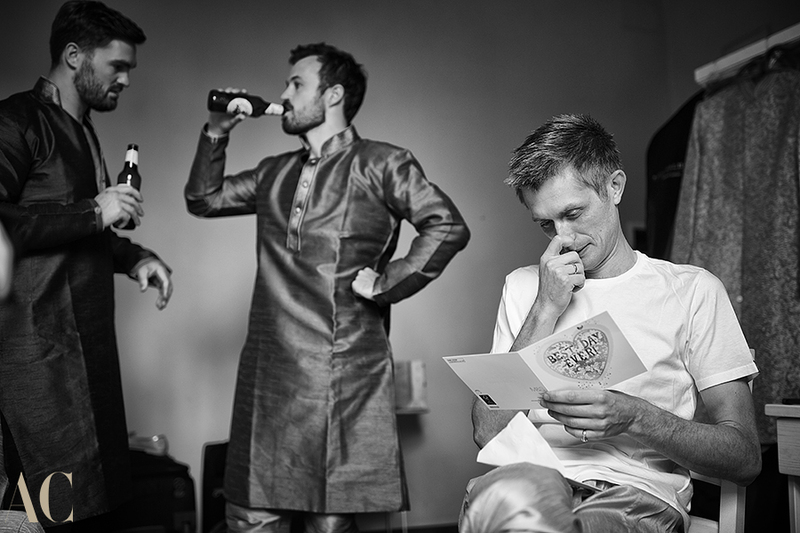 The groom appeared first and sat in front of the Holy book. 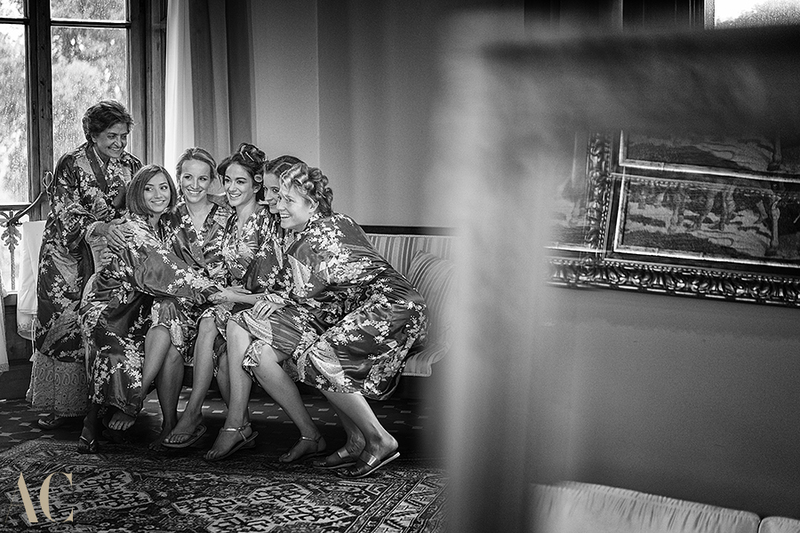 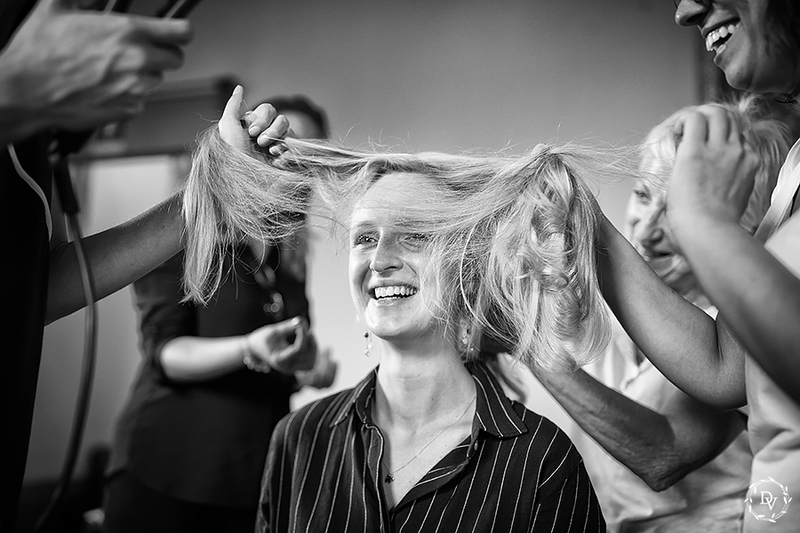 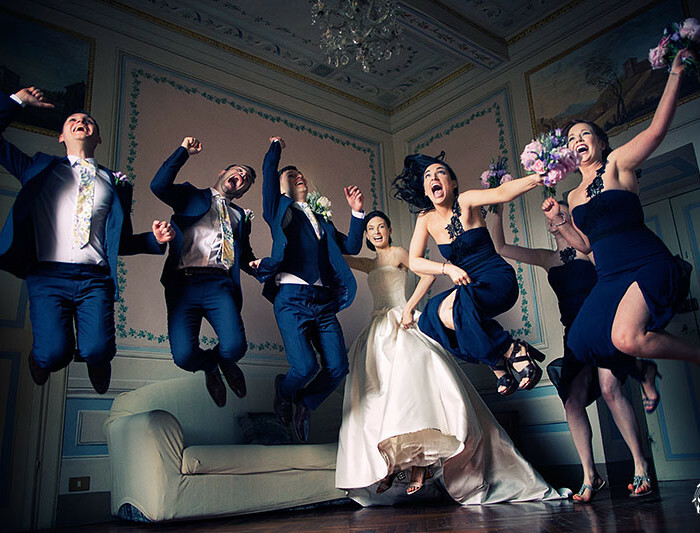 A while after, the bride entered with his dad and Bridesmaids and sat next to the groom, on his left. 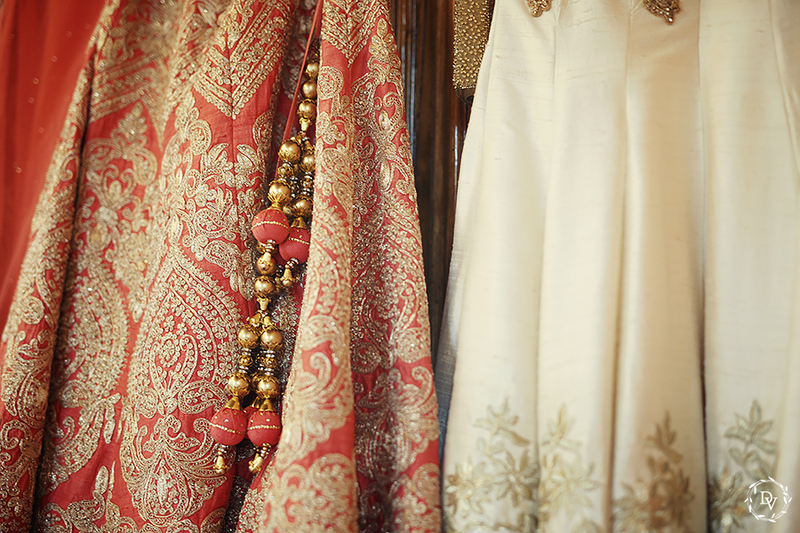 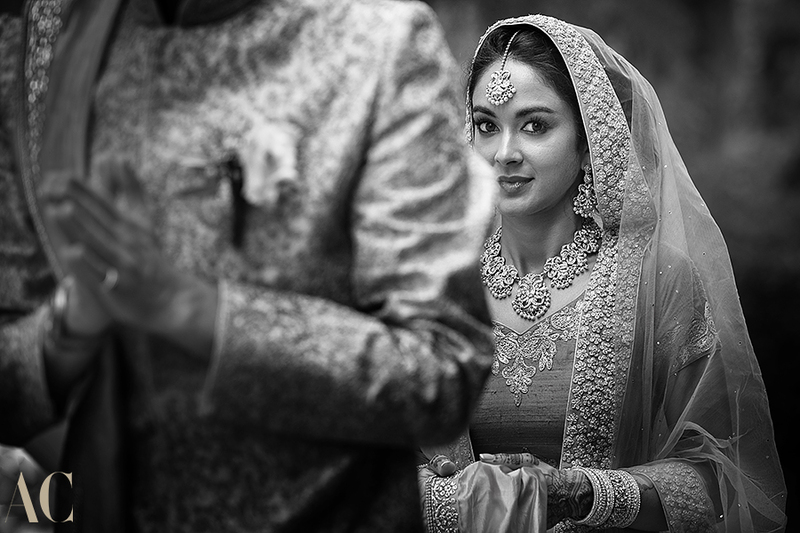 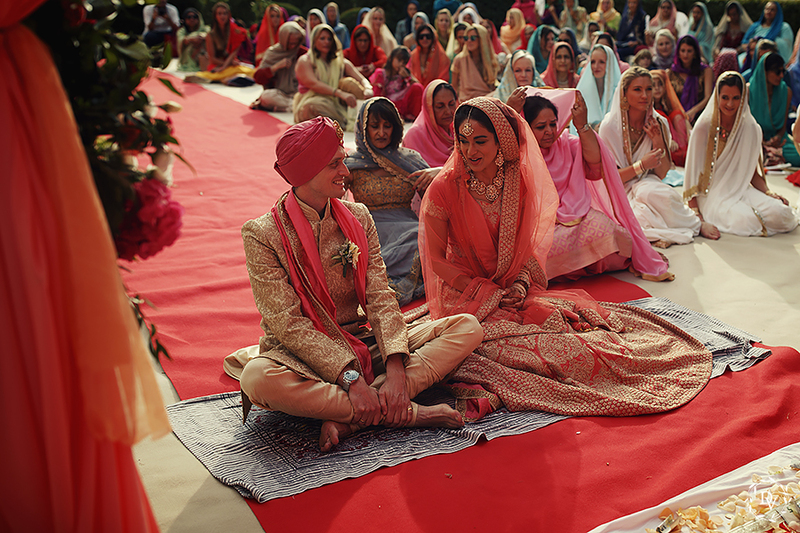 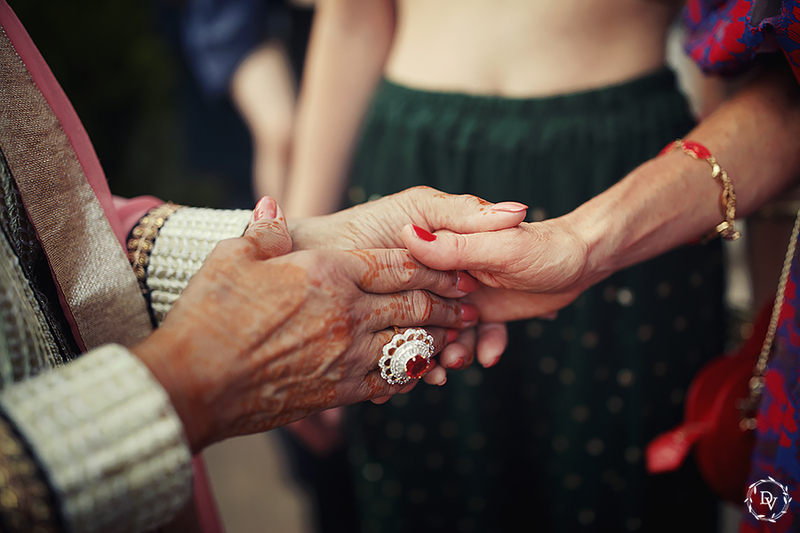 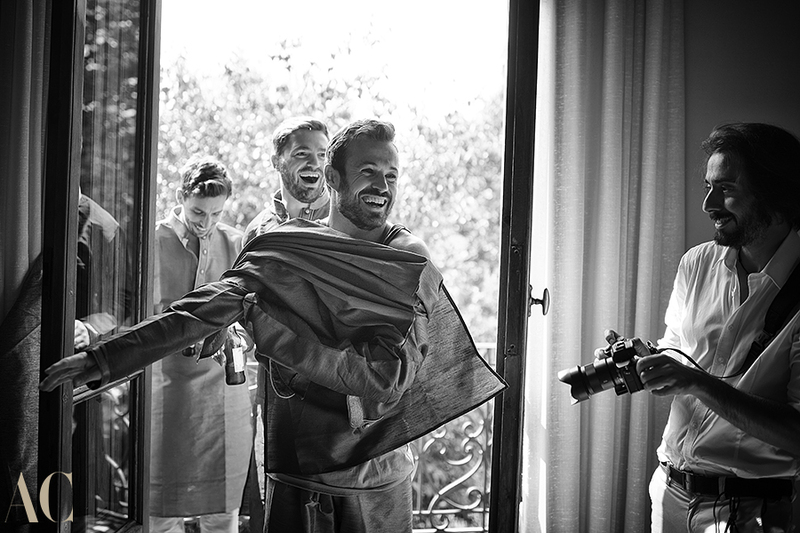 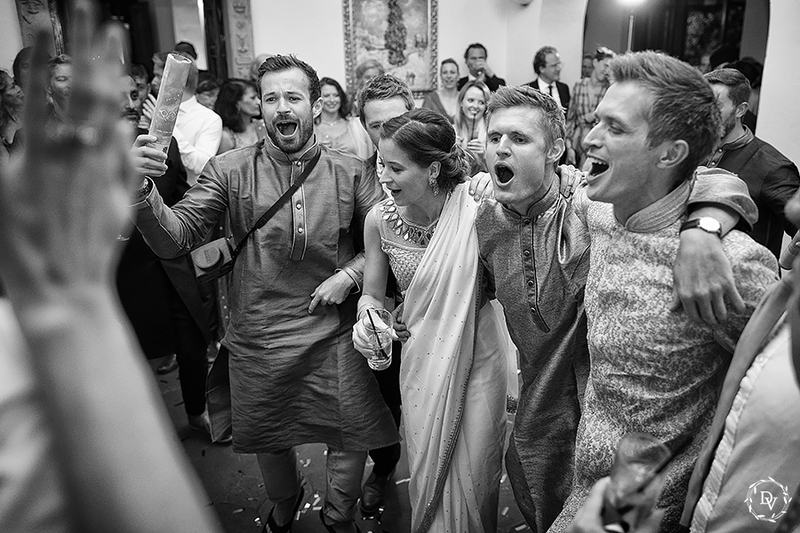 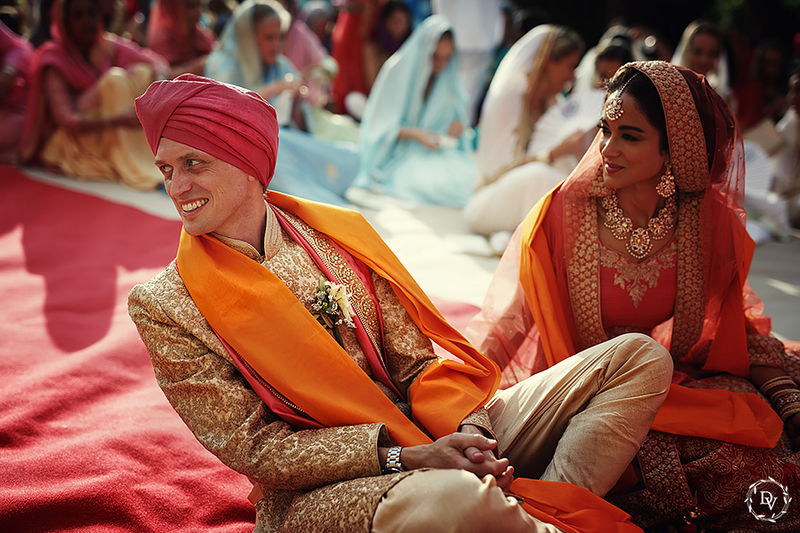 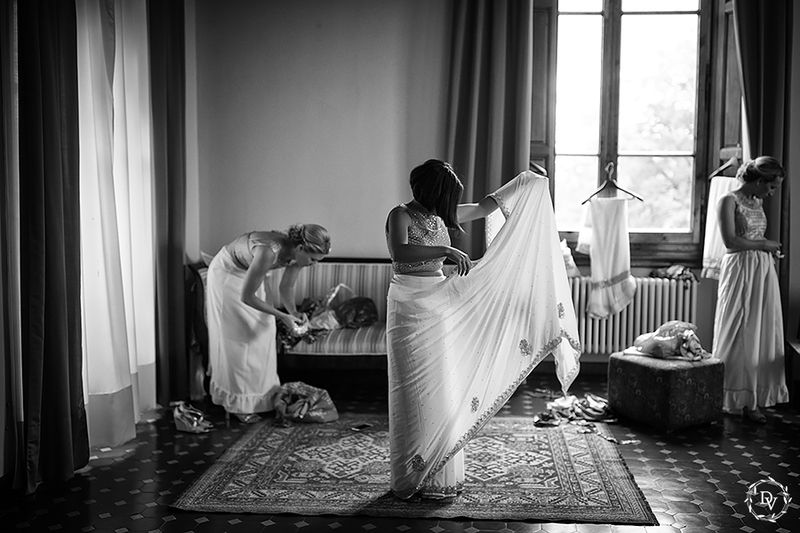 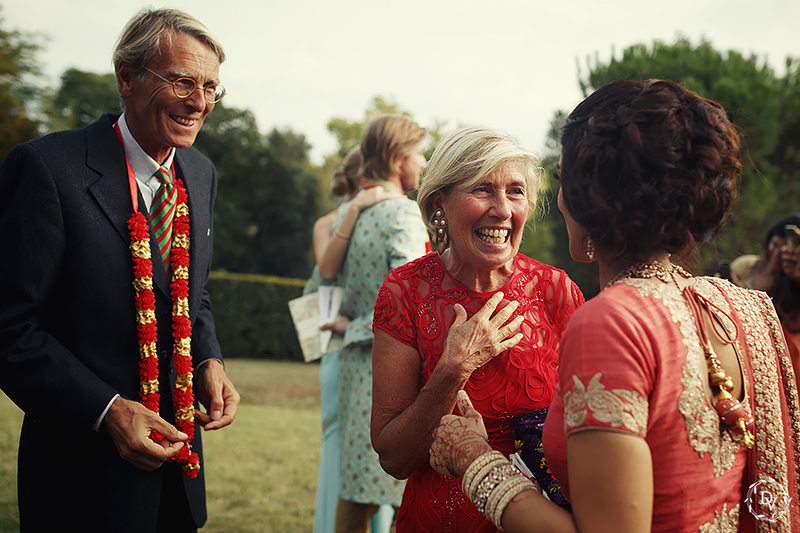 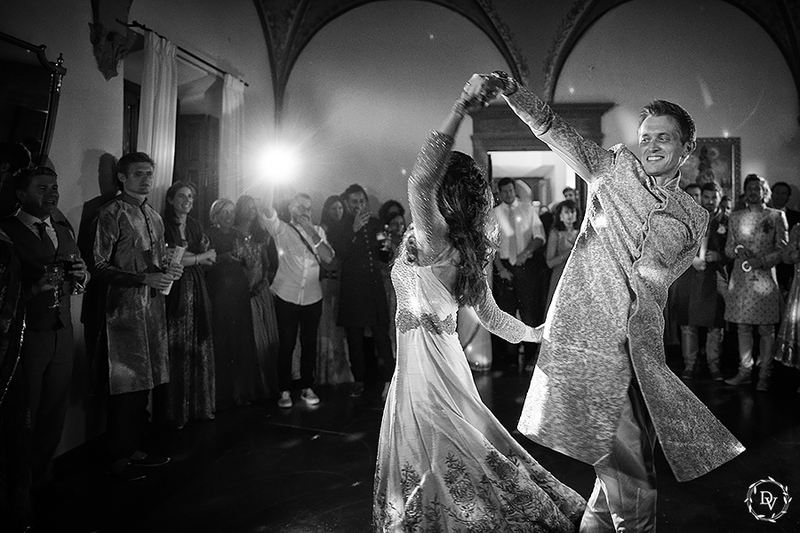 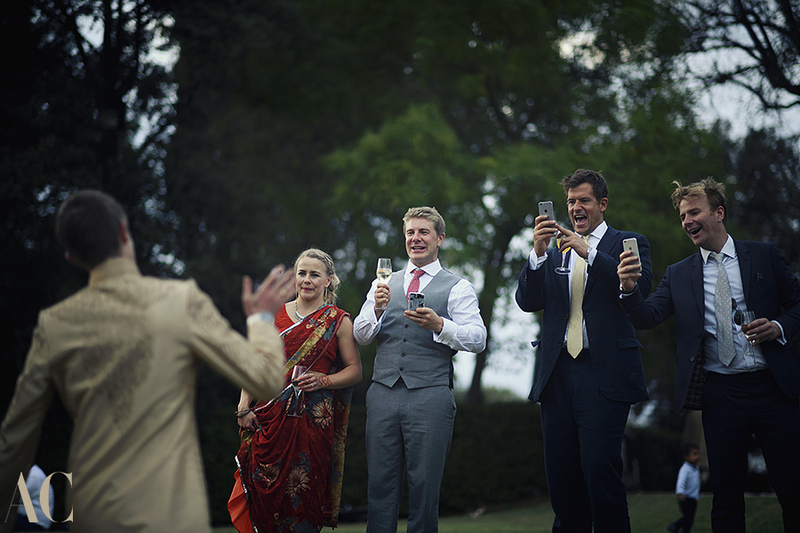 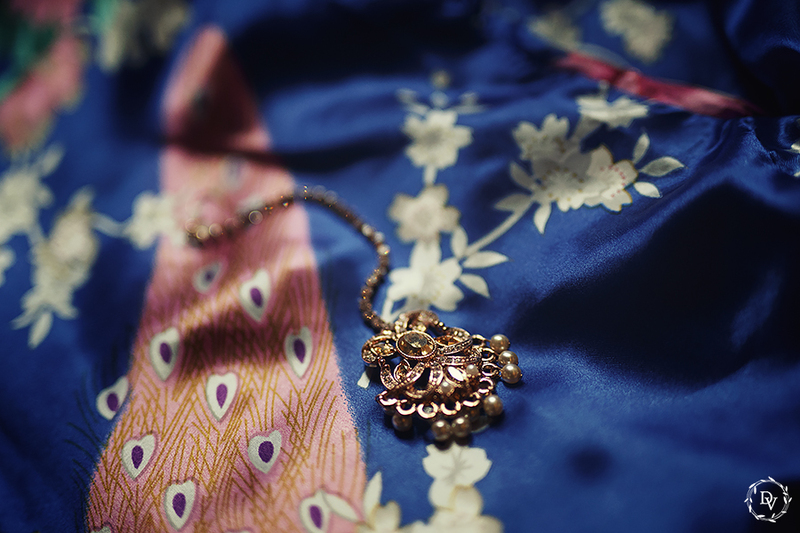 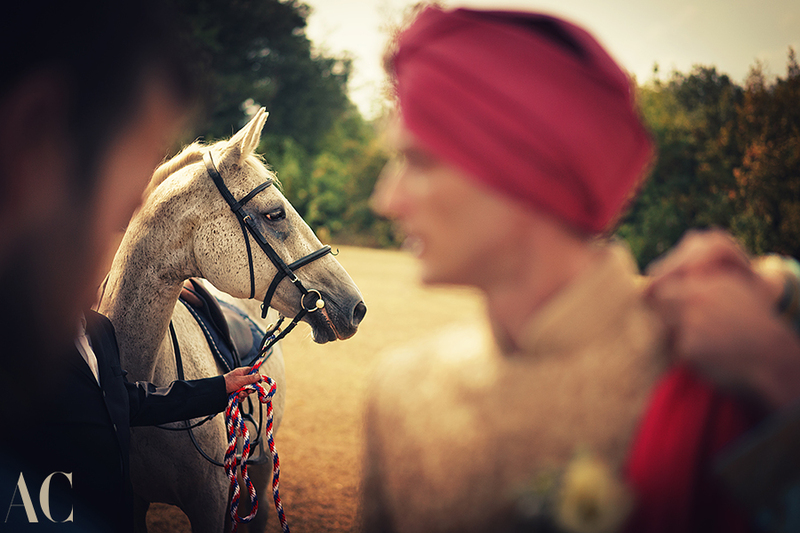 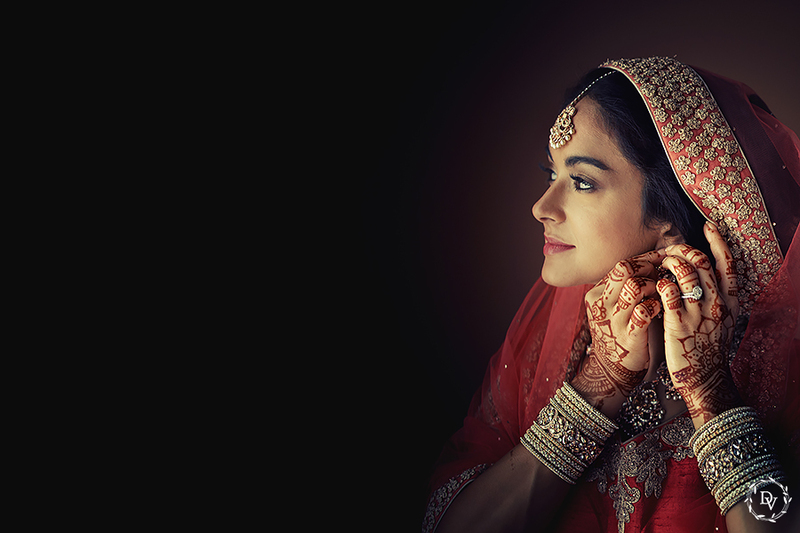 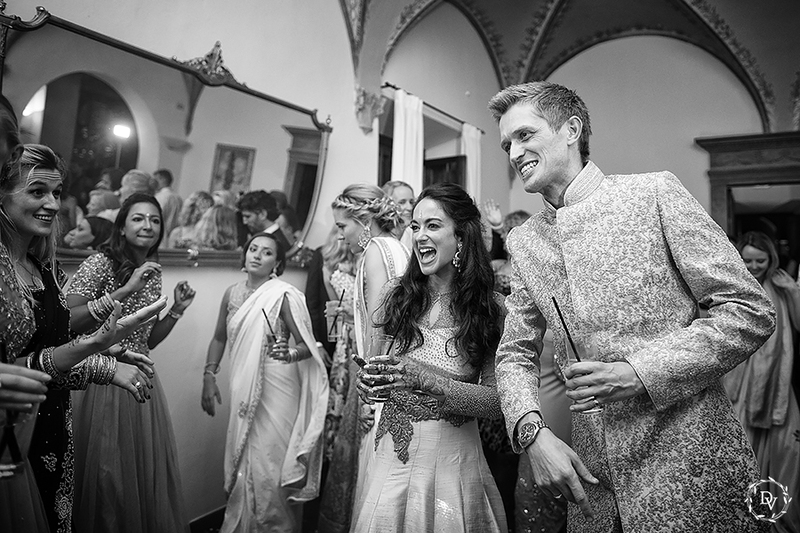 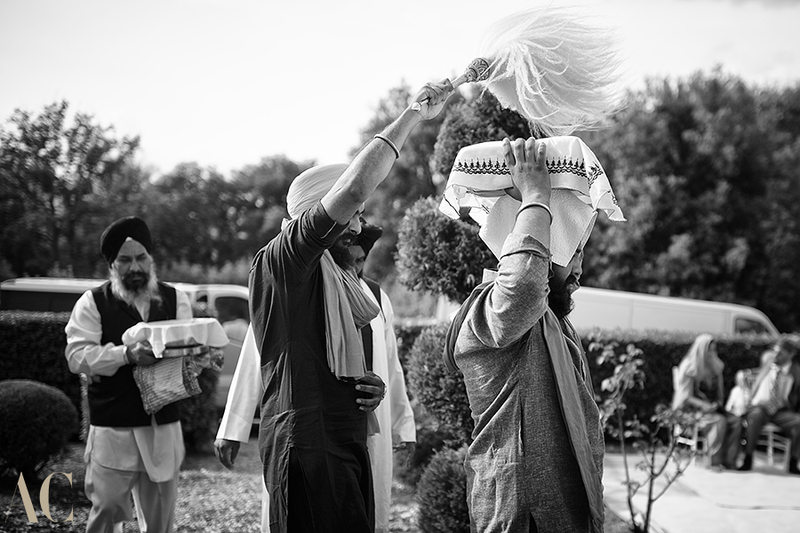 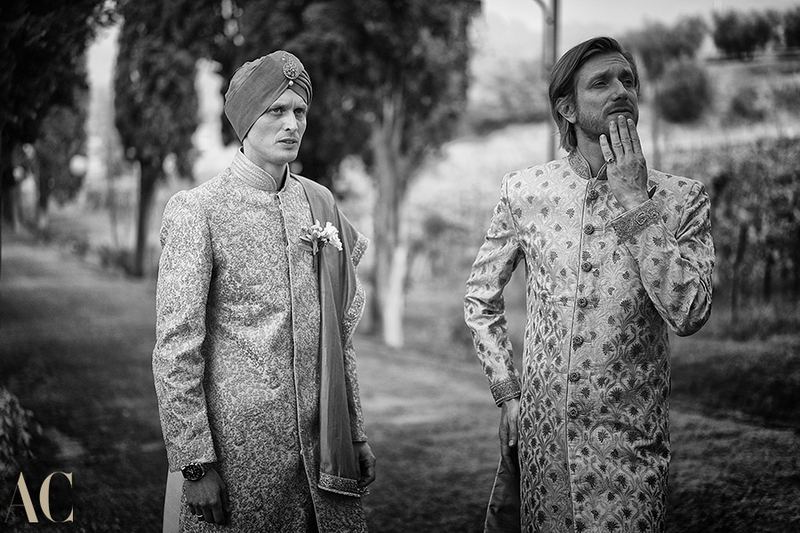 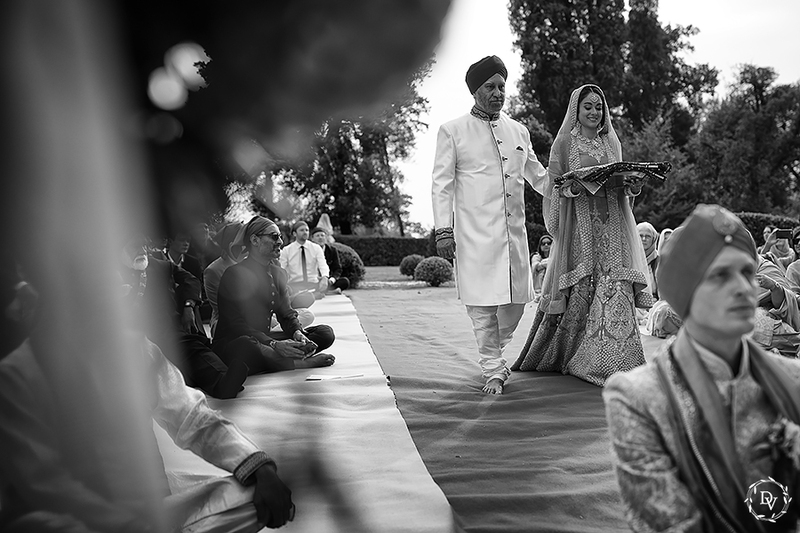 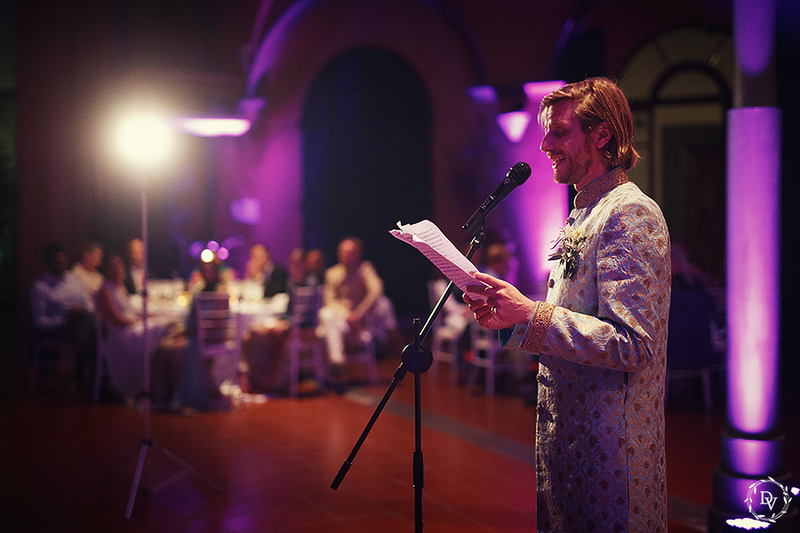 An essential part of the marriage ceremony involves joining together the bride and groom with Palla (long scarf), a symbol of bond for an everlasting relationship. 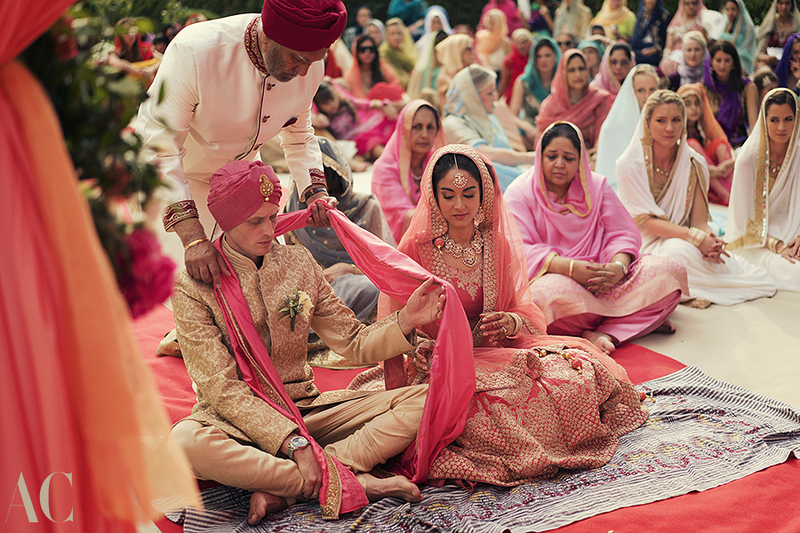 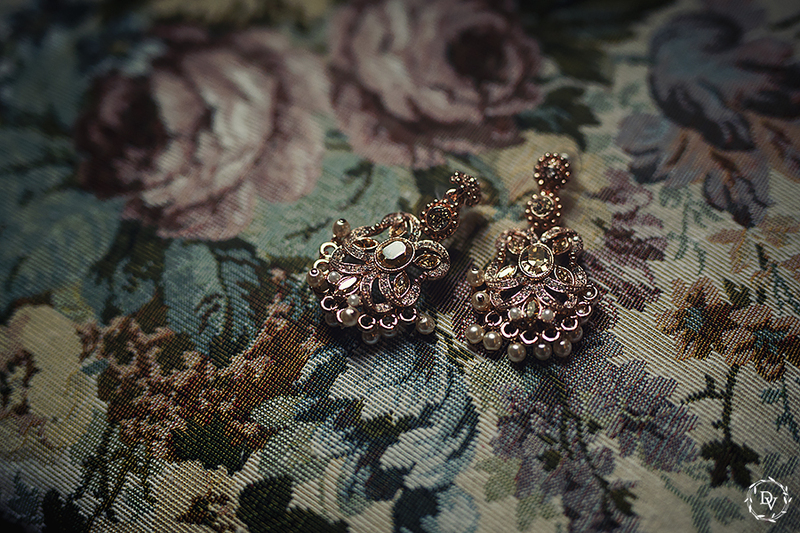 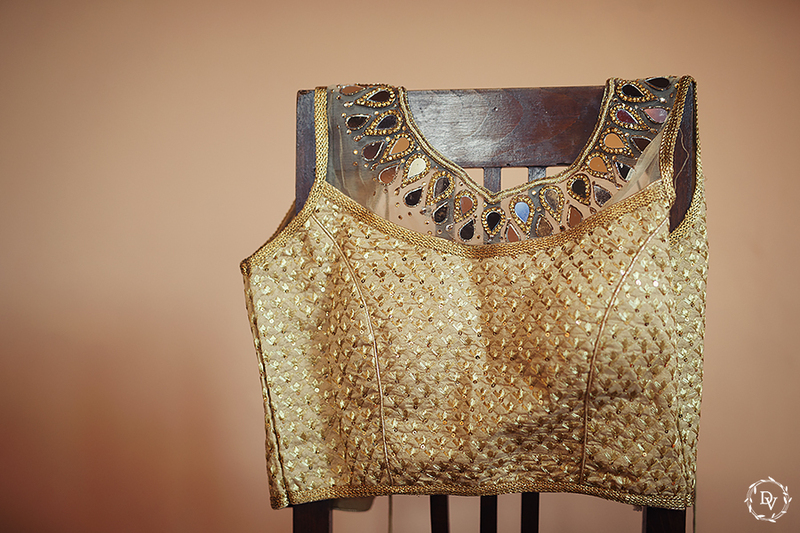 Leo arrived wearing the Palla round his shoulders, and the father of the bride draped the Palla over the groom’s shoulder and took the other end and placed it in the hands of the bride. 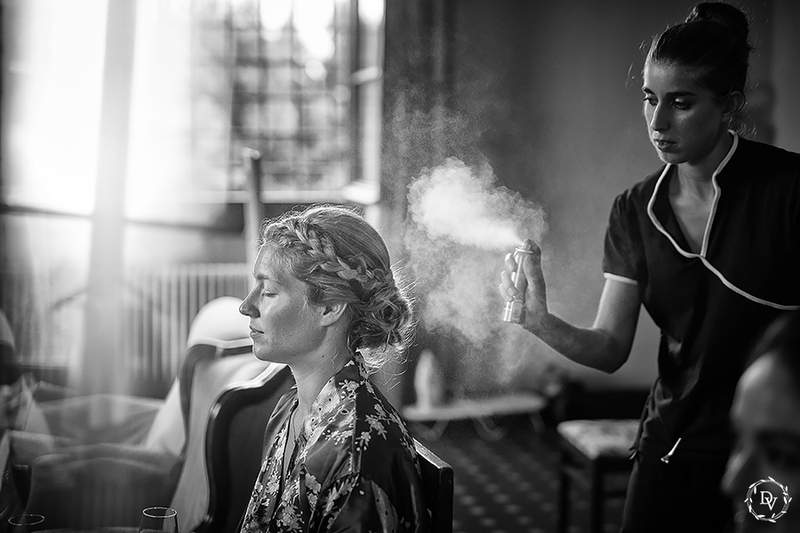 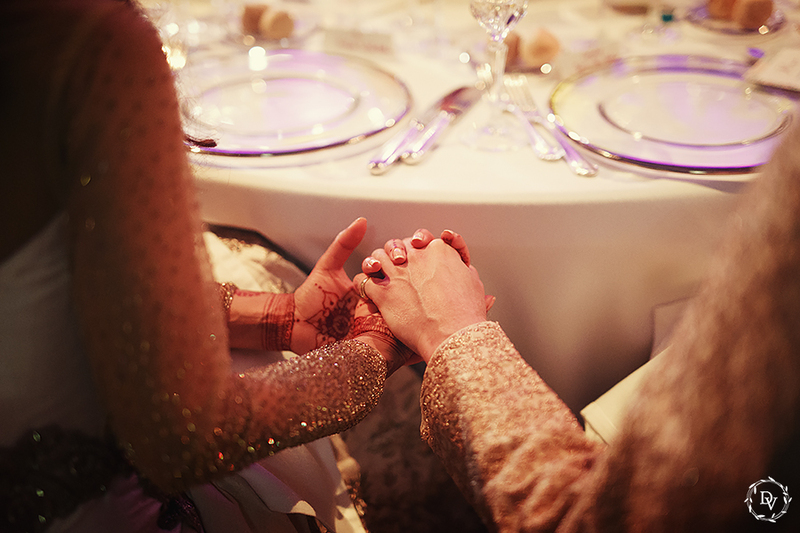 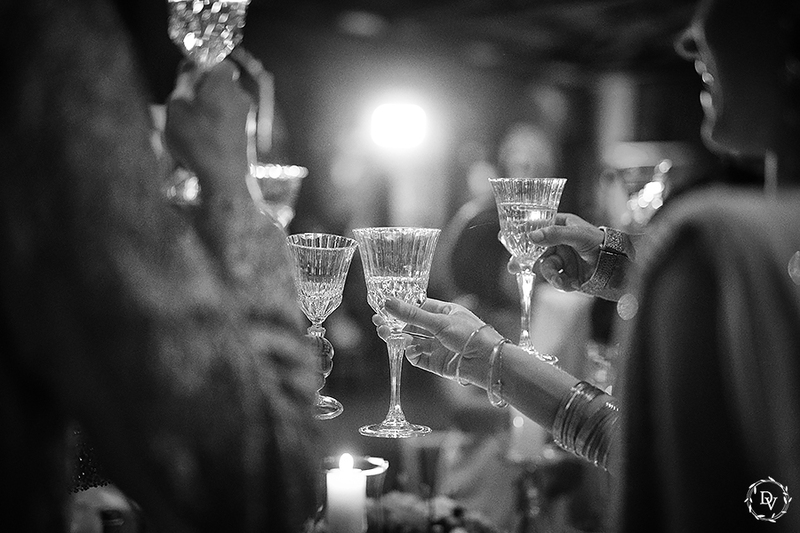 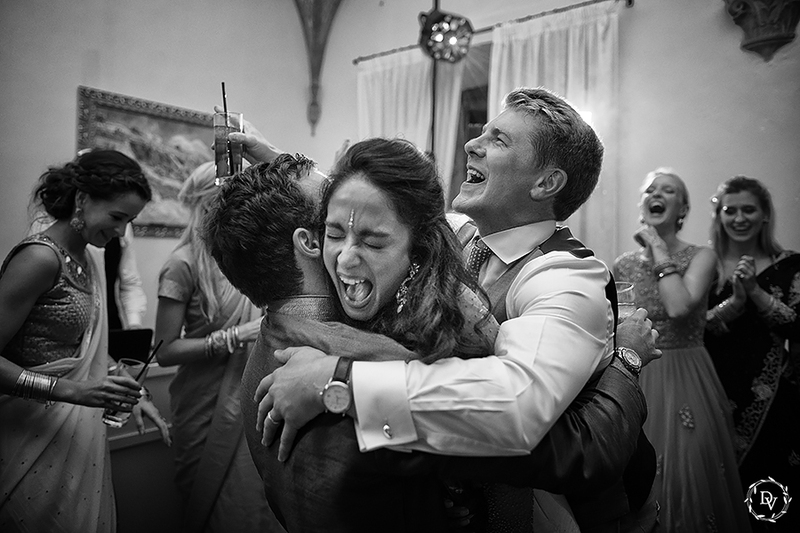 This signifies the start of the bride and groom’s relationship. 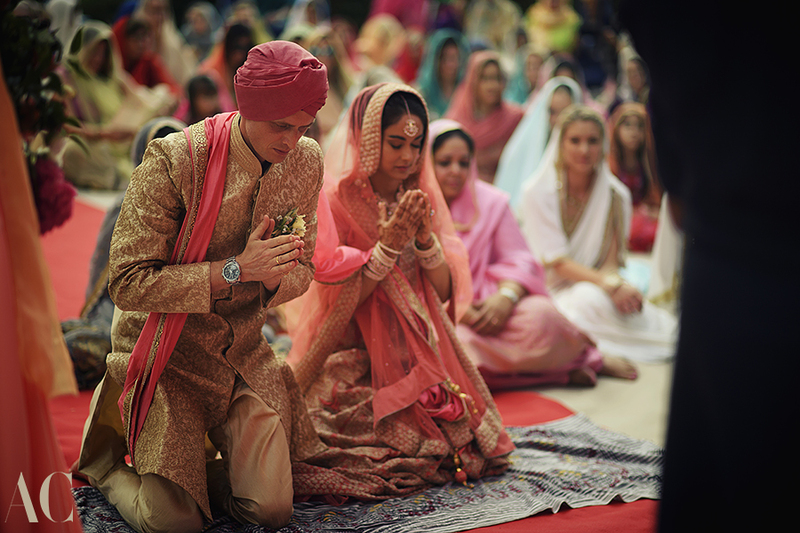 At the end of the ceremony, the entire congregation stood with hands together facing the Holy book for a final prayer for the success of the marriage. 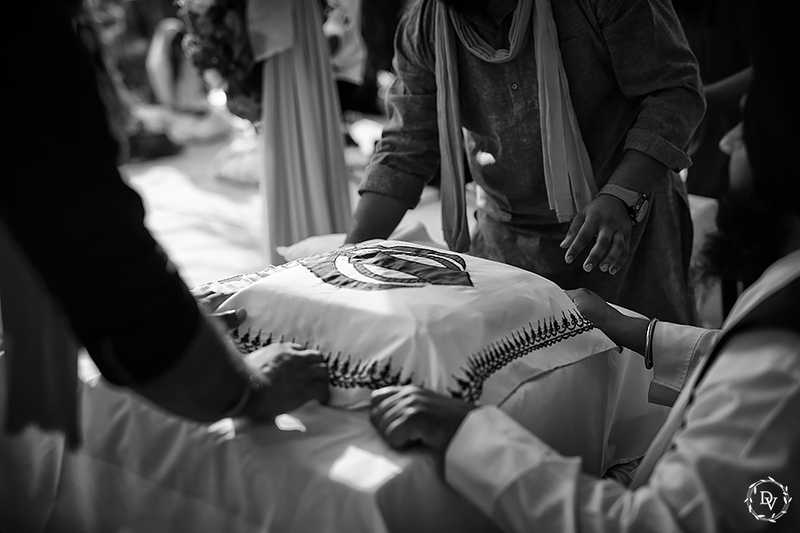 As the service ended sweet semolina was distributed to all members of the congregation. 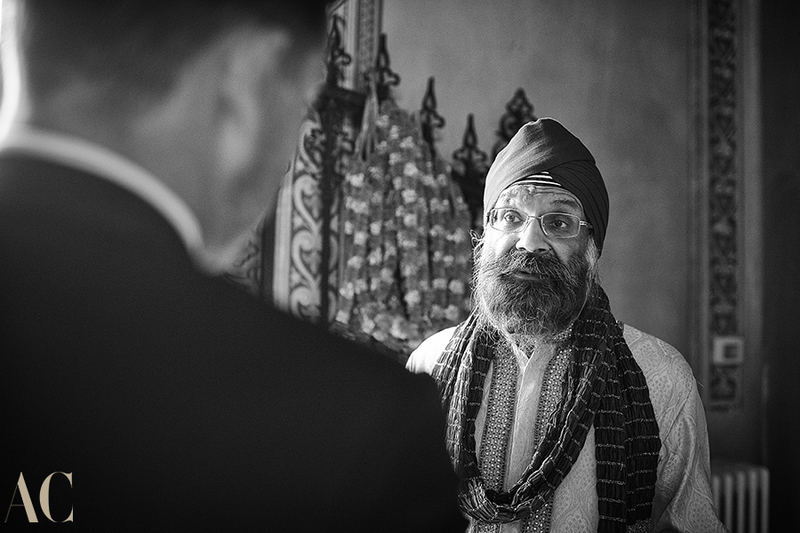 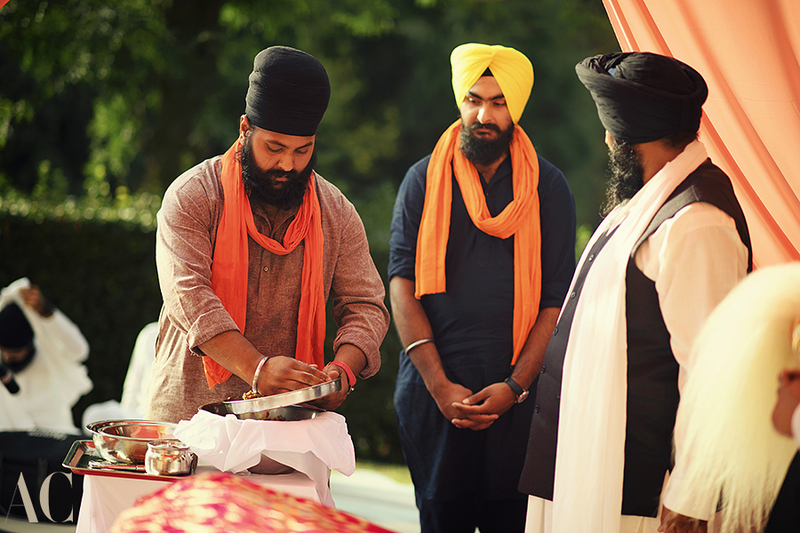 The Sikh Ceremony was really touching! 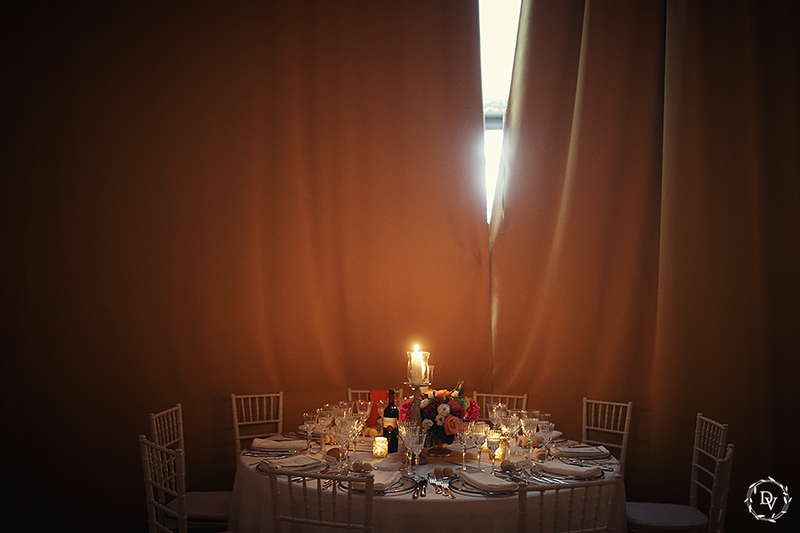 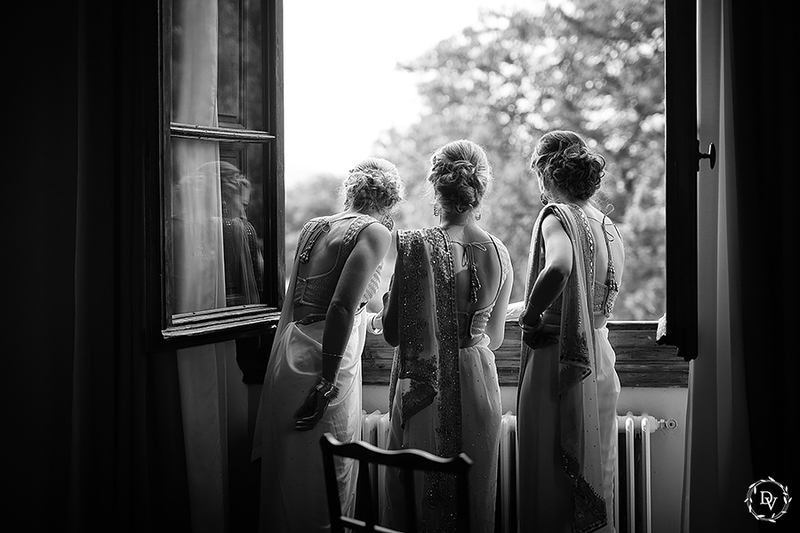 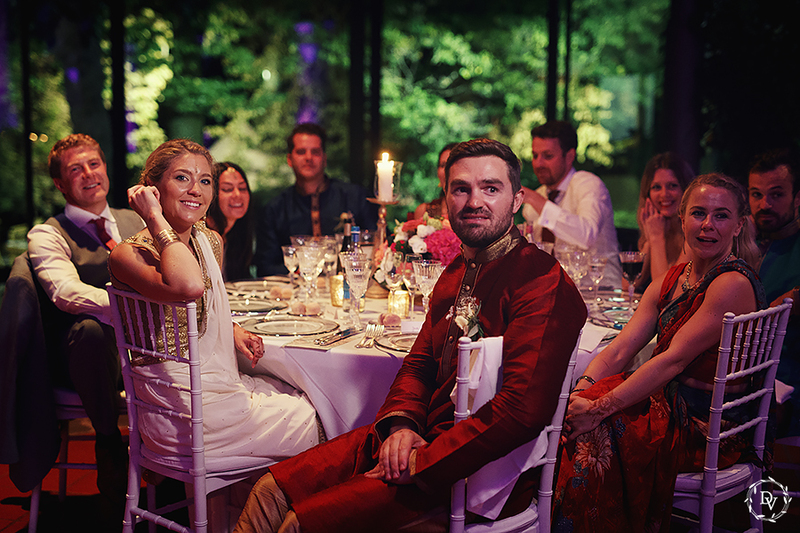 After the Ceremony guests had an Italian Aperitif in the gardens of the Villa, where they could enjoy the sunset, before moving in the Winter Garden for the Wedding Dinner. 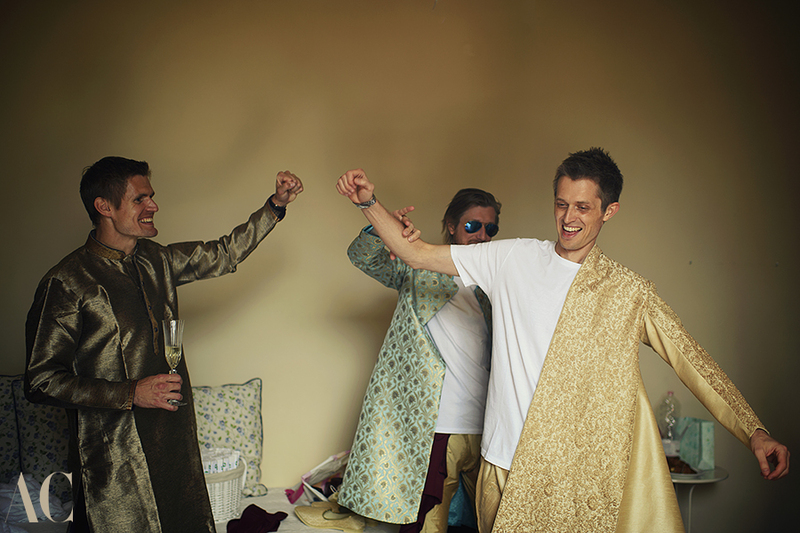 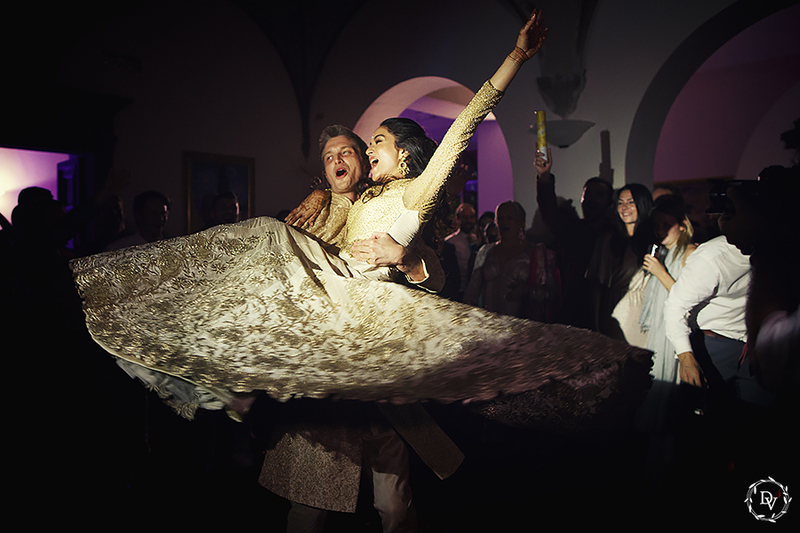 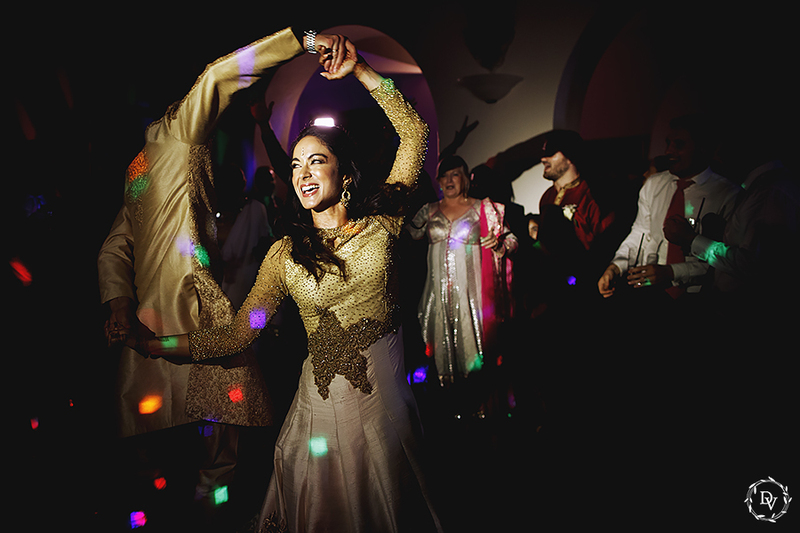 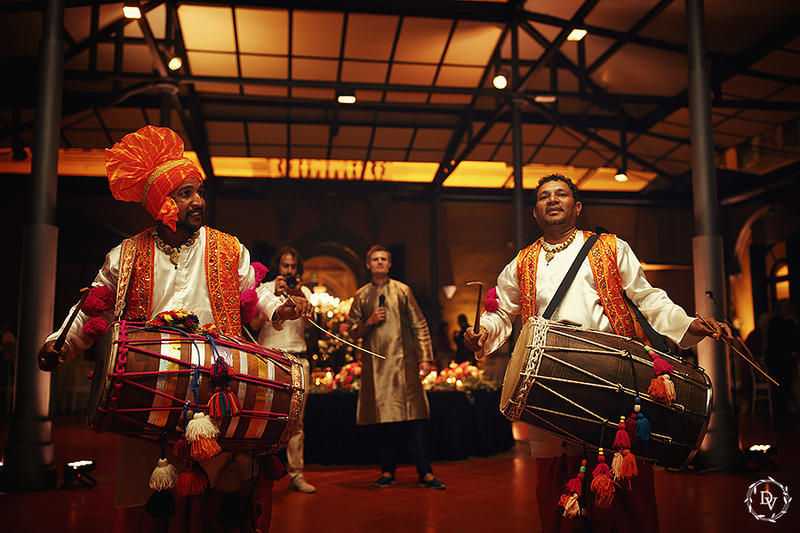 Here Bride & Groom had their great entrance, dancing on the loud and intricate sound of the dhol players. 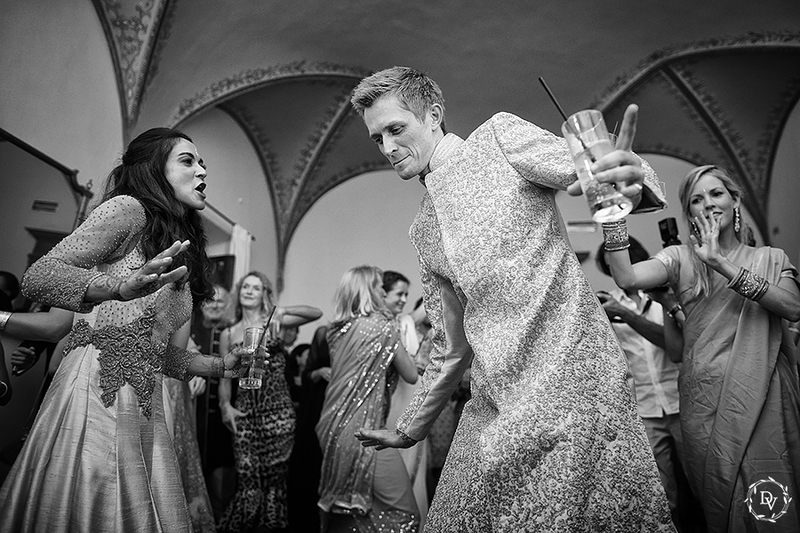 The day ended with Dj Ed Gillium who mixed Punjabi and Disco Music for a very catchy unleashed dancing party.